The original Laugerie Basse, known as l'abri Classique, was completely excavated, and the abri is now occupied by buildings, including shops, a restaurant and private dwellings. 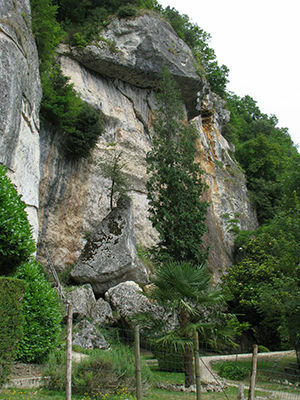 This shows the present walk up to the Laugerie Basse area, with l'abri Classique on the left screened by trees, and l'abri des Marseilles on the right, with the distinctive 'cap' of overhanging stone. 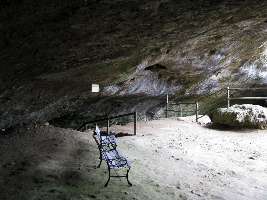 La grotte du Grand Roc, never used by humans, is also accessed via this walkway, and is out of frame to the left of this photo. L'abri des Marseilles, 50 metres from l'abri Classique, is also often referred to as Laugerie Basse, and is the abri which visitors to the Laugerie Basse site are able to inspect. This map of the area shows clearly how the two abris are related. 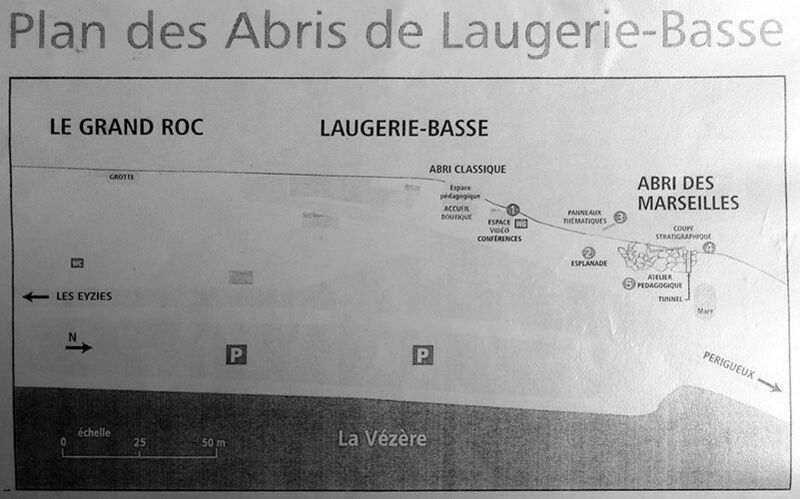 Source: English language handout for the tour of 'Laugerie Basse', in fact of l'abri des Marseilles. Laugerie-Basse, l'abri des Marseilles, upper section. Laugerie Basse is an abri, a rock shelter rather than a cave, on the right bank of the Vézère River, across the bridge from the small tourist town of Les Eyzies. 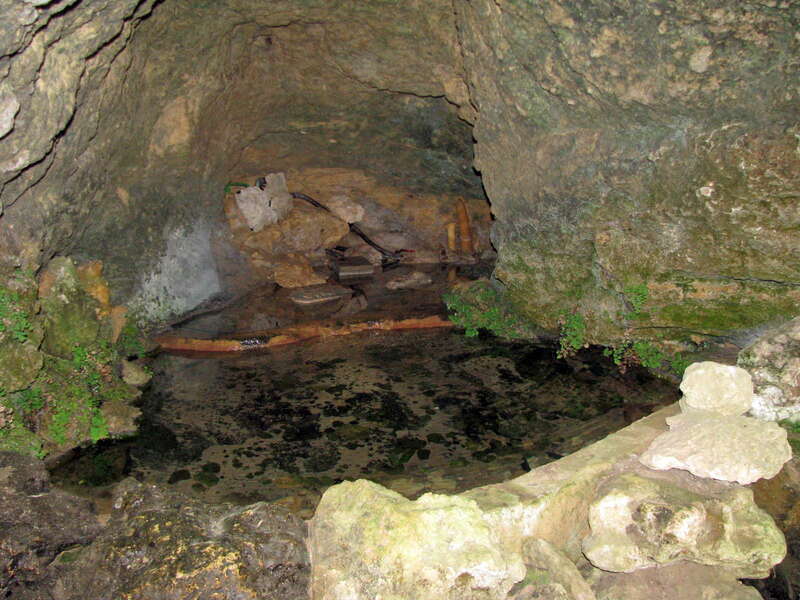 Laugerie Basse is about fifteen metres deep and fifty metres long. The site is made of two rockshelters: the Abri des Marseilles and the Abri classique. 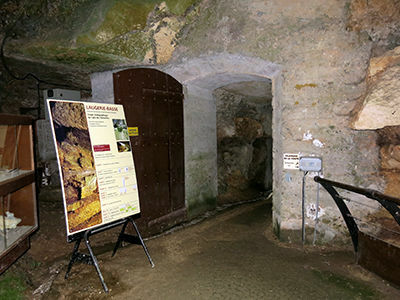 Between the Grand Roc cave and the Abri is the museum displaying general information about mobile art. Videos about geology, archeology, the way of life and symbolic expression are available. 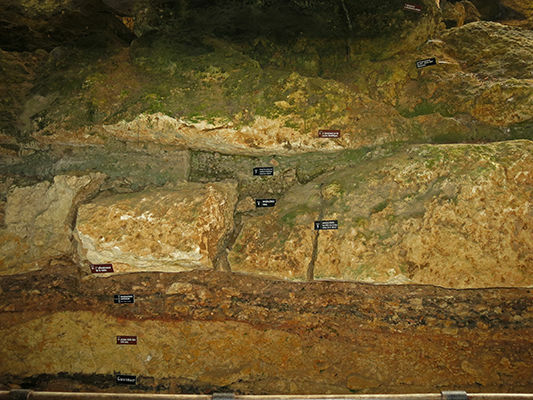 The excavations carried out during the 1860s by Edouard Lartet did not accurately record the stratigraphy of the site. 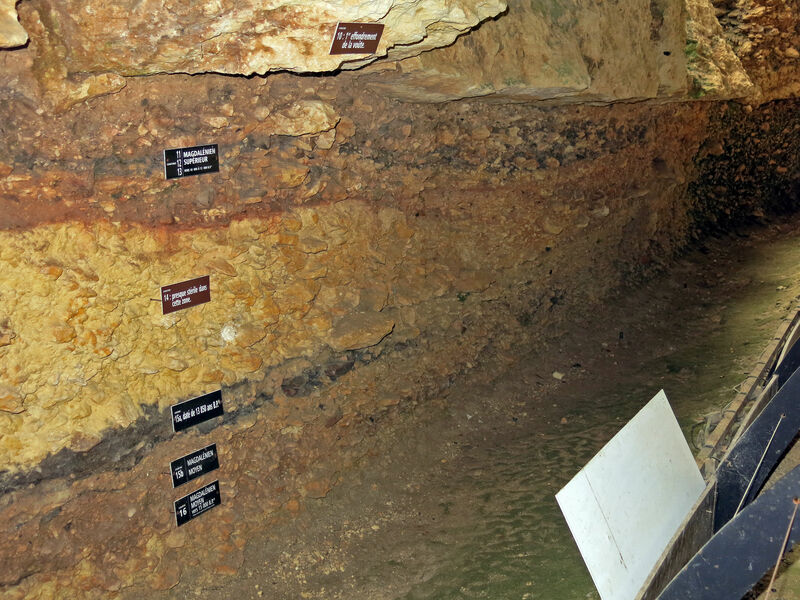 The stratigraphy was not established until around the First World War. There are four Magdalenian phases, III, IV, V, VI, during the Würm IV, represented in this site. The Laugerie Basse Venus, 'Venus Impudique' (Immodest Venus) was discovered in 1864 by the Marquis Paul de Vibraye. It was the first Venus figure found in France. Laugerie Basse (that is, l'abri Classique, shown in this photo) is about fifteen metres deep and fifty metres long. 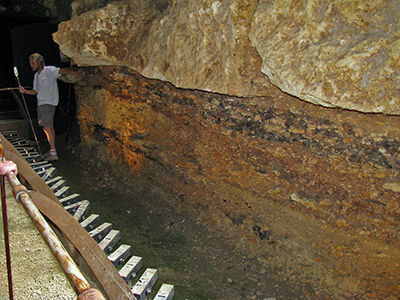 The excavations carried out during the 1860s by Edouard Lartet did not accurately record the stratigraphy of the site. The stratigraphy was not established until around the First World War, at which time it was completely excavated down to bedrock. 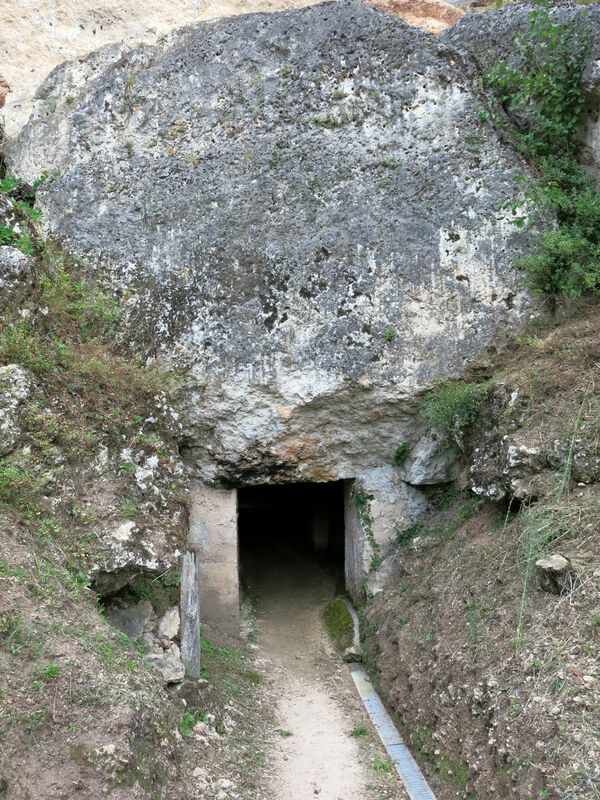 There are four Magdalenian phases, III, IV, V, VI, during the Würm IV, represented in this site. Text: translated and adapted from Wikipedia. 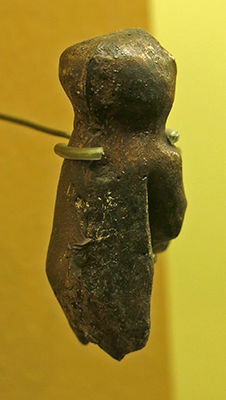 This was the first Venus figure found in France. Left to right: Awl, engraved awl, eyed needle. 46: Sagaie gravée, engraved spearpoint, without a bevel or fork. 47: Sagaie à base simple, spearpoint without a bevel or fork. 48, 52 and 54: Sagaie à biseau simple, spearpoint with a single bevel to attach it to the spear shaft. 49: Sagaie à base fourchue, spearpoint with a forked base. 50: Sagaie à biseau double, spearpoint with a double bevelled base. 51: Harpon, single sided harpoon. 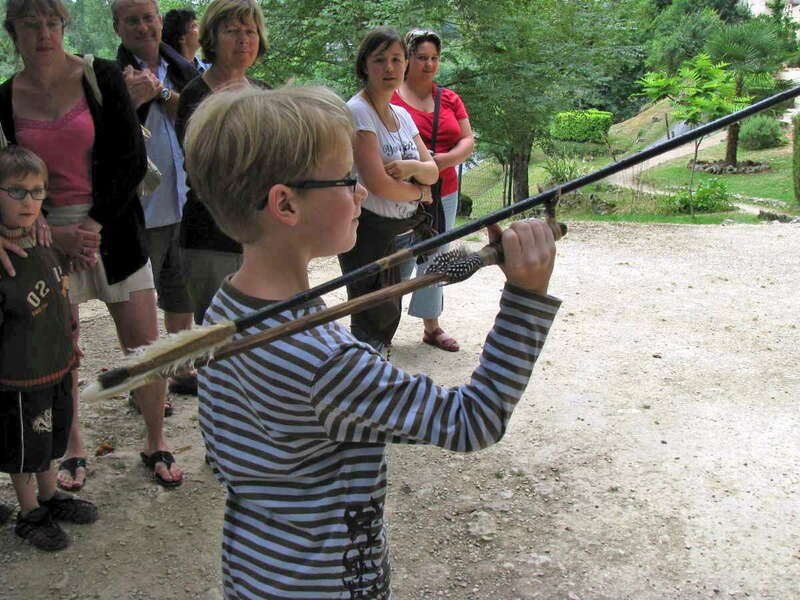 53 and 55: Sagaie de Lussac-Angles, this spear tip is of the Lussac-Angles type. These are from the Middle Magdalenian, and are rather short and wide to lanceolate, on a single bevel, sharp at the distal end, with a long unstriated bevel, always on the upper side, and a groove frequently on the underside, facing the viewer in this case. 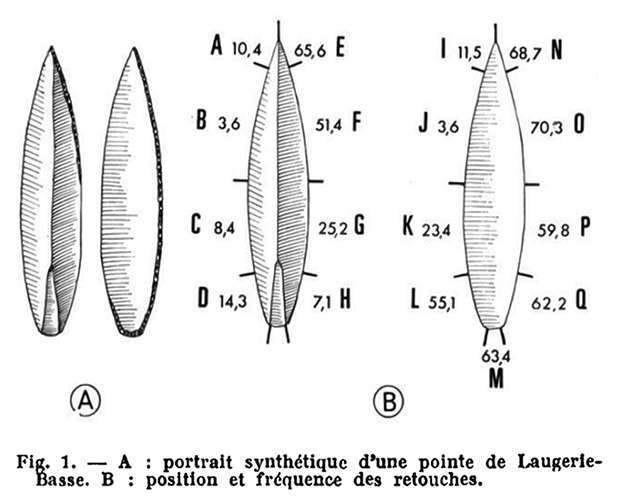 56 and 57: Fléchette, fléchettes are leaf-shaped points characterised by short, semi-abrupt retouch, sometimes inverse, at one or both extremities of the blade blank, extending sometimes along one or both margins. 58 and 59: Pointe de Laugerie-Basse. Note that there are two very different points given this name, see below. 60 and 61: Lamelle à dos, small backed blade. 62: Lamelle denticulée, small toothed blade. 63: Lissoir, polisher used to stretch hides in the tanning process. 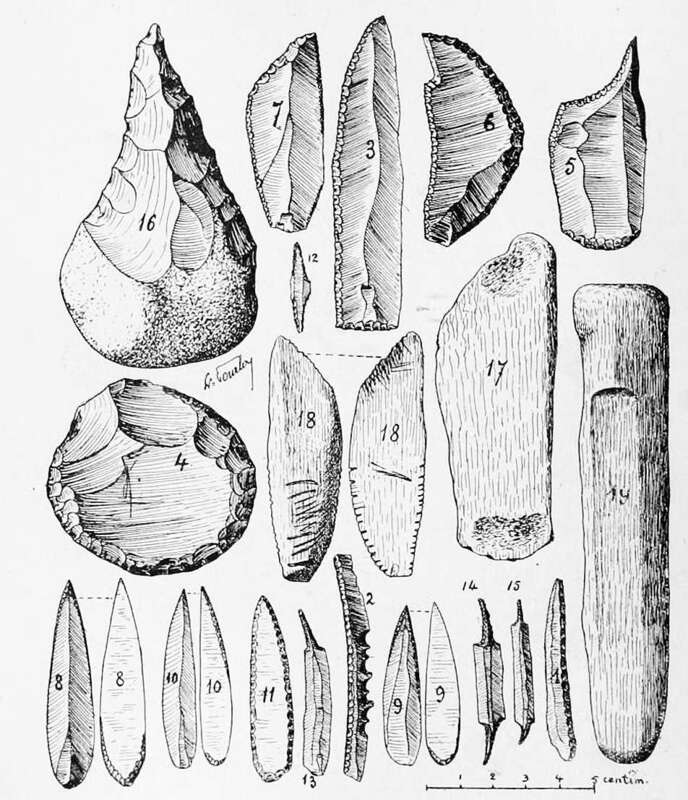 64: Ciseau, 'chisel' or wedge. The Laugerie-Basse point has a particular shape and method of retouch which makes it quite unique. 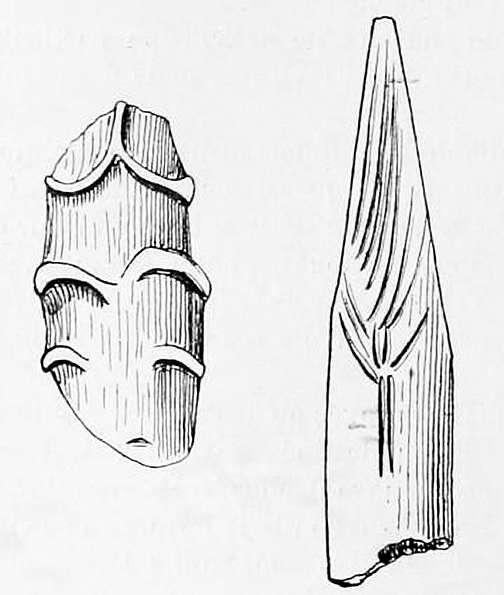 Leftmost pair of artefacts: Perçoir, drill. Centre left: Perçoir double, drill at each end of the tool. Next two artefacts: Grattoir-burin, scraper-burin. 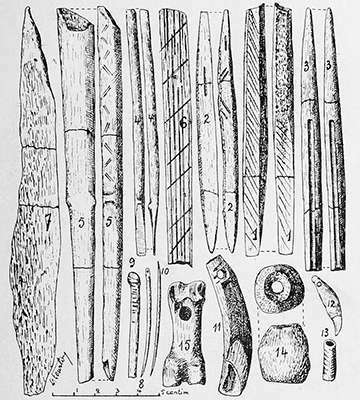 Far right: Bec double, a tool with two usable drill points, or a 'double beaked' tool. 71 to 74: Grattoir, scraper. 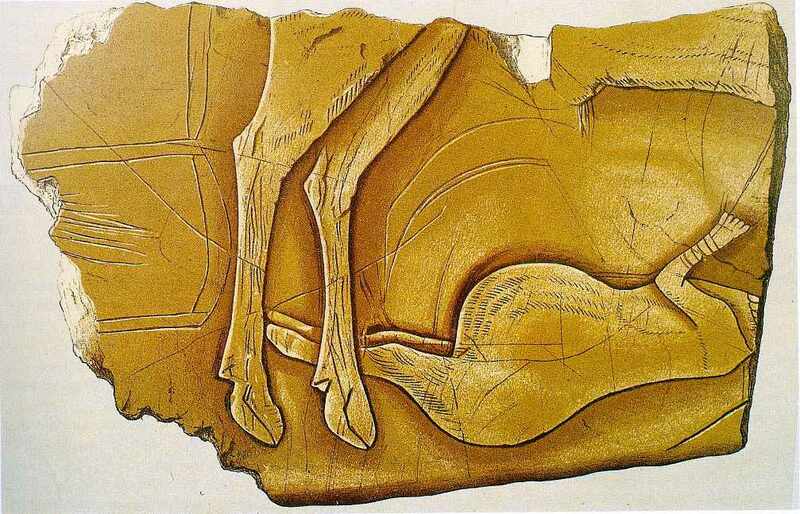 Gravure figurant au recto une femme couchée entre les pattes d'un renne et au verso un cheval, moulage, bois de renne. Engraved on the front, a woman lying between the legs of a reindeer, with a horse engraved on the back. Femme au renne. Fragment d'omoplate de bovidé. Sur la face représentée, une femme est couchée sur le dos, manifestement enceinte et proche du terme, sous ou en arrière d'un cervidé mâle dont les membres postérieurs sont figurés en avant des jambes de la femme. La femme est parée de bracelets et semble porter un collier. Longueur 100 mm. Lithographie de J. Pilloy publiée en 1907 dans "L'art à l'époque du renne d'E. Piette. L'original est conservé au musée des Antiquités nationales. Woman with reindeer. 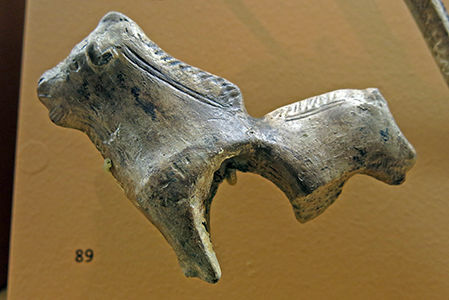 Fragment of a bovine scapula. 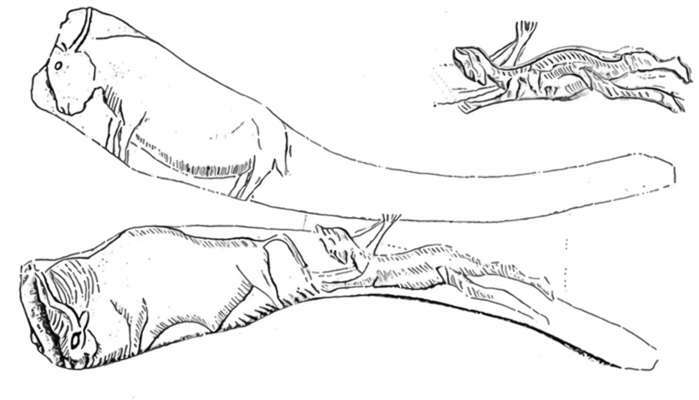 A woman is shown lying on her back, obviously pregnant and close to term, under or behind a male cervid whose rear limbs are illustrated in front of the legs of the woman. The woman is adorned with bracelets and seems to wear a collar. Length 100 mm. Lithographie de J. Pilloy publiée en 1907 dans "L'art à l'époque du renne d'E. Piette. L'original est conservé au musée des Antiquités nationales. The lines on the woman's belly may be stretch marks. 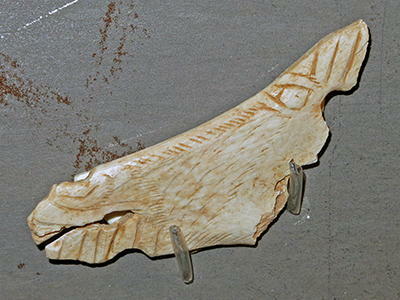 Small animal carved in reindeer antler. Note the small hole in the chin, presumably so that the figurine could be used as a pendant. Female deer (hirsch an euter), with coloured incrustation. 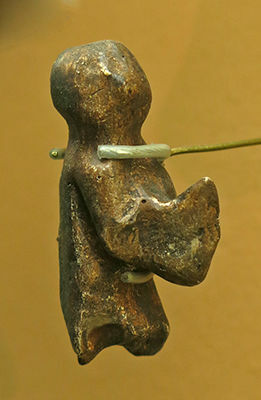 Spear thrower with a sculpture of a deer. 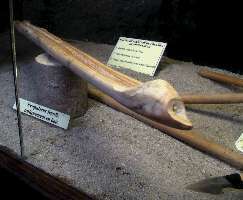 Fish sculpted in reindeer antler. 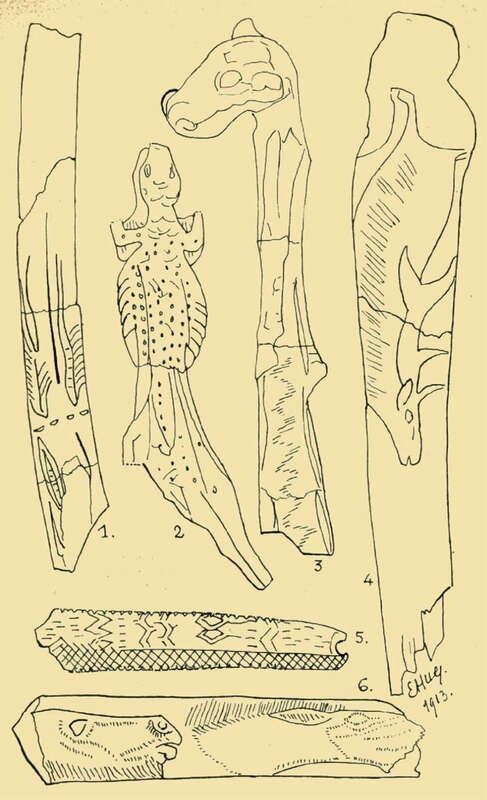 Fish engraved on a rib bone, Laugerie Basse. The fish is possibly a pike. Pikes have the elongated, torpedo-like form of predatory fishes, with sharply pointed heads and sharp teeth. Their coloration is typically grey-green with a mottled or spotted appearance with stripes along their backs, providing camouflage among weeds. Individual pike marking patterns are unique, like fingerprints. Pike can grow to a maximum recorded length of 183 cm (6 ft 0 in), reaching a maximum recorded weight of 35 kg (77 lb). 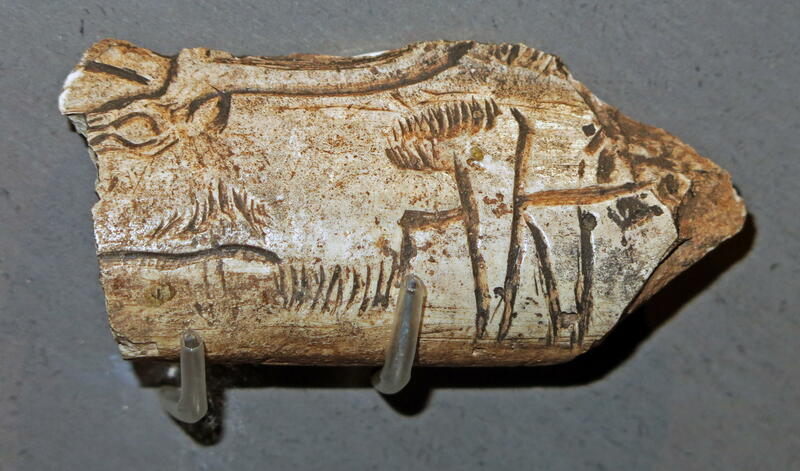 Carving of what appears to be one aurochs behind another, on deer antler, Magdelanian. 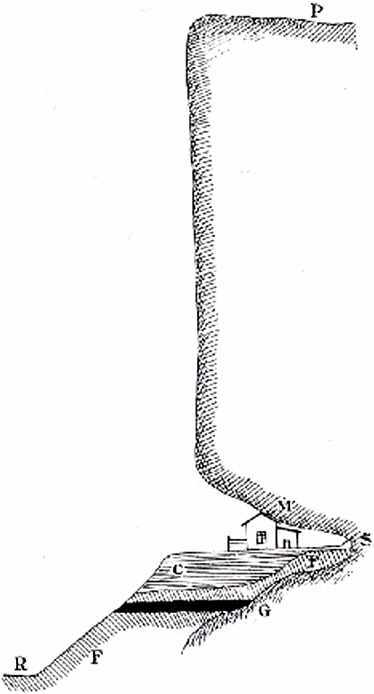 This is a common depiction, and shows the 'low stretch display' used by a bull approaching a cow in the rutting season. 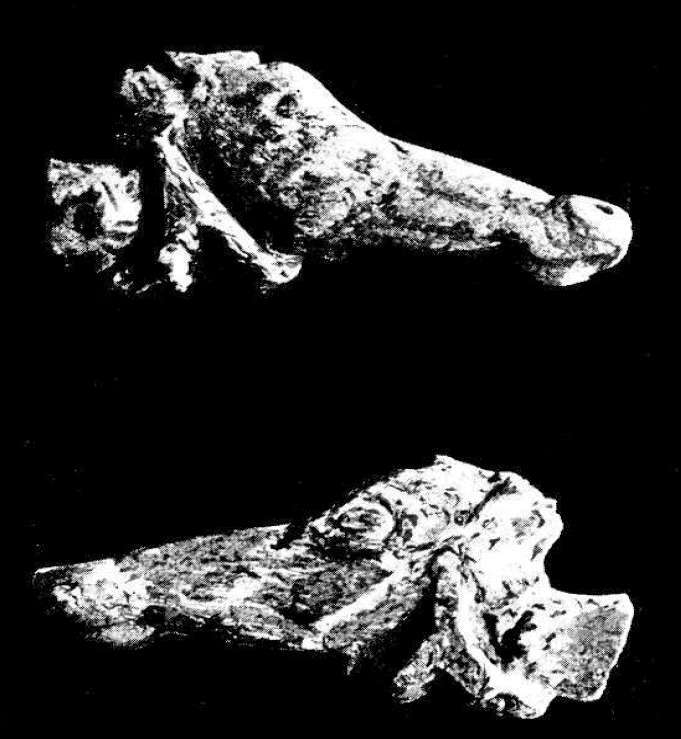 Fragment of a scapula, showing a superb horse head and neck, with indications of the mane, front and back legs, and a tail. 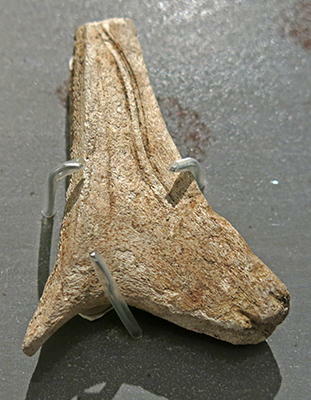 Fragment of bone from Laugerie Basse, Magdalenian. There appear to be at least two animals depicted here, one of which may be a horse. The Venus of Laugerie Basse - the Supplicant. 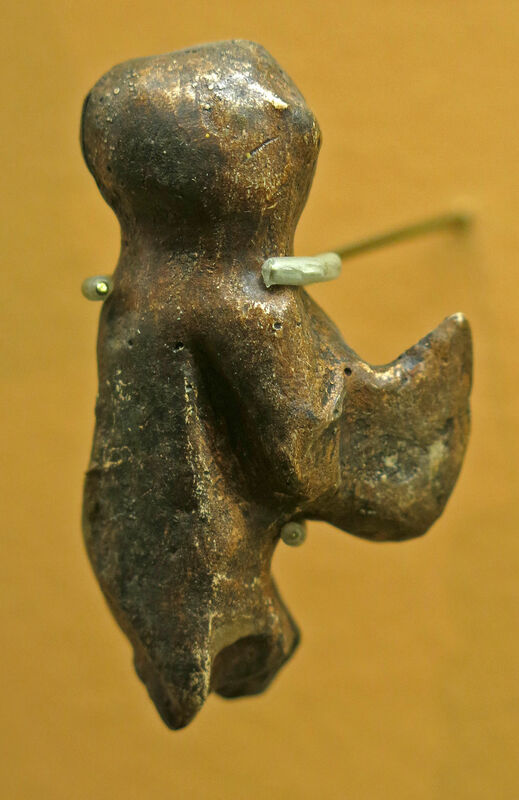 This venus is a tiny, broken, crudely carved statuette of reindeer antler, 44 millimetres long, depicting a faceless human bent forward as though in supplication, with arms raised as if in prayer or adoration. Disc cut out and engraved, in bone. Baton carved with the likeness of an ibex. (right) Épingle en os sculptée. 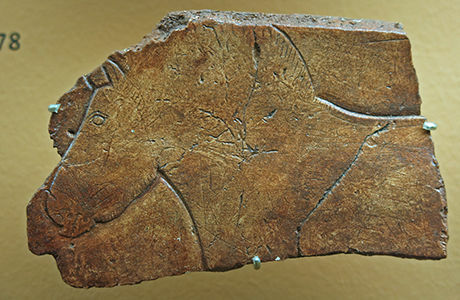 Spear straightener carved with two bisons. 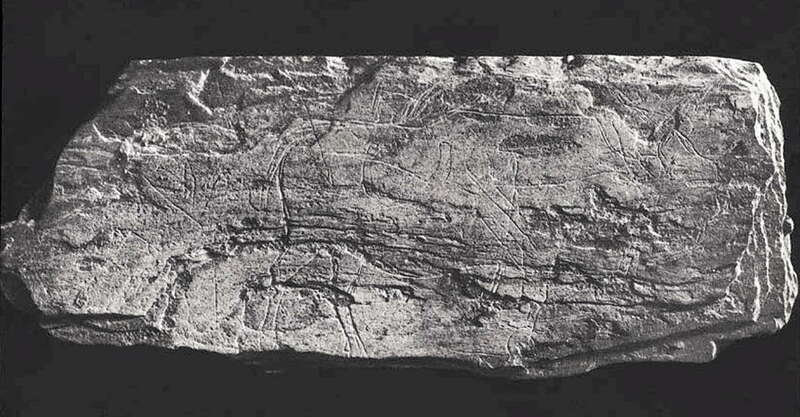 A rod (or spear point) originally engraved with a line of eight horses. 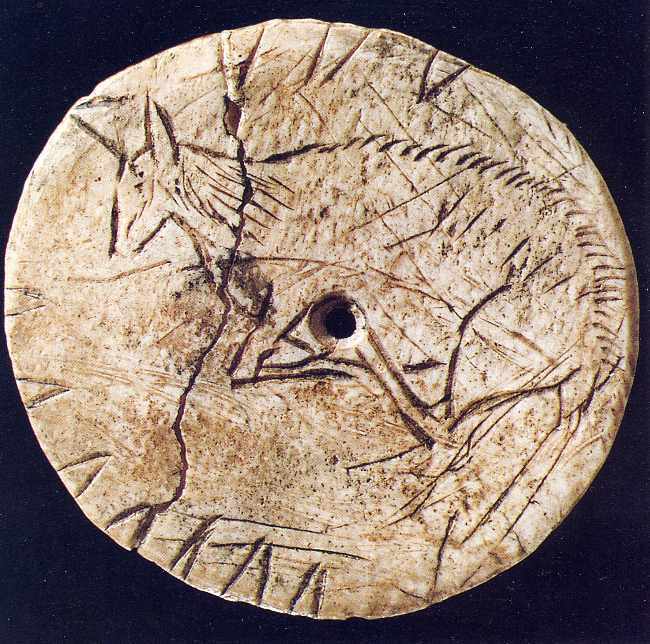 Engraved pendant in bone. Note the unusual decoration, evoking plant life. Red ochre, probably haematite, and a godet, or small cup for grinding ochre. 3: Molette (pestle), a tool used for grinding manual pigments to manufacture the paint . It serves both to reduce the powder pigments and disperse these pigments in their binder. Les Marseilles, Laugerie Basse. 4: Blocks of ochres. Les Marseilles, Laugerie Basse. 5: Block of haematite, Font de Gaume. 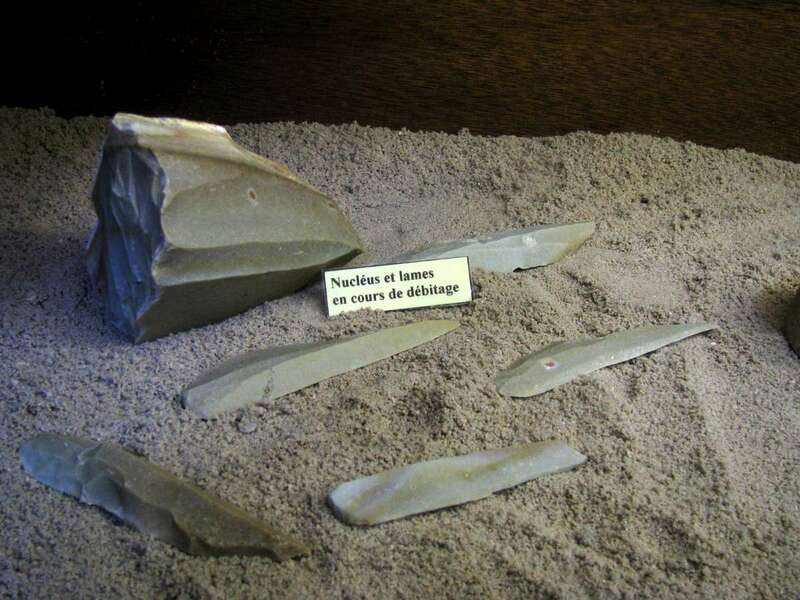 Late Magdalenian saws from the Dordogne. Both items were found at Laugerie Basse, a large rockshelter on the right bank of the Vézère River at Les Eyzies with middle, upper and late Magdalenian layers. 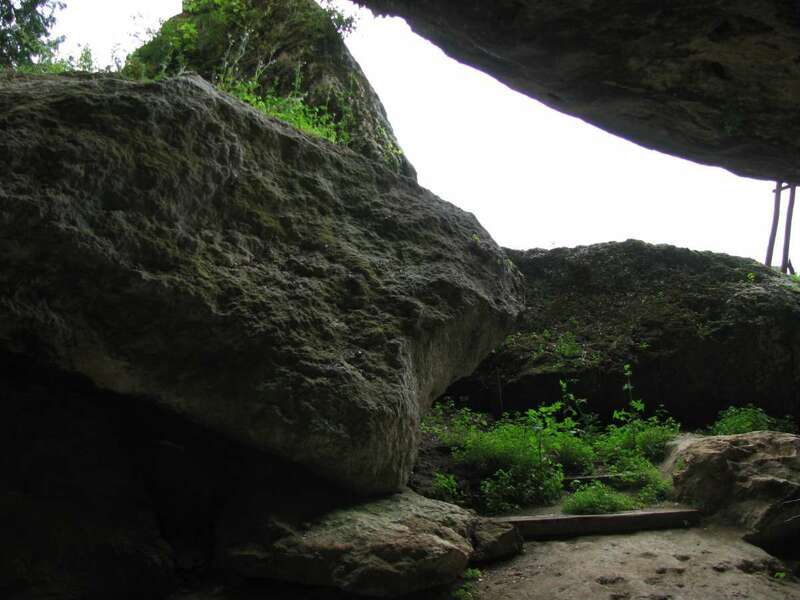 Laugerie Basse was one of the first rock shelters that was excavated by Lartet and Christy in 1863 and by Marquis de Vibraye, working independently in 1864. Dimensions: The saws are 37 x 5 x 2 mm and 20 x 3 x 1 mm respectively. 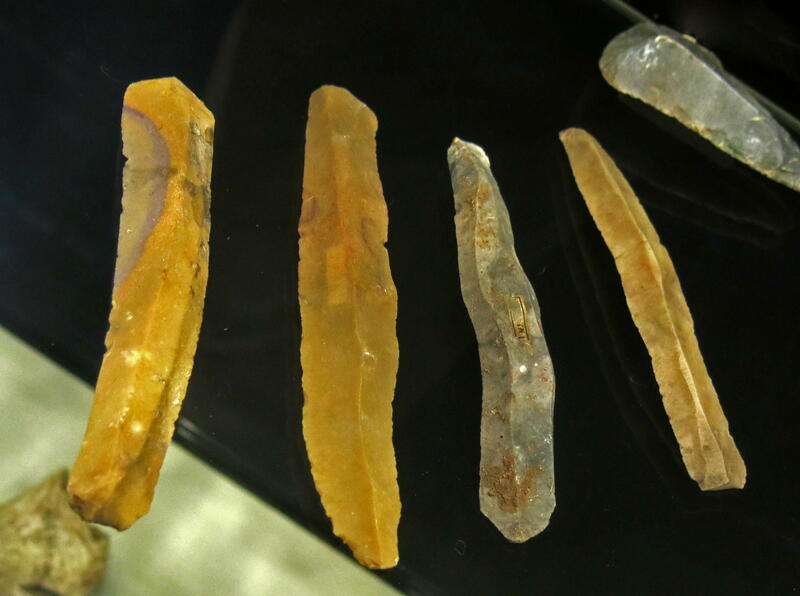 Microlithic saws appear first in the Pavlovian of southern Moravia (Pavlov I, Dolni Vestonice and Jarosov II) and in the Wachau region at the middle Danube near Vienna (Krems-Wachtberg 1930 excavations and new excavations during recent years, Krems Hundsteig including Kesseldorfers findings in the late 19th century, and new excavations). 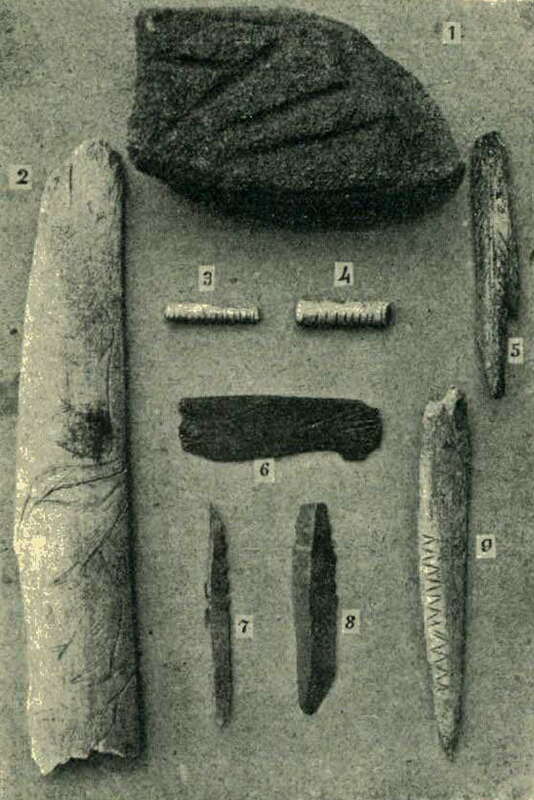 These implements are also present in the late Magdalenian in S/W-France (Laugerie Basse) and further south (Bruniquel, Duruthy). 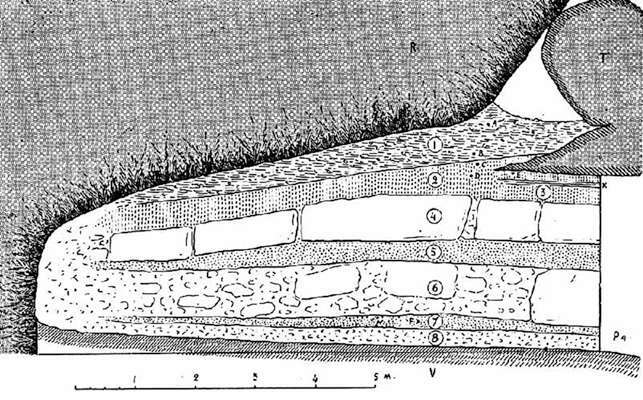 Denticulated bladelets are known from the north African Epipaleolithic, but their denticulation is often bilateral and more restricted. In the Neolithic of Northern and East Europe and the Bronze Age, fine denticulation on silex sickles became very important. 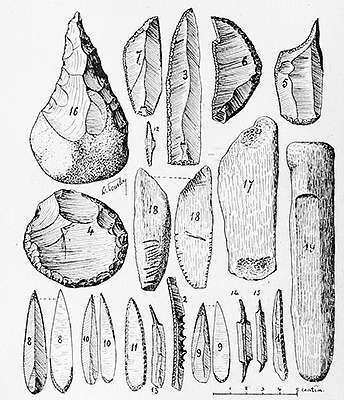 Paleolithic saws were recognised as early as 1863 by Lartet and Christy but their function remains essentially unknown. Traceologic investigations (the study of wear marks) are not available for Magdalenian saws and indeterminate results have recently been described for the Pavlov samples by Andra Sajnerova. Well made blades from Laugerie Basse. On the way to the abri, which is open all year, this interesting recreation of a shelter using a dry stone wall technique and thatching appears. Entering the Abri. The ladder to the hole in the cliff used by a watchman can be seen to the right of the entrance, see the image below. 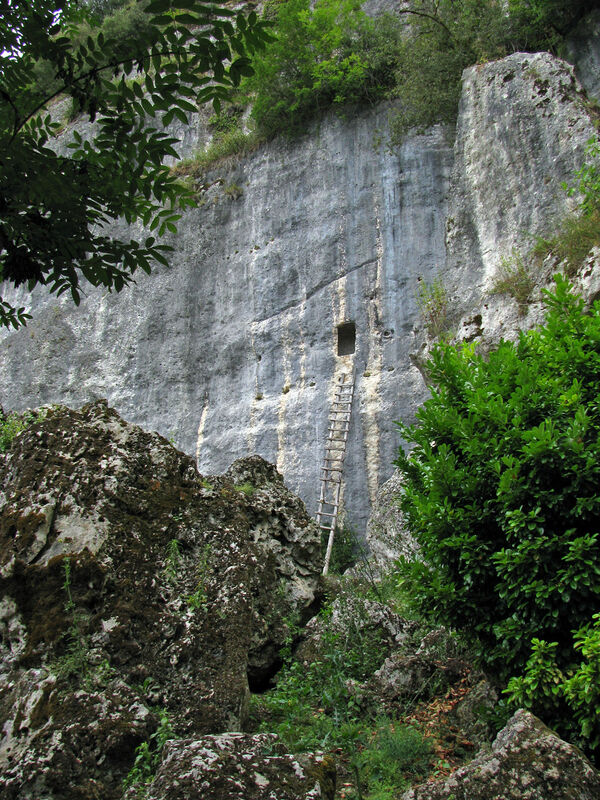 Hole in the cliff reached by a ladder for a watchman, a Trou de Guetteur. There was an extensive network of these up and down the Vézère valley to warn of invaders during wartime. 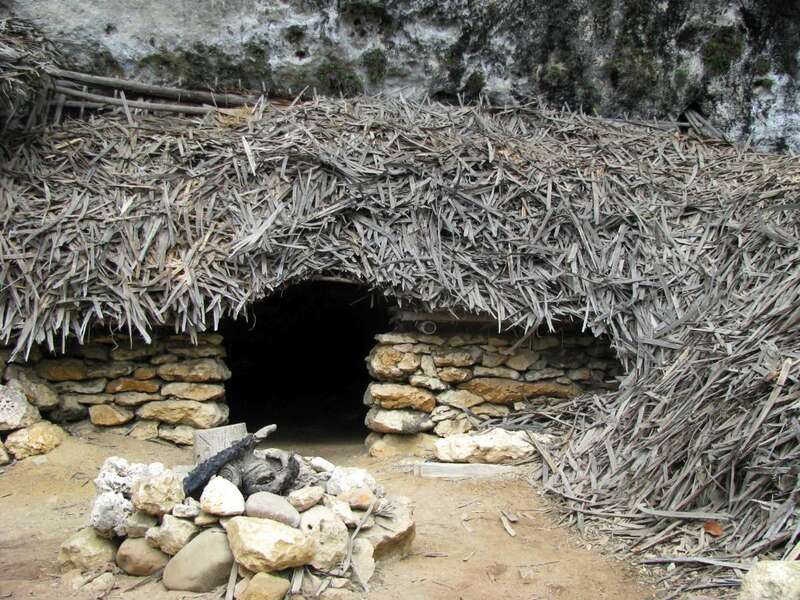 The first part of the abri shows what a commodious shelter it was, with very good protection from the elements, but with plenty of light available, on a dry and level floor. This spring, which runs year round, would have been a real bonus for the inhabitants. The water is sweet and good. It is situated in the lower section of the abri. Laugerie Basse, with the coupe or cross section of the dig left by the excavators. The area has been dug out to a considerable depth. The guide spoke only in French, which was fortunately not spoken too fast, so that I was able to follow most of what he said. Anyone going to France and going on an unaccompanied trip of this kind will find it invaluable to be able to speak the language. Few people outside major cities, airports and hotels speak anything other than French. You will need French to hire cars, order meals, ask directions, check in to a camping area, buy groceries, everything. The levels when people used the caves were darker in colour than those where there was no occupation. 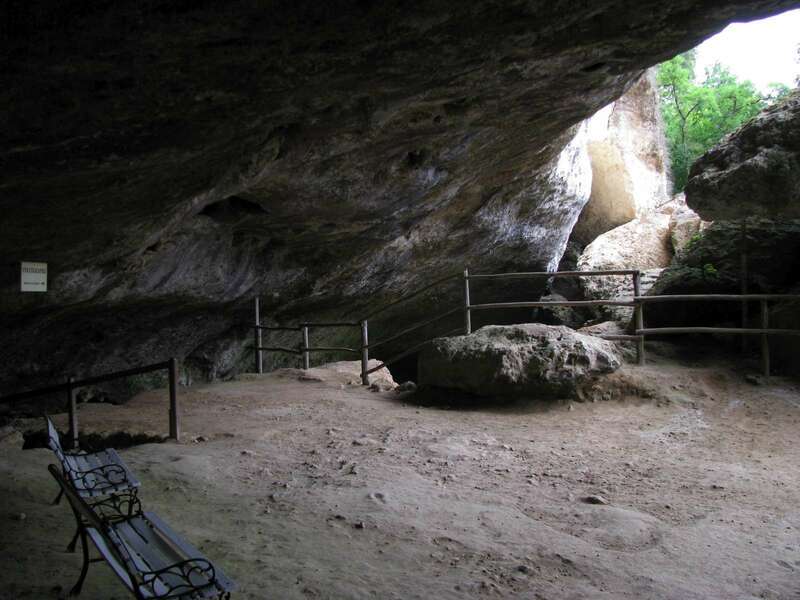 It is possible that the climatic conditions in the intervening periods between habitations were such that a lot of rock and gravel fell from the roof of the abri during very cold periods because of alternate freezing and thawing. Parts of the dark deposits were almost entirely flint, indicating that the area was heavily used for flint knapping. 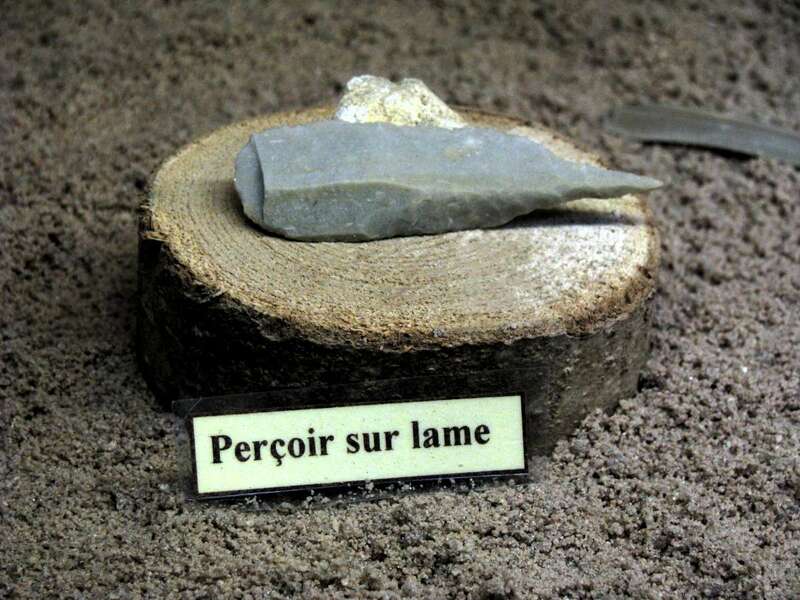 This was especially so in the nearby abri Laugerie Haute, where the flint layers were very thick, perhaps thirty centimetres or so. The age of the deposits range from 10 000 to 15 000 years before the present (BP), the present being always taken as 1950 for the sake of consistency. Exit via the tunnel from the main display area of the dig. The tunnel provides an exit for the water from the spring, which flows year round. The tunnel was dug from this side, underneath the huge rocks which had tumbled from the cliff above. The tunnel had to be carefully strengthened as it was dug. The tunnel is dwarfed by the cliff and overhanging rock above. Originally there were great 'eyebrows' or ledges of unsupported limestone, stretching out twenty metres or more over the site, providing wonderful protection from the elements for five thousand years. . An ash fall from a nearby volcano, when combined with the inevitable rain which followed making the ash even heavier, caused the ledges to collapse. 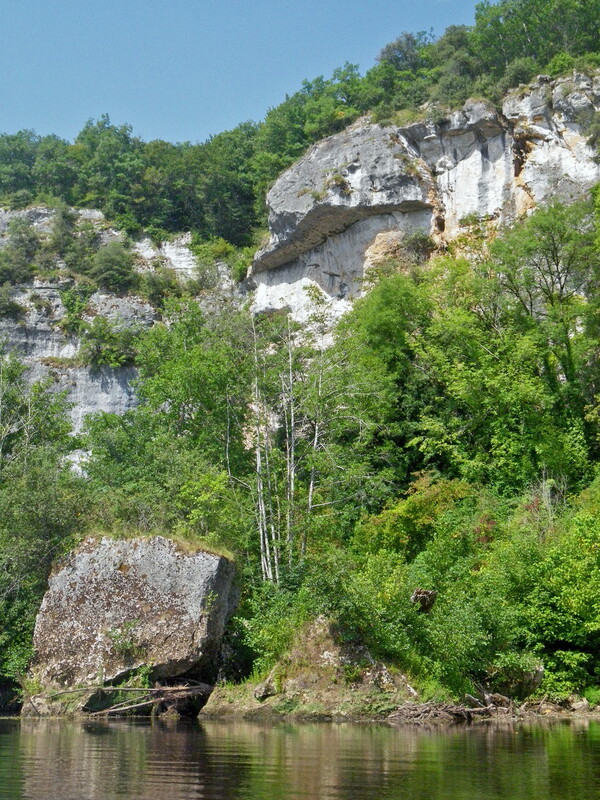 Much of the debris is still immediately below the cliff, but some huge rocks bounced and rolled to the edge of the Vézère, as can be seen here. The site was abandoned at that point. 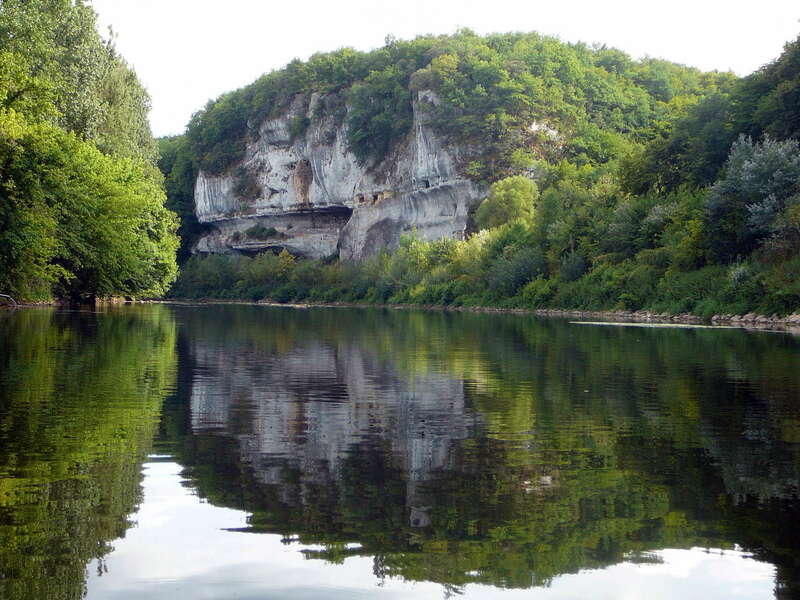 This photograph was taken on a canoe trip I took down the Vézère from Roque St Christophe to Les Eyzies. 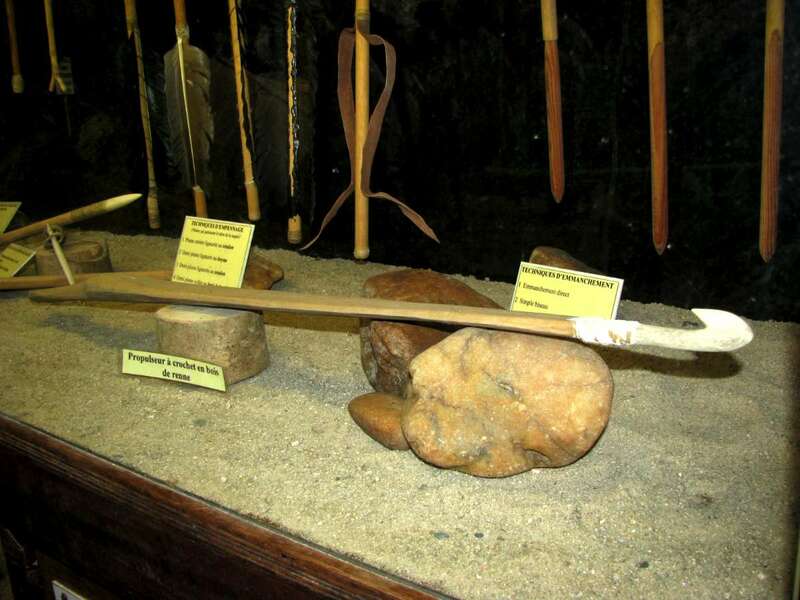 This propulseur, or atlatl, or spear thrower, was completed in wood for the handle and reindeer horn for the hook, since the reindeer horn is very tough and strong, and easily worked. Experts categorise propulseurs in several categories, including male and female. The propulseur in the previous photo would be male, since it uses a hook to connect to a depression in the end of the dart. In the case shown here, made entirely of wood, it is designated female, since it uses a cup shaped end to hold the spear, instead of a hook. A polisher, a harpoon with a single row of barbs, and an Azilian harpoon of distinctive shape. 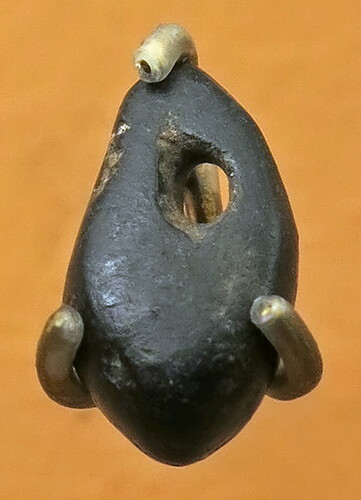 These Azilian harpoons are small (rarely over 10 cm), flat, and this example has at the base a hole for the attachment of a strap or thong, which shows that this weapon would detach on impact. 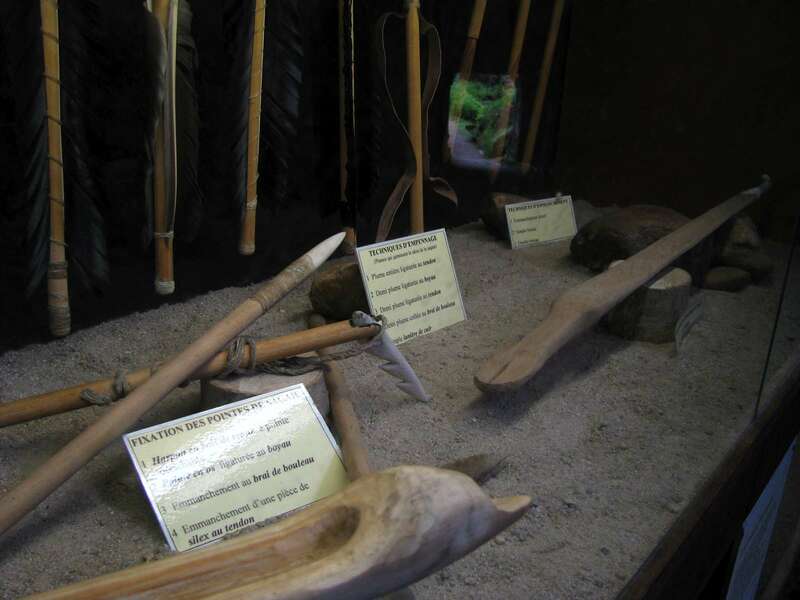 Also in this photo is an example of a small foêne (or fouêne), a multipronged spear head, usually used for fishing. Neptune's trident is a familiar example. 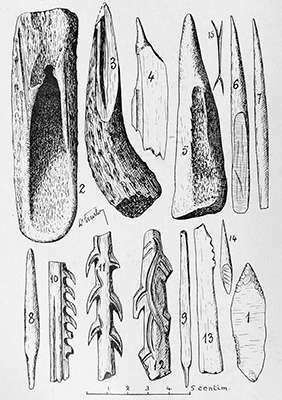 Various stages in preparing reindeer antlers and bone for use as a harpoon. Drill for making holes made on a blade. Drill for making holes made on a flake. Nucléus et lames en cours de débitage. 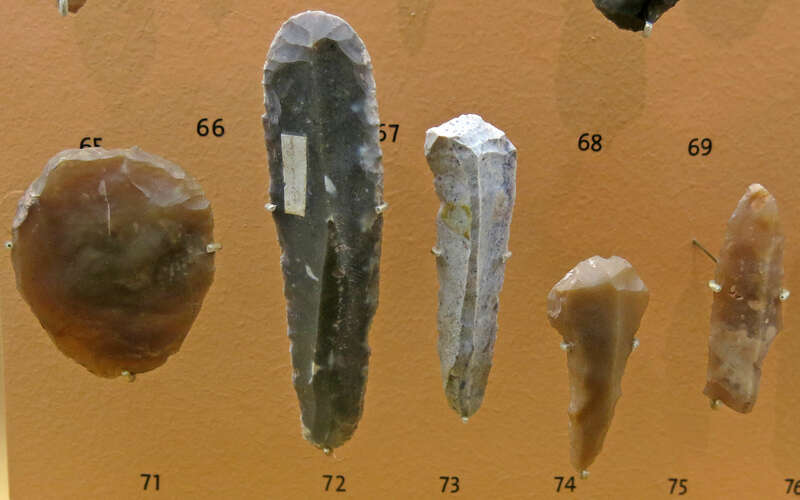 Core and blades during knapping. (left) Flint tools and other stone objects from Laugerie Basse. These are superbly fashioned tools - note in particular the fine drills (14 and 15) probably used for making holes in jewellery, and the saw at 2. (right) Rabots from Laugerie Basse. Rabots are heavy 'push-plane' scrapers made on blocks or thick flakes, abruptly retouched. 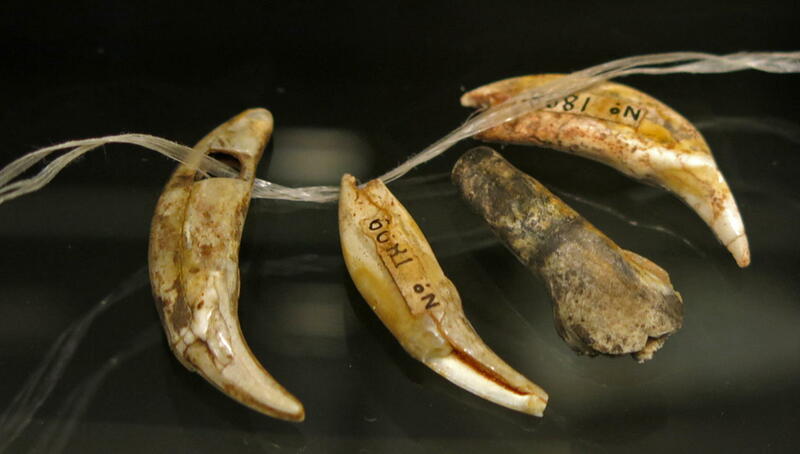 They were even part of the Mousterian toolkit, and remained virtually unchanged in these much later tools. 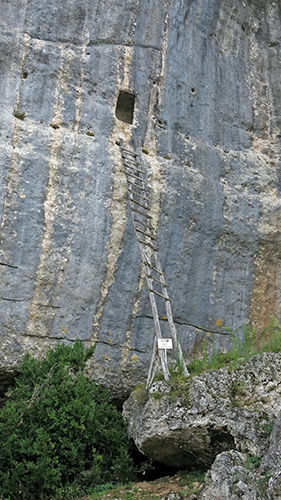 This is an ancient room for a watchman reached only by a rickety ladder. 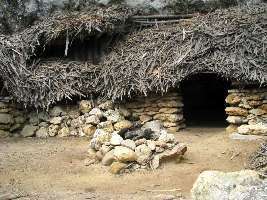 The whole area around Les Eyzies has been used for habitation not only in palaeolithic times, but nearly continuously right up to the present. From the middle ages at least, houses were built against the rock, with beams let into holes dug in the limestone, and grooves cut in the rock so that flashing could be inserted, and thus divert rain water running down the rock surface to flow harmlessly over the roof rather than down the inside rock wall of the dwelling. In this case, however, the hole in the rock would have been surrounded by a small shelter high up in the cliff for the use only of the watchman and his relief. After the tour, the guide allowed all who wished a try with throwing a spear, or dart, using an atlatl, at a target he had set up. I don't know whether the original atlatls / propulseurs had this little stand for the dart, but it is a great invention. It makes the throwing of the dart easy, and requires very little skill to get a good result. 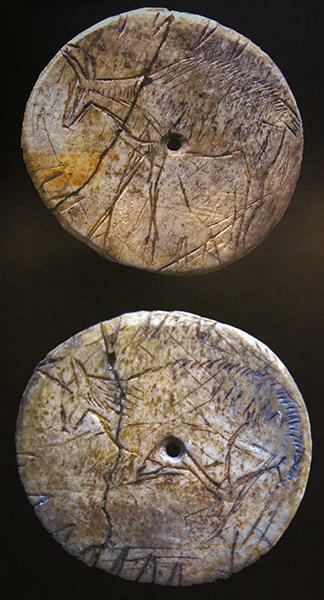 The photograph on the right (above) shows the hook or crochet on the propulseur, made of bone or reindeer antler. 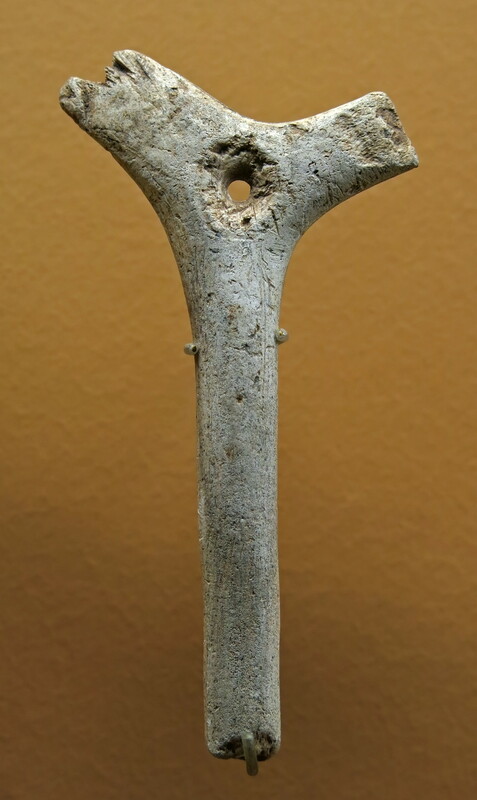 Worked bone from Laugerie Basse. 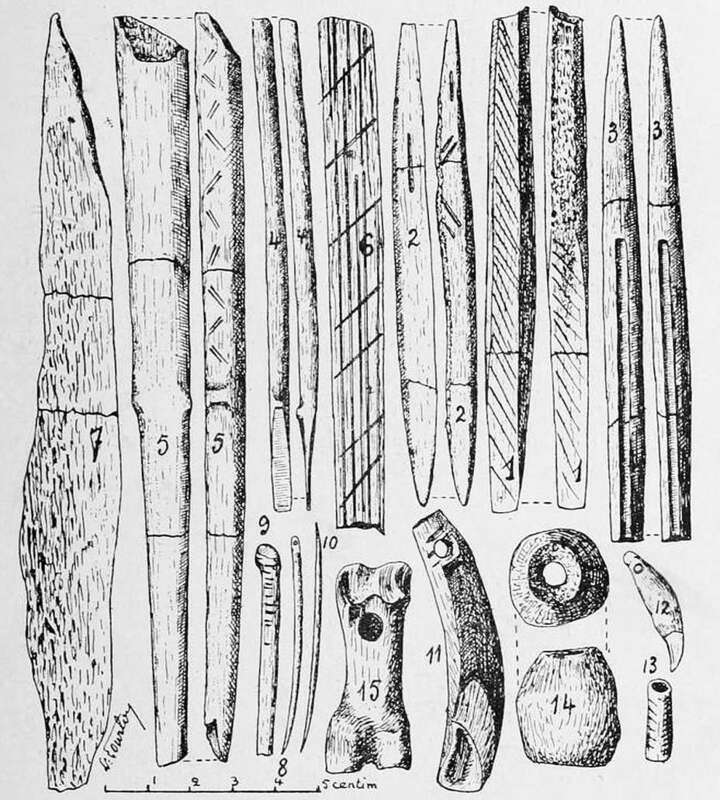 Note in particular the harpoons (10, 11, 12) on the left, and the bone needles at 8 and 10 on the right, as well as the bone flute at number 15 on the right. 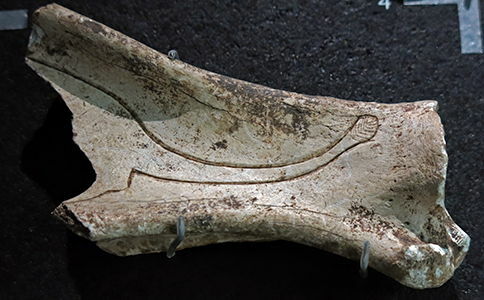 Scapula (shoulder blade) of a reindeer, engraved with the tail of a cave lion. 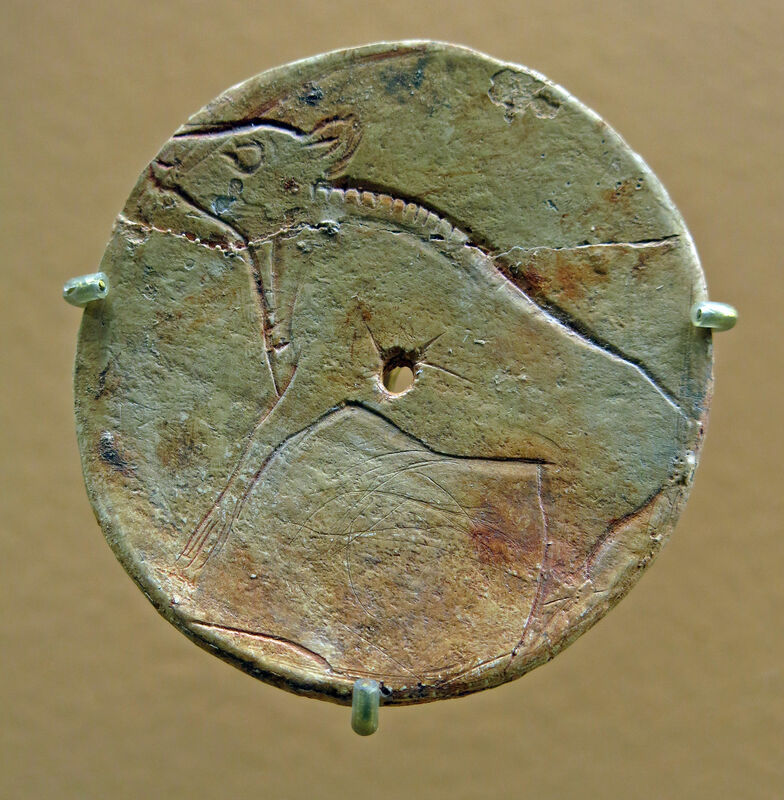 Hypothesis for the reconstruction of the lion engraved on the bone. The arrows indicate the possible variations for the position of the head, the neck and the front legs. 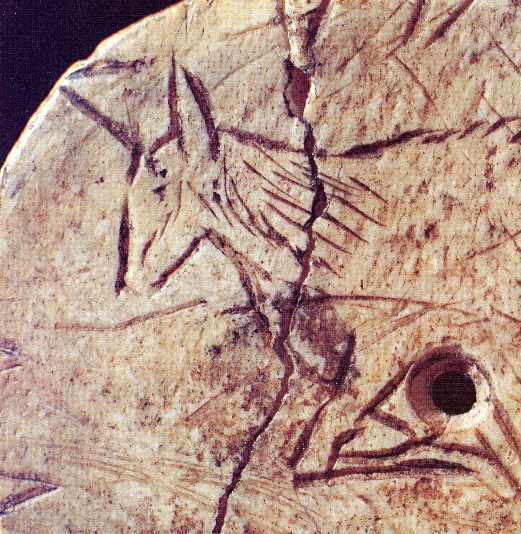 This is a facsimile of an engraved reindeer found in Laugerie Basse. Photographed at the Maison Forte de Reignac à Tursac. 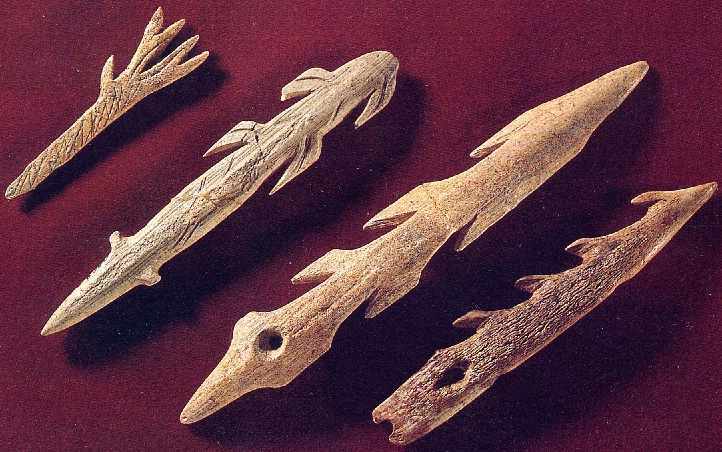 Decorated pieces of reindeer antler, using abstract designs. Decorated piece of reindeer antler. 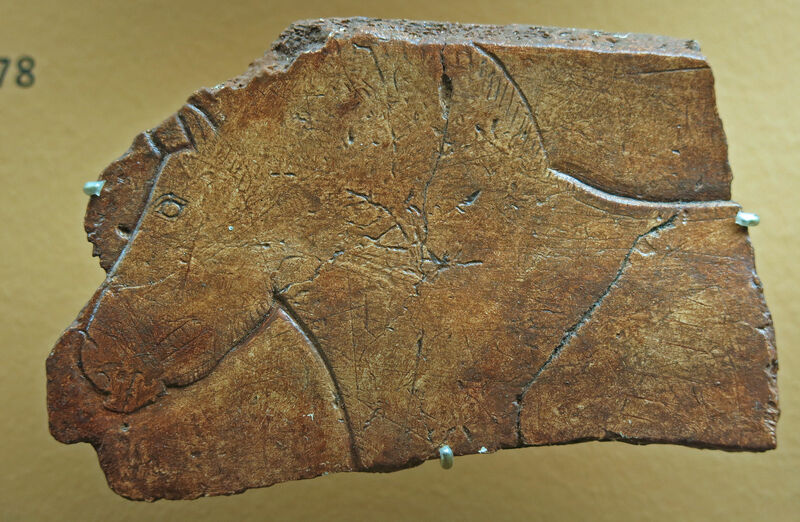 A horse has been engraved on one side, and a feline on the other. 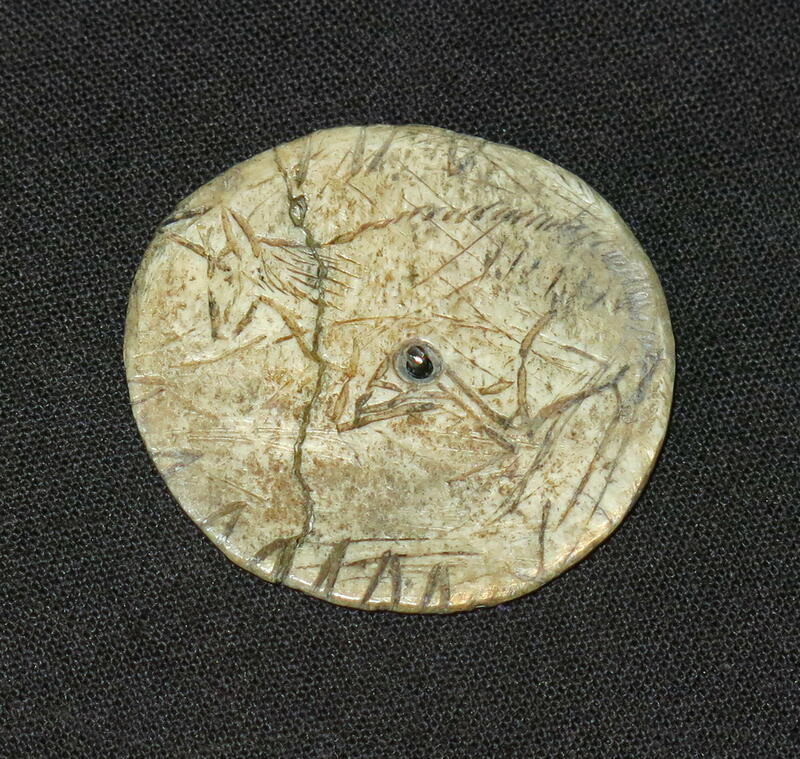 Aurochs and reindeer are listed on this piece - though for a long time I could not see the reindeer! This is the same image upside down, which allows the reindeer to be seen easily, on the left in this image, towards the top, and facing to the right. My thanks to Cecilie who found the reindeer for me! Laugerie Basse - Aurochs et renne, high definition images. 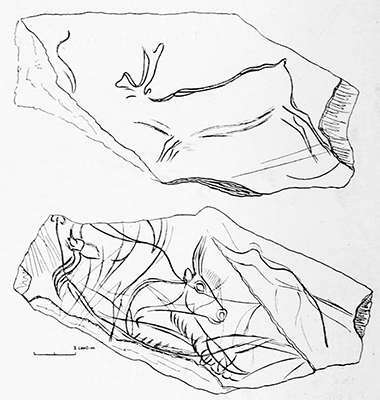 Animal engravings at Laugerie Basse, ca 30 000 BP. 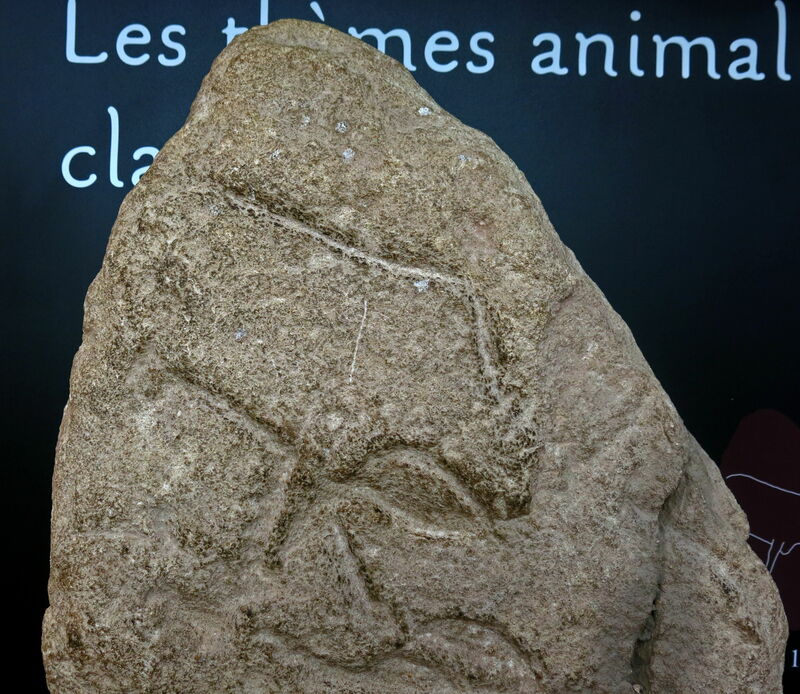 The aurochs hunter, Laugerie Basse. 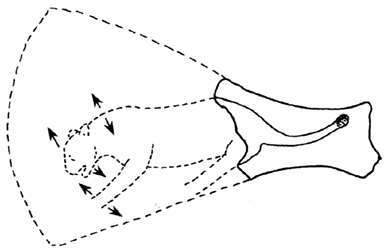 Notice that because it is a three dimensional object, the arm extends beyond the boundary of the two dimensional rendering, around the artefact. Photo: https://ericwedwards.wordpress.com/category/archaeology/page/3/, attributed to Kuhn (1958) but without further details. Decorated piece of reindeer antler, carved in the likeness of an animal's head, possibly a feline or bear. 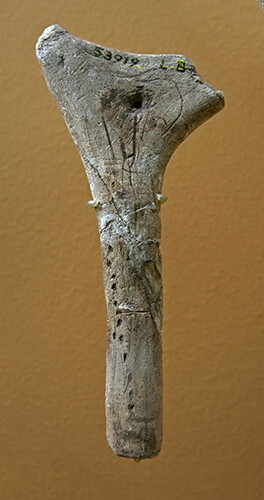 Decorated piece of bone, carved in the likeness of a deer, with decorative dots along the neck and face. Engraved plaque from Laugerie Basse. A is a human leg, rather well drawn. C is a male animal, possibly a bison judging by the beard, though the rear legs appear too small and weak for a bison. D is an indeterminate animal, possibly a reindeer. 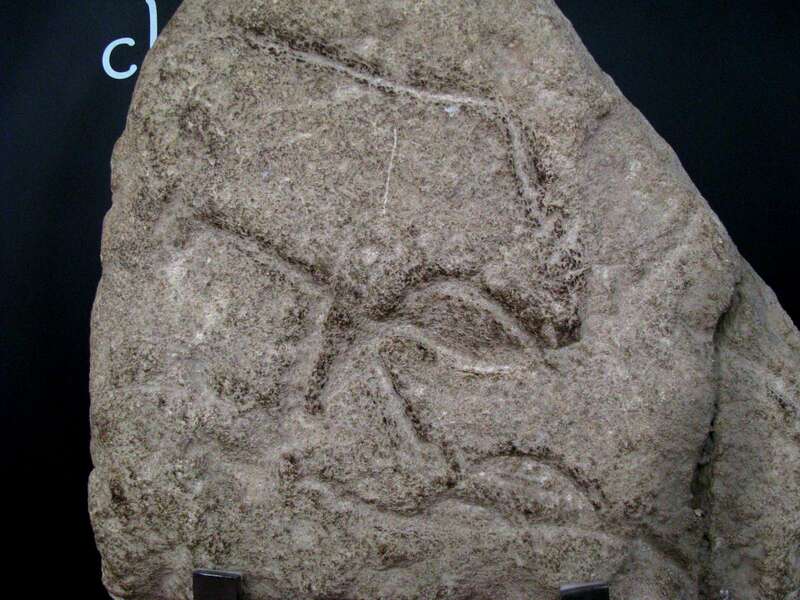 Engraved piece of schist from Laugerie Basse. 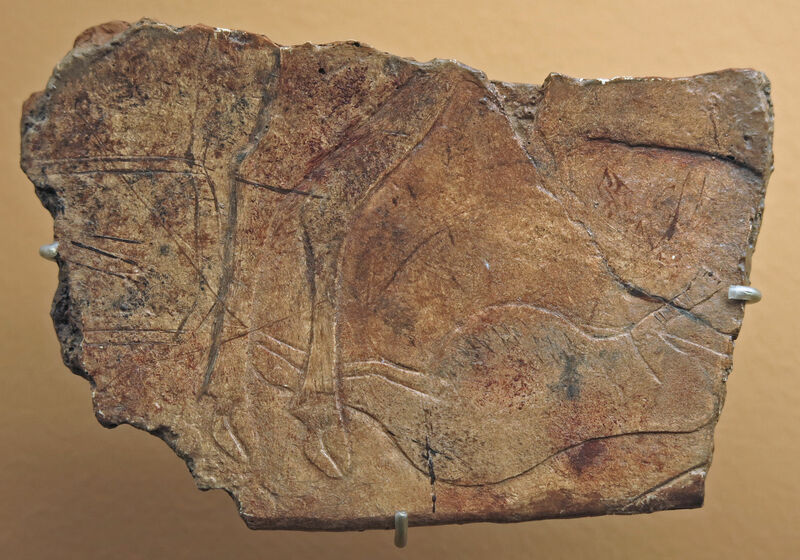 On one side is a reindeer, on the other an aurochs. L'Abri des Marseilles in the Vézère valley. This valley used to host animal species that are typical of cold climates and that have now disappeared, such as the mammoth or the hairy rhino, and also species that still live today in polar regions, such as the musk ox, the polar fox and the reindeer. 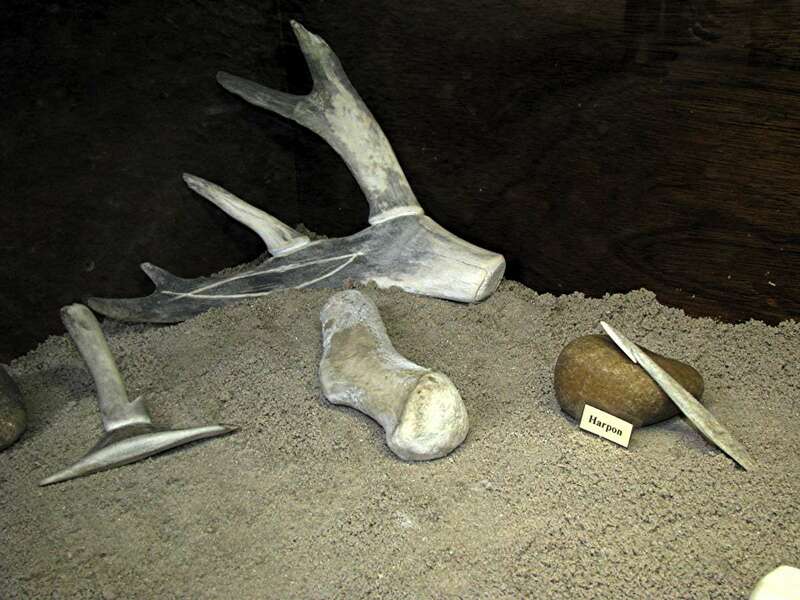 Excavations in Laugerie Basse show that 90% of all bones discovered were reindeer bones. 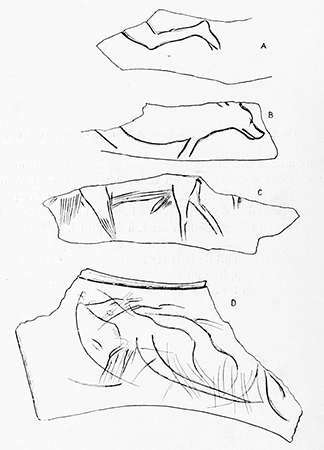 There is a flint piece very distinctive of the area called the Laugerie-Basse point, a foliate piece with a delicate marginal retouch. 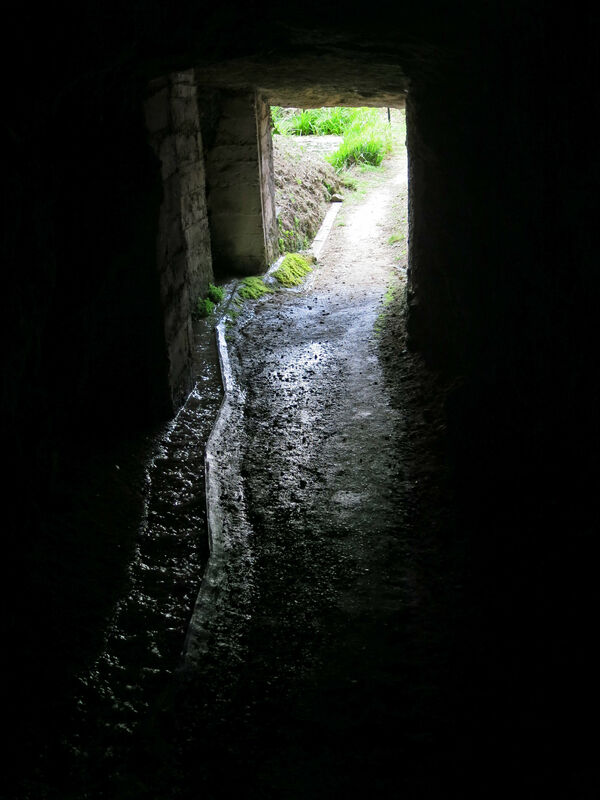 The path in these photos leads back from the tunnel used to exit the abri to form a loop with the start of the tour. Photographie du site de Laugerie-Basse publiée par E. Cartailhac en 1889, dans "La France préhistorique". 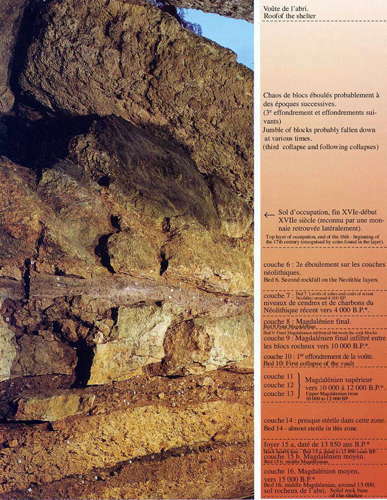 "Les fouilles de Lartet, Christy, de Vibraye, Massénat ont eu lieu dans le talus, sous les maisons" indique-t-il. La première maison, qui existe encore, est celle de Léonard Delpeyrat, un fouilleur célèbre de Laugerie-Basse. Plus loin se trouve la ferme Langlade et les restes d'une grange. Photograph of the site of Laugerie-Basse published by E Cartailhac in 1889, in "La France préhistorique". 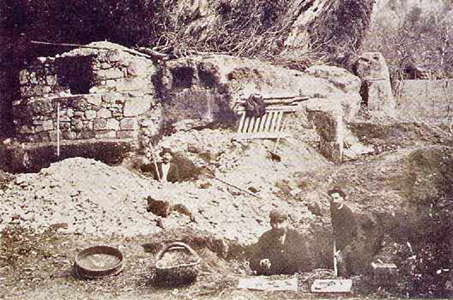 The caption to the photograph reads "The excavations of Lartet, Christy, of Vibraye, Massénat took place in the slope, under the houses". The first house, which still exists, is that of Léonard Delpeyrat, a digger who worked at Laugerie Basse. Further on is the Langlade farm and the remains of the Langlade barn. Gravure de E.A. Tilly publiée en 1887 dans un livre de vulgarisation de H. de Cleuziou "La création de l'homme et les premiers âges de l'humanité". Au premier plan se trouve la grange Langlade, en ruines, où furent effectuées diverses fouilles. 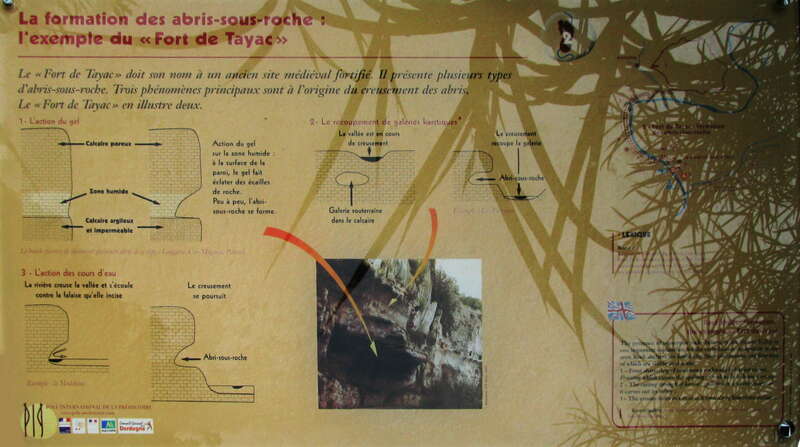 Tout au fond, on aperçoit la falaise du Roc de Tayac, en aval de Gorge d'Enfer. Engraving by E.A. Tilly published in 1887 in a popularisation by H. de Cleuziou, "The creation of Man and the First Ages of Humanity". In the foreground is the Langlade barn, in ruins, where various excavations were carried out. 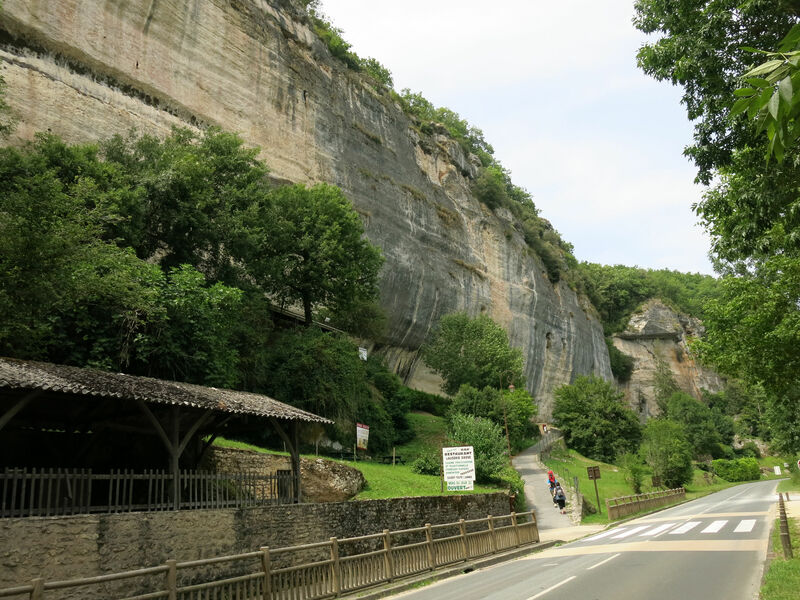 Further on in the background can be seen the cliff of the Roc de Tayac, downstream from Gorge d'Enfer, the Gorge of Hell. R. route dans la vallée. F. blocs et éboulis détachés de la falaise. R road in the valley. F blocks and debris from the cliff. Laugerie Basse excavation. Here the Venus figure called 'Impudique' was discovered in 1864 by the Marquis Paul de Vibraye. It was the first Venus figure found in France. 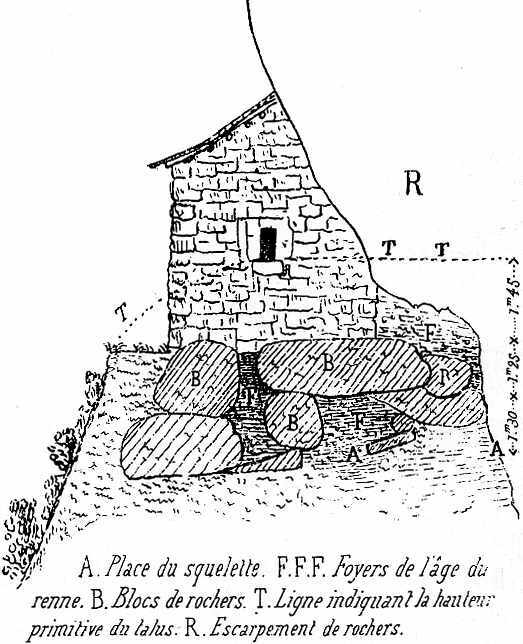 Emplacement du squelette de Laugerie-Basse sous une bergerie elle-même construite sur un amas de blocs rocheux. La position précise de cette bergerie n'a pas pu être retrouvée. Dessin publié par E. Cartailhac en 1872, date de la découverte. 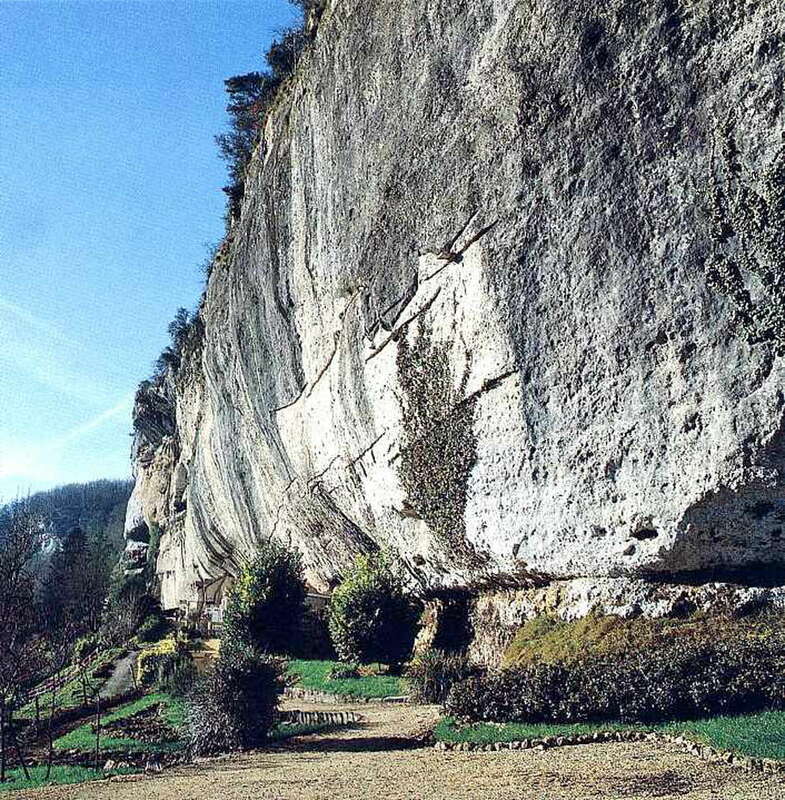 Site of the skeleton of Laugerie Basse under a sheep-pen itself built on a cluster of rock blocks. The precise position of this sheep pen could not be found. 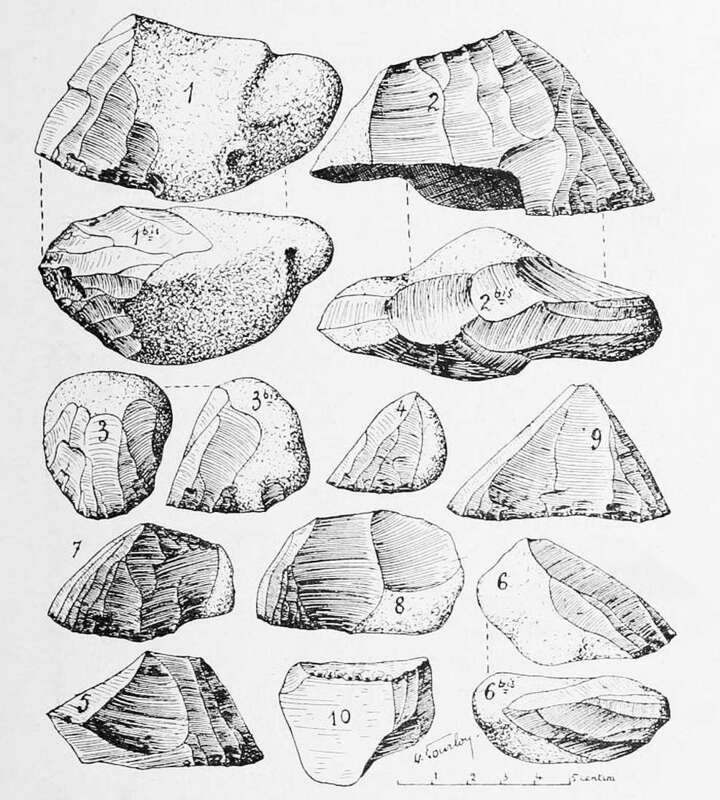 Drawing published by E Cartailhac in 1872, date of the discovery. Squelette humain de Laugerie-Basse. Il gisait en position repliée, coudes et genoux se touchant presque. Plusieurs coquillages perforés étaient associés à cette sépulture, notamment deux espèces de cyprées (porcelaines) originaires de la Méditerranée. Dessin publié par E. Cartailhac en 1889 dans "la France préhistorique". 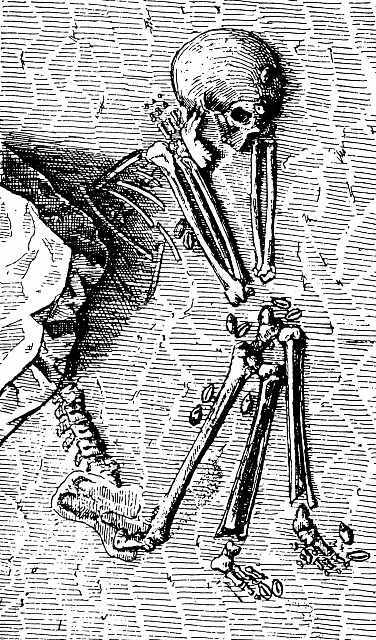 Human skeleton of Laugerie Basse. It lay in a foetal position, elbows and knees almost touching. 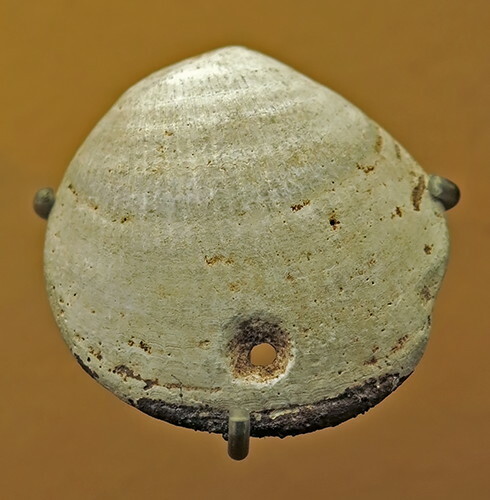 Several perforated shells were associated this burial, in particular two species of cyprées (porcelains) originating in the Mediterranean. Drawing published by E Cartailhac in 1889 in "la France préhistorique". Os iliaque avec représentation d'un cheval tourné à droite dont une fracture a détruit la tête. 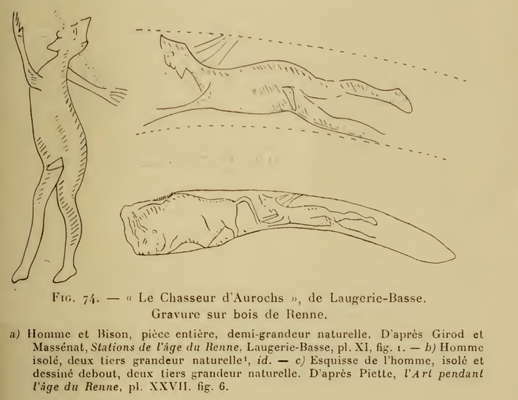 L'animal est finement gravé et, cas exceptionnel, ses contours ont été également peints à l'ocre rouge. Longueur 110 mm. Fouilles Le Bel et Maury à la grange Langlade. Musée national de Préhistoire. 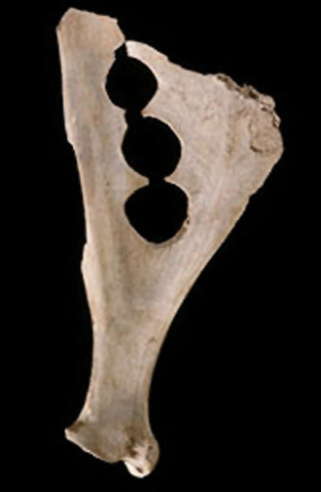 Part of a pelvic bone with the representation of a horse turned to the right whose fracture has destroyed the head. 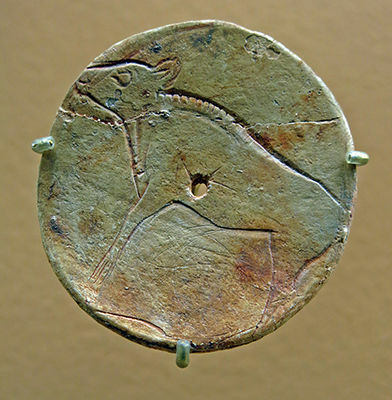 The animal is finely engraved and, exceptionally, its contours were also painted with the red ochre. Length 110 mm. Excavations Le Bel et Maury at the Langlade barn. Musée national de Préhistoire. 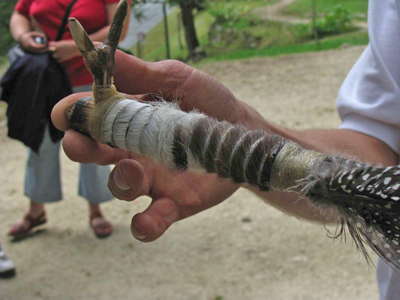 Bâton cylindrique en bois de renne, perforé à son extrémité gauche, portant la profonde gravue d'un grand félin, peut-être une panthère, animal rarement représenté. Le dessin en déroulé d'H. Breuil montre l'animal dans son entier. Longueur figurée 160 mm. Fouilles Le Bel et Maury. Coll. de la Société préhistorique française au musée de l'Homme. Cylinder made of reindeer antler, perforated at its left end, carrying a deeply incised image of a large cat-like animal, perhaps a panther, which is an animal seldom represented in cave art. 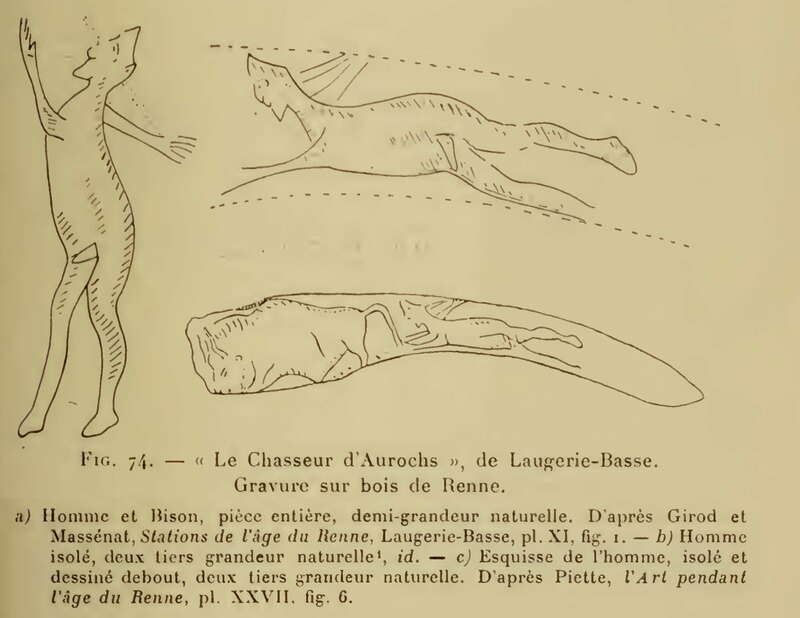 The drawing by H. Breuil shows the animal in its entirety. Length of the drawing 160 mm. Excavations Le Bel et Maury. Coll. de la Société préhistorique française au musée de l'Homme. Face humaine gravée sur un galet de roche tendre, probablement une stéatite. Des traces d'ocre rouge s'observent au fond des traits. Hauteur 57 mm. Musée d'Aquitaine. 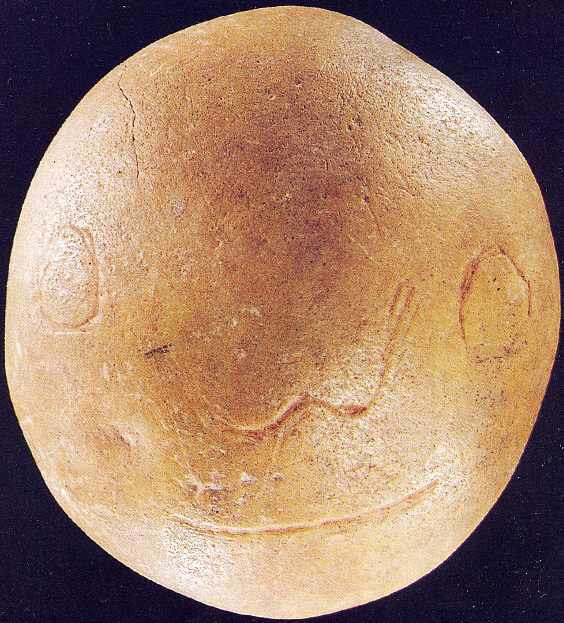 Human face engraved on a soft rock pebble, probably steatite (soapstone). Traces of red ochre may be seen at the bottom of the face. Height 57 mm. Musée of Aquitaine. This is a flat bone which has been carefully scraped and prepared. The species of the two fish shown here touching mouths are unknown. The one on the right appears to be seen from beneath, showing its gill covers. Length 58 mm. There is what appears to be a feather drawn beneath the fish, though it may be a fragment of a plant. They are reminiscent of an Escher drawing. 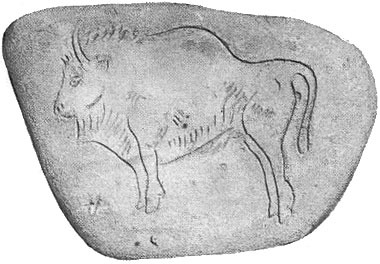 An engraving of a bison on a pebble from Laugerie Basse. It may have been a preparatory sketch for a painting in one of the caves. Note the way the hooves are pointed down, not in a naturalistic position. It may be that the sketch was made from 'life' - a bison kill. Très mince rondelle en os, de 31 mm de diamètre, perforée en son centre, avec sur chaque face la représentation d'un herbivore et des signes en chevron le long des bords. Cette oeuvre d'art miniature fut découverte en 1868 par M. Hardy et publiée pour la première fois en 1872 dans "Le Magasin pittoresque", revue populaire de l'époque. Very thin disc in bone, 31 mm. in diameter, perforated in its centre, with on each face the representation of a herbivore (deer?) and chevrons along the edges. This miniature work of art was discovered in 1868 by M. Hardy and was published for the first time in 1872 in "Le Magasin pittoresque", a popular review of the time. Click either of these images to see an animation. Another view of the disc. This looks like a museum quality facsimile. Poster showing the two sides of the disc. 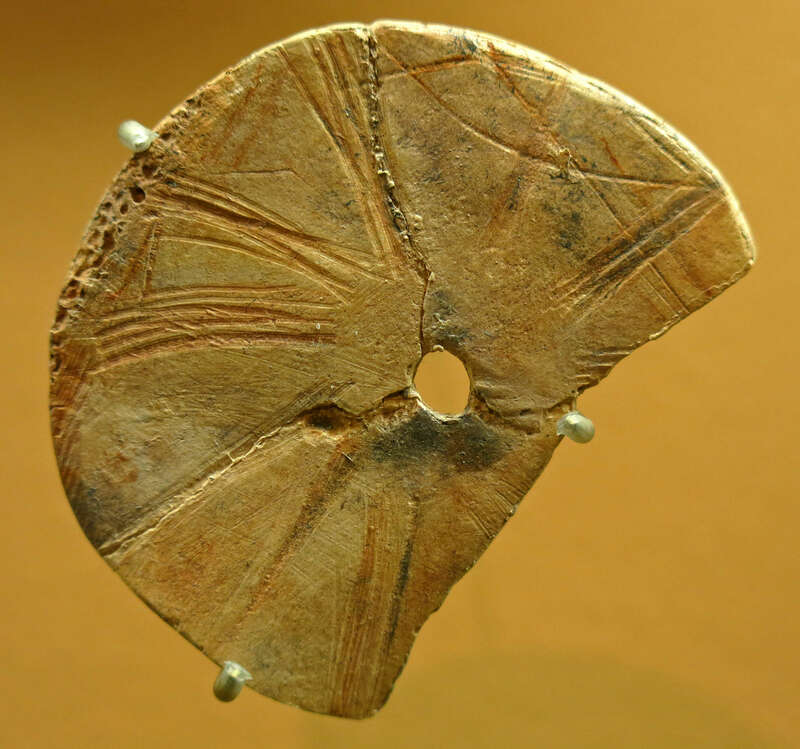 Rondelle or disc cut out in a circular shape, with a hole through the centre. It is undecorated. These discs are usually cut from a scapula (shoulder blade), which provides a ready made thin, flat support. Engraving of an aurochs and a bison from Mas d'Azil. This may have been used as a button, but both sides are decorated. The two sides are quite different. 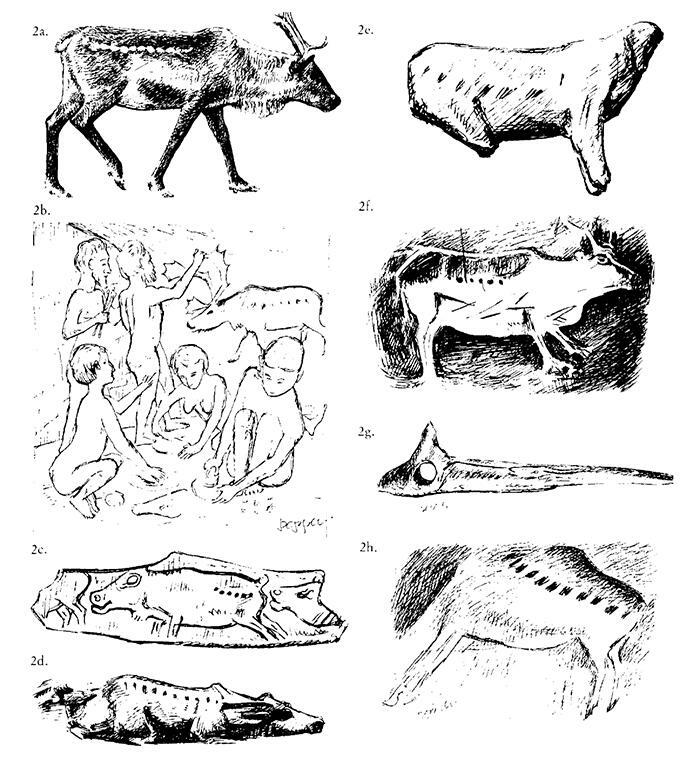 The one on the left depicts an adult aurochs considered a female because of the fine features of the head. The withers and chest are marked with small incisions. Horns and ears are sketched. The eye and the nostril are shown as points. 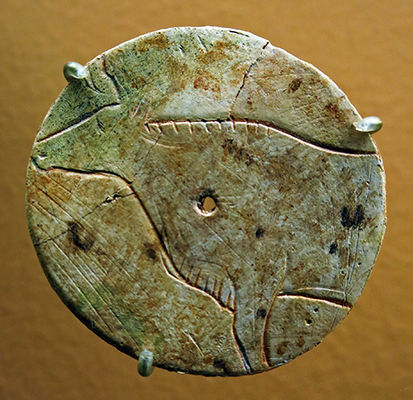 The other side of the disk shows a young bison, which, according to the size of the horn and the curvature of the hump might be about five months old. This young bison is half the size of the adult animal. Again, we find the same incisions along the shoulder and the chest. Aurochs females sometimes adopted baby bison. 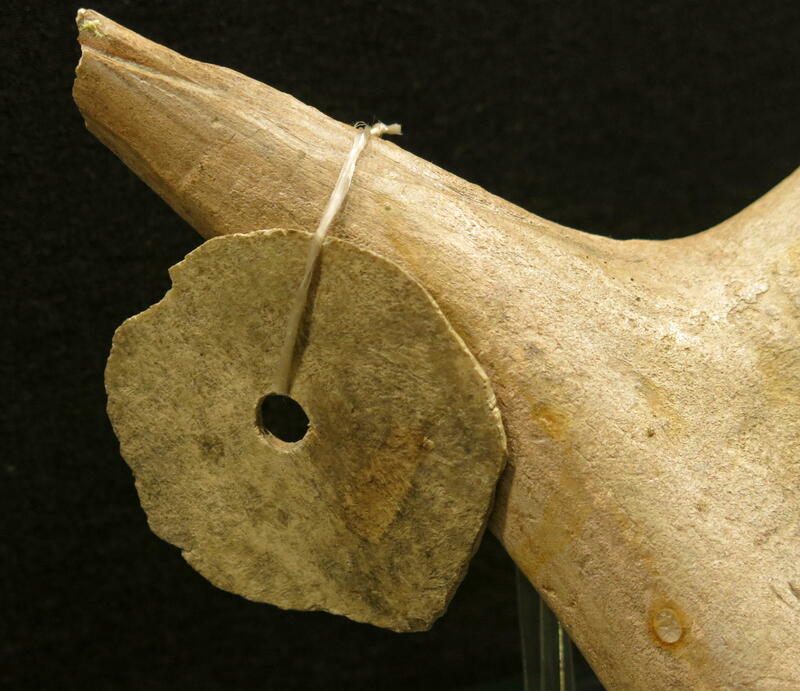 This scapula from Mas d'Azil was used as the base material for round disks similar to the ones above. It would seem not much care was taking in making the buttons completely round at the roughing out stage. Bevelled base of a spear point. The point itself has broken off. Note that the bevel has been scored, presumably to provide better (temporary) union with the shaft of the dart. It would have been bound with sinew to the shaft, and possibly glued as well. 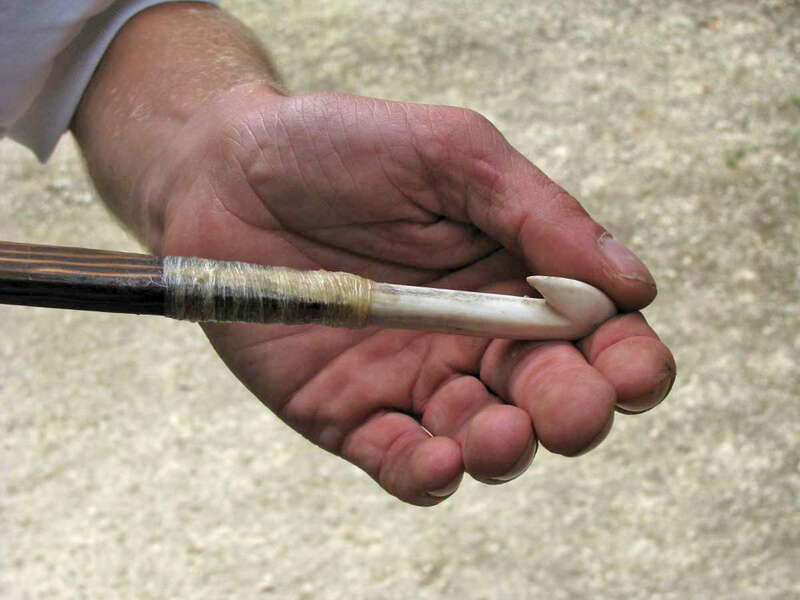 Glue gives great strength to a tightly wound piece of sinew on the shaft. A bone or ivory point is more durable than a fire-hardened spear tip, and it is relatively easy to replace the tip if it is broken during use. The hunter then only has to take several spare spear points on a hunt, instead of a larger, heavier load of spare darts. Beautifully made blades, and grattoirs (scrapers) formed on the end of blades. In the right background is a parrot beaked burin. The burin spall has been cleanly taken off. 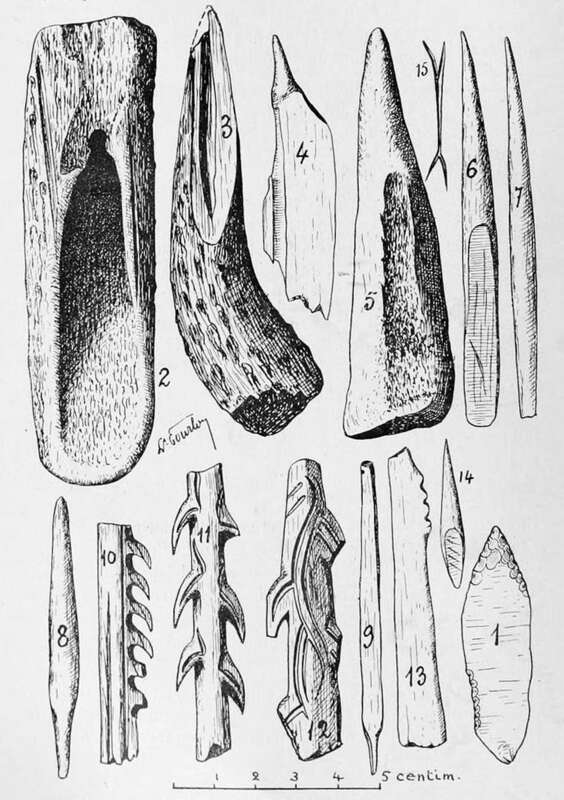 Eyed bone needles, one of which has been repaired with a new eye when the first ruptured during use, and a bone from which needles have been extracted using a burin. Lamp, roughly pecked from a limestone cobble. Tallow was put into the hollow, and a wick of twisted plant fibres or moss was used. This is a strictly utilitarian lamp, others are beautifully made with great care, possibly for ceremonial use. One sided harpoon, with a small object it is difficult to identify. The small artefact may be a wedge of some kind. Note the bulb or widening at the base of the harpoon. This is there to give a secure ridge for the attachment of a cord or leather thong to the harpoon and thence to the shaft, so that the harpoon may be pulled back to the hunter after it has parted company with the shaft. This 'blade' of bone appears to have been split in half. 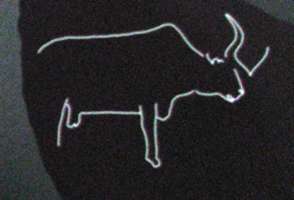 The remaining part shows an engraving of the back of a bison, with uplifted tail. Fragment de ramure de renne avec gravure de la tête du même animal pourvu d'une large palme digitée caractéristique de l'espèce. Dans sa simplicité, cette gravure est néanmoins très expressive. Coll. Le Bel et Maury. musée national de Préhistoire. 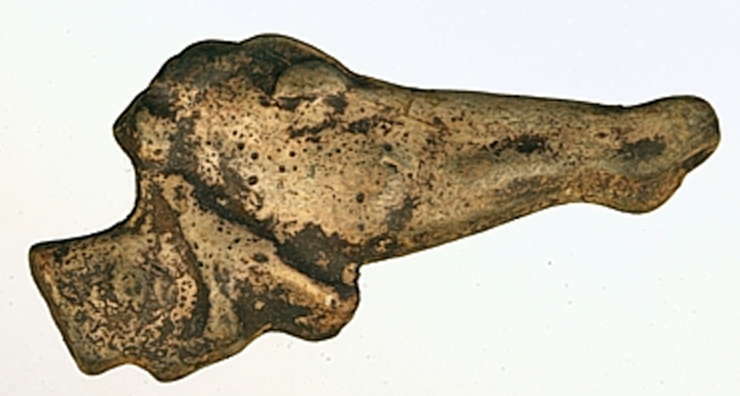 Fragment of reindeer antler with an engraving of the head of a reindeer bearing a broad palmate antler characteristic of the species. Despite its simplicity, this engraving is nevertheless very expressive. Coll. Le Bel et Maury. musée national de Préhistoire. French text: Visiter les Abris de Laugerie-Basse - Alain Roussot - Editions Sud-Ouest. 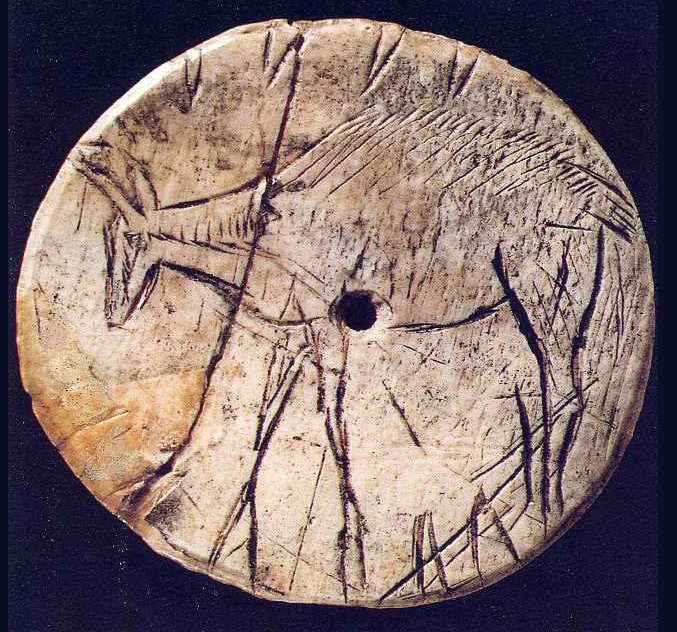 Reindeer engraved on reindeer antler. This is a famous piece. 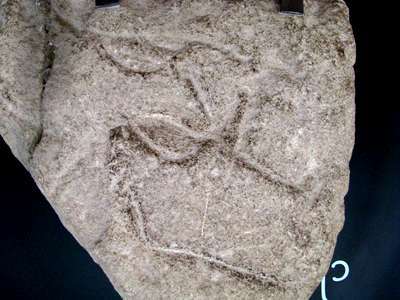 Motifs bilobés en forme de rein et gravés sur un fragment de schiste ardoisier encoché sur les bords. Longueur 48 mm. Musée du Périgord. 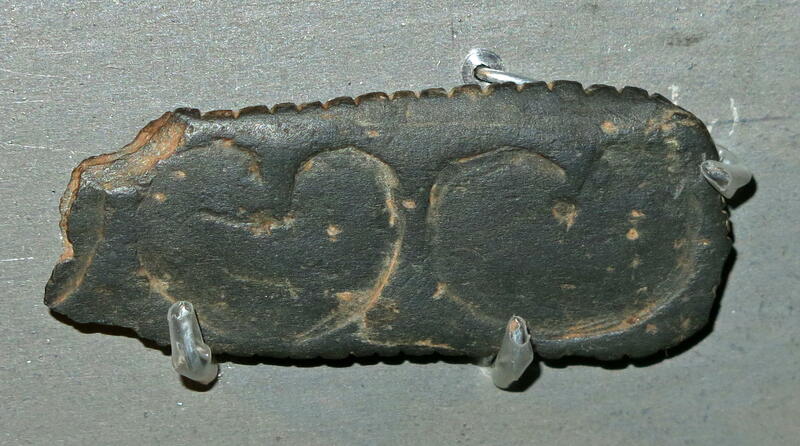 Bilobate motifs in the shape of a kidney and engraved on a slate fragment notched on the edges. Length 48 mm. Musée du Périgord. 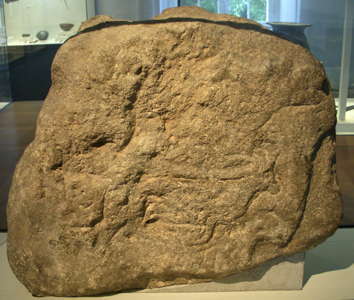 Engraved piece of schist from Laugerie Basse as above. Harpoon head engraved with a criss-cross pattern. The engraving is of the body and hindquarters of what appears to be a gravid reindeer in full flight, with the outline engraved at the rear back and hindquarters as much as three times, possibly to show movement. Another view of the piece above. Engraved antler, showing what may be an ibex head and horns. 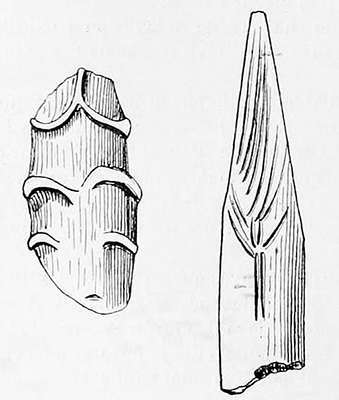 (left): Magdalenian reindeer antler from Laugerie Basse with the beginnings of a perforation to make it into a bâton percé. Dimensions: length 132 mm, width 58 mm, thickness 11 mm. 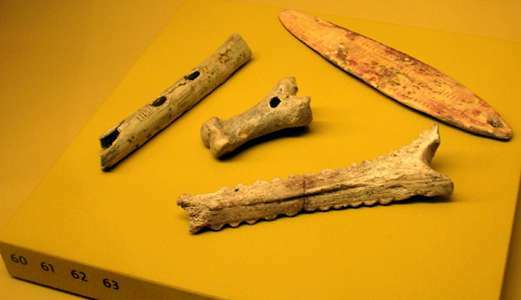 (right): Magdalenian bâton percé of reindeer antler from Laugerie Basse. Dimensions: length 89 mm, width 32 mm, thickness 14 mm. 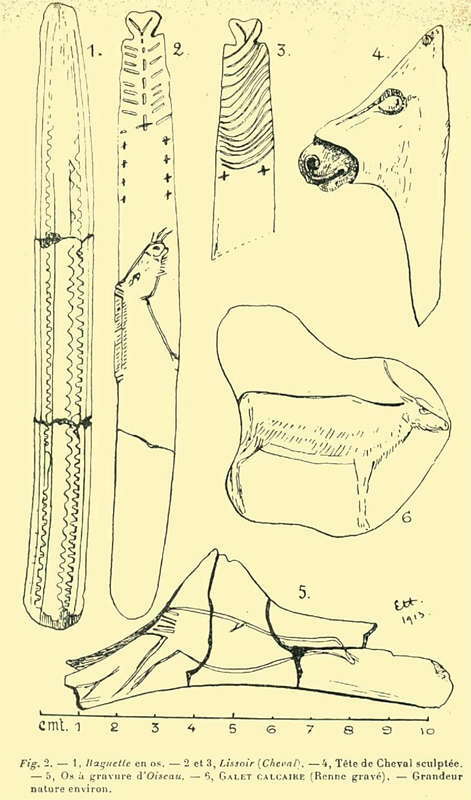 (left): Magdalenian bone lissoir, used for leather processing, from l'abri de Laugerie-Basse. Dimensions: length 120 mm, width 21 mm, thickness 5 mm. (right): Magdalenian reindeer antler lissoir, used for leather processing, from l'abri de Laugerie-Basse. Dimensions: length 80 mm, width 27 mm, thickness 13 mm. 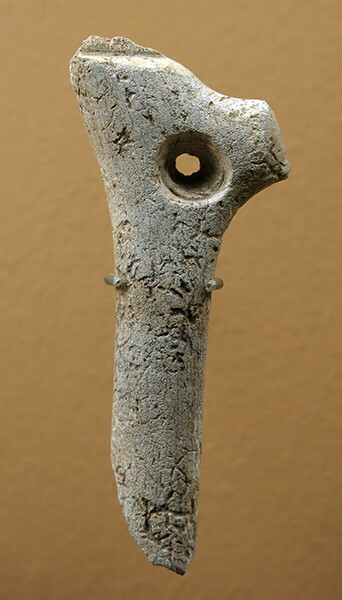 Magdalenian pierced baton from Laugerie Basse, in reindeer antler. 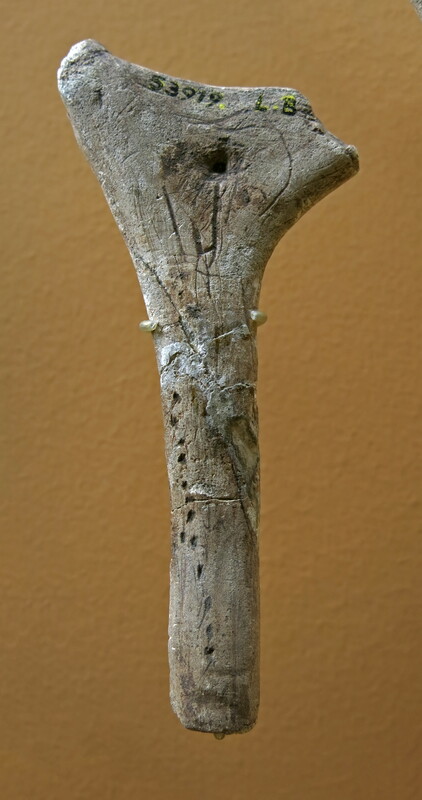 Decorated rod made of reindeer antler. 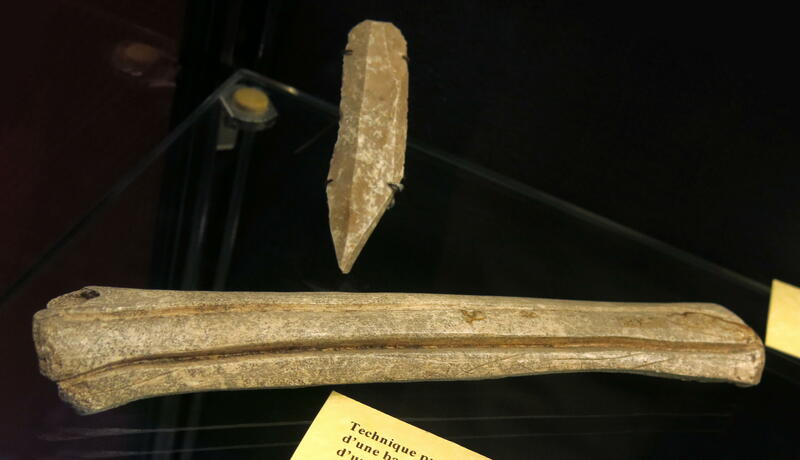 This shows how baguettes were cut from a long bone, with the aid of a burin. A dihedral burin is shown with the bone. 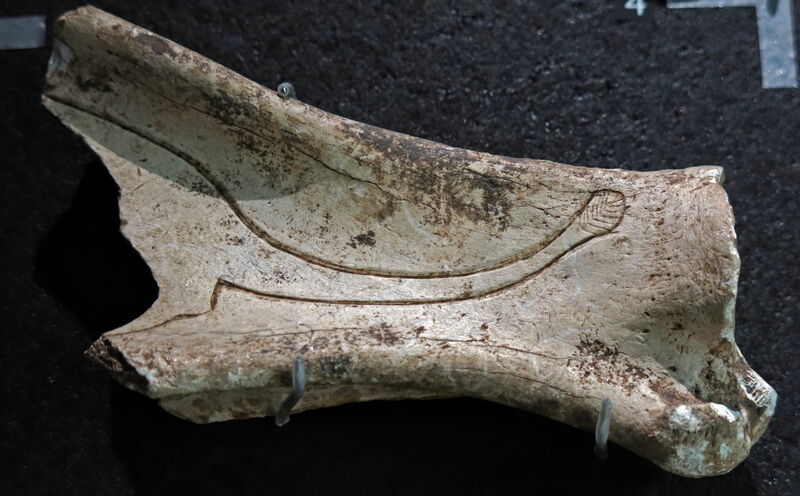 Reindeer head and forequarters engraved on bone. The reindeer bull is in what is called a 'low stretch display', used between a calf and a cow, by a bull approaching a cow in the rutting season, and as a threat display from one bull to another subordinate adult bull. My thanks to Andrea Castelli for his insights on this pendant and the one below. Pendant engraved with what may be the hindquarters of reindeer cow. Note, however, the line of decorative notches carved along the flanks of the animal. These are known as Pepper's Patches, and occur mostly on young and on female reindeer. 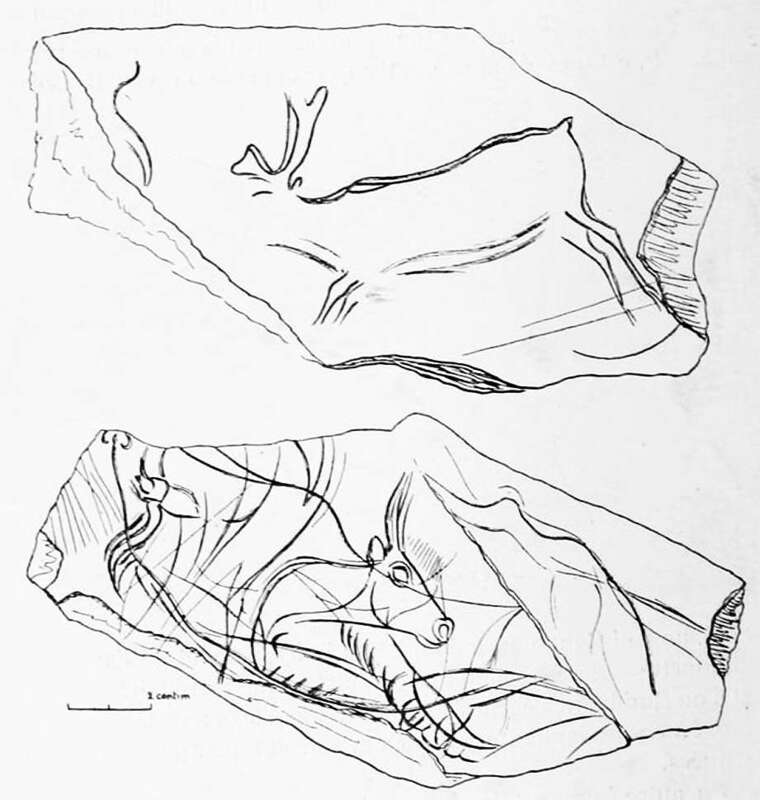 Hubert Pepper, a British artist from a small village in Wales, was the first to recognise that the spotting shown in depictions of Pleistocene reindeer corresponded to real spots in some living reindeer. Such rows of spots also occur in the pelage of virtually all deer species during their early 'hiding out' period. Presumably, this spotting serves as camouflage for a lying fawn hiding alone most of the day. Both fallow and axis deer retain this spotting pattern into adult pelage. It is likely that the spotting arose evolutionarily in young deer, and then, also for evolutionary reasons, was maintained into adulthood. Reindeer are an exception to the predominantly parkland focus of the deer radiation. Reindeer are well adapted to life in the treeless far north, and have probably occupied this habitat for nearly a million years. Reindeer have abandoned the classic deer pattern of hiding young, and instead, reindeer calves follow their mothers soon after birth. Reindeer calves are vulnerable for only a day or so, then they run as fast as their mothers. Among living reindeer it is usual for the young to be a dark rust colour (sometimes almost black) and without spots. Large herds of reindeer move to expansive calving grounds where predator density is low, and the hundreds, even thousands, of cows give birth over a short period. This decreases net mortality by swamping carnivores with more opportunity to take the vulnerable young than they can realise in just a few days. Early in their evolution, reindeer herds were probably smaller and occupied woodland habitats and probably sought thickets for calving in the ancient deer pattern. 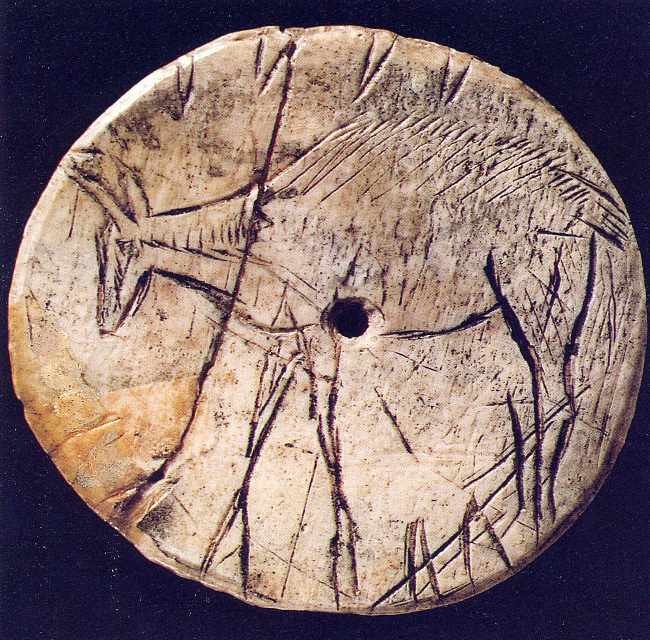 This woodland context is the reason spotting has been maintained in woodland deer, and I propose that the reindeer spotting portrayed in Palaeolithic art was a revival of an abandoned, much older, pelage pattern favoured by the less open habitats during the late Pleistocene in southern Europe and maybe across much of Asia as well. 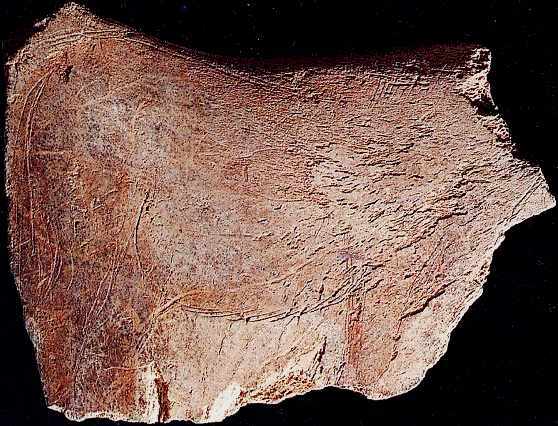 The frequency of reindeer portrayed with spots in Palaeolithic art seems to increase from Germany southward toward the Iberian Peninsula. 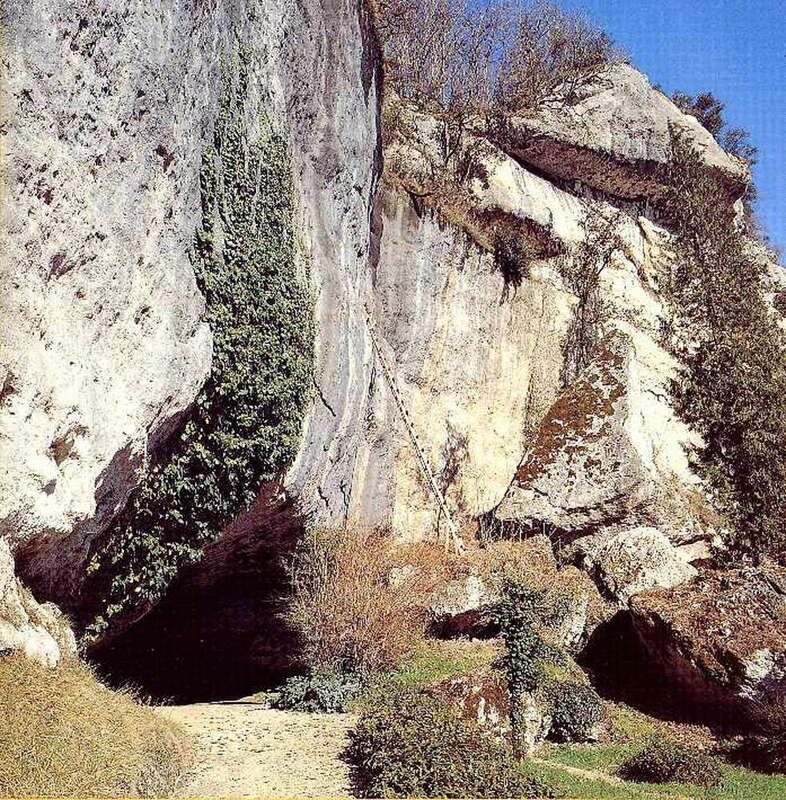 Virtually all the reindeer pictured at Altxerri Cave in northern Spain, are spotted; over half of those pictured in Trois Frères are spotted. Much farther north, the Palaeolithic sites of La Marche in France and Gönnersdorf in Germany show no spotted reindeer, and of course among today's European reindeer in Scandanavia very few are spotted. I suspect this evidence reflects an actual north-south Pleistocene gradient. Drilled teeth used as pendants. The almost square hole in the bear tooth on the left is unusual, and seems to have made use of an existing crack to start the hole. Magdalenian spear point with a single bevel in reindeer antler from l'abri de Laugerie-Basse. Dimensions: length 94 mm, width 9 mm, thickness 8 mm. 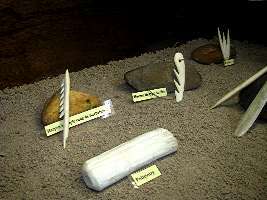 Spear points made with deer antler. Galet calcaire perforé à une extrémité, avec ébauche d'une autre perforation à la cassure. Les deux faces portent de fins traits gravés entrecroisés. Cette pièce ressemble à plusieurs autres datant du Magdalénien final et de l'Azilien connus en Périgord, dans le Lot, en Ariège et dans le Doubs. Longueur 41 mm. Musée du périgord. Calcareous pebble perforated at one end, with the outline of another perforation at the other broken end. The two faces carry fine intersecting engraved features. 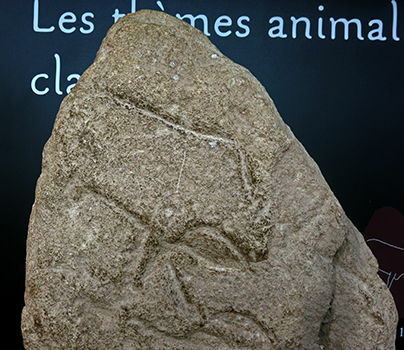 This piece resembles several others dating from the final Magdalenian and Azilien known in Périgord, in Lot, in Ariège and in Doubs. Length 41 mm. Musée du périgord. Spirale constituée d'un fil d'or enroulé en ressort pesant 18 grammes. Datant peut-être de l'âge du bronze, cet ornement fut trouvé dans une anfractuosité de la falaise au-dessus de la grotte du Grand Roc avec une rondelle d'ambre perforée et divers objets d'époques variées. Coll. J. Maury. 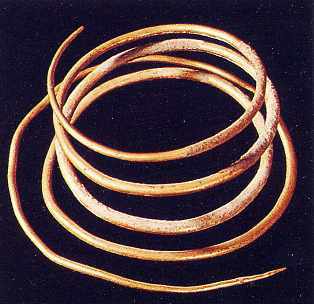 Spiral made up of a gold wire rolled up into a helix weighing 18 grams. Perhaps dating from the bronze age, this ornament was found in a crevice of the cliff above the cave of the Grand Roc with a perforated disc of amber and various other objects from a variety of times. Coll. J Maury. Foëne et harpons en bois de renne. On ignore si la foëne (à gauche) servait à pêcher, ou à chasser des oiseaux. Les têtes de harpons, emmanchées, ont pu servir à atteindre du gibier terrestre ou des poissons de bonne taille. Les harpons aplatis et perforés (à droite) sont du Magdalénien final ou de l'Azilien. Longueur du plus long harpon 171 mm. Musée du Périgord. Foëne (multi-pronged spear) and harpoons out of reindeer antlers. It is unclear if the foëne (on the left) was used to fish, or to hunt birds. 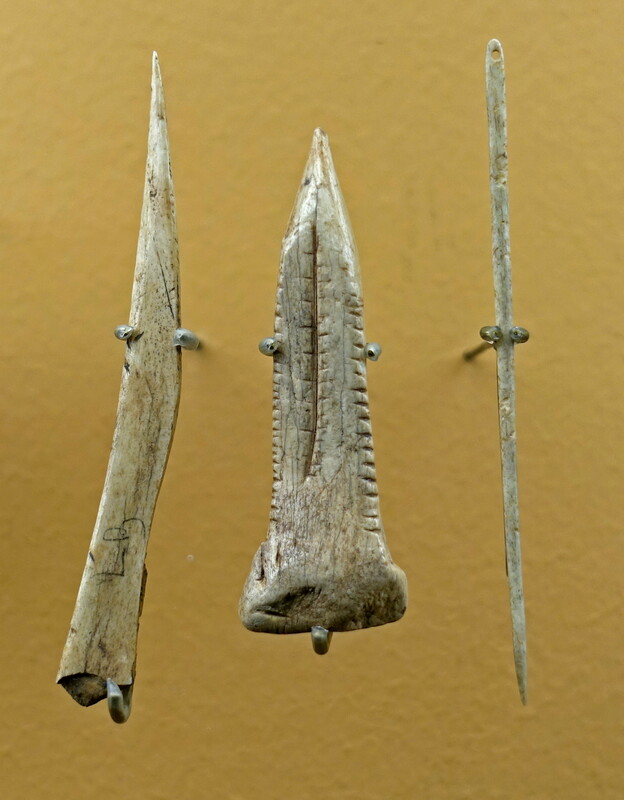 The heads of harpoons, fixed on a shaft, could be used to impale terrestrial game or fish of a fairly large size. The flattened and perforated (probably to accept a cord or leather thong attached to the throwing shaft) harpoons (on the right) are of final Magdalenian or Azilian (9 500 - 9 000 BC) age. Length of the longest harpoon 171 mm. Périgord Museum. Abri des Marseilles, during excavation. 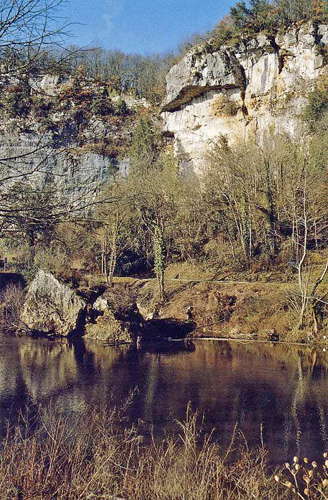 Laugerie Basse, on the right bank of the Vézère, 1200 metres from the Les Eyzies railway station, forms part of the commune of Les Eyzies-de-Tayac (Dordogne) and the place is famous as much for its wild and picturesque beauty, as the incomparable prehistoric gisement, still unexhausted, despite the excavations of the last sixty years. The Vézère river flowing at its feet dug a limestone valley, 80 metres deep, with vertical rock faces evident in many places, from le Moustier until the environs of Bugue. 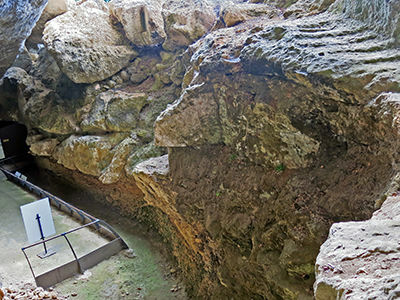 The work of water on these walls has formed caves and large abris or rock shelters that served as shelters and homes to our early ancestors, thus promoting a concentration of artefacts which was to become very important, if we base our assessment on the thickness of the prehistoric layers and the amount of collected objects. 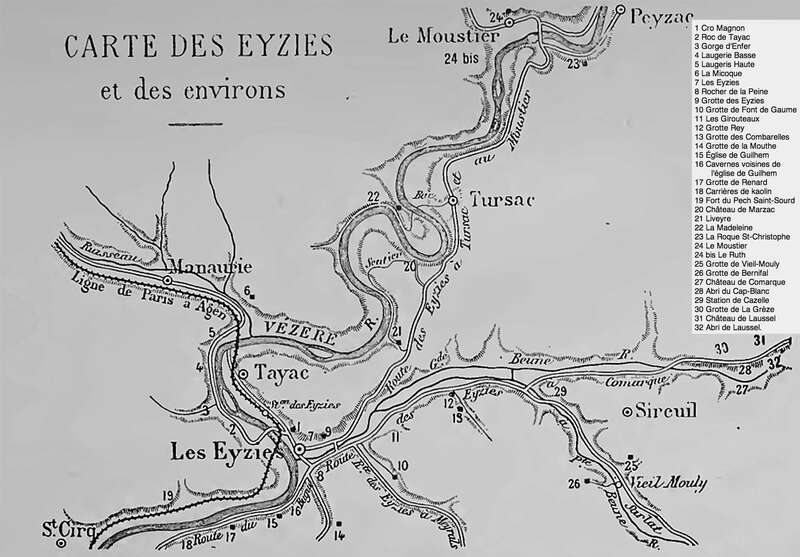 In his chapter from the Tour de France (Volume VI), 1912, Marcel Baudouin, has called this area the prehistoric capital of France. A felicitous phrase, for indeed, we encounter ancient remains everywhere we look, thanks to the natural rock shelters of the country. 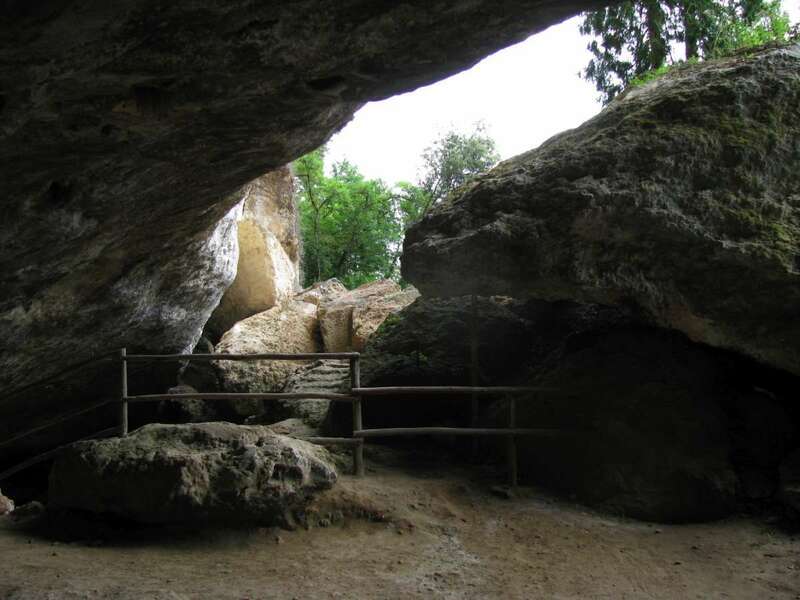 In this prehistoric capital, Laugerie was certainly in a privileged position, our ancestors were attracted by the huge shelters, the many springs gushing from the cliff, the hunting on the top of the plateaus and the fishing at their feet. 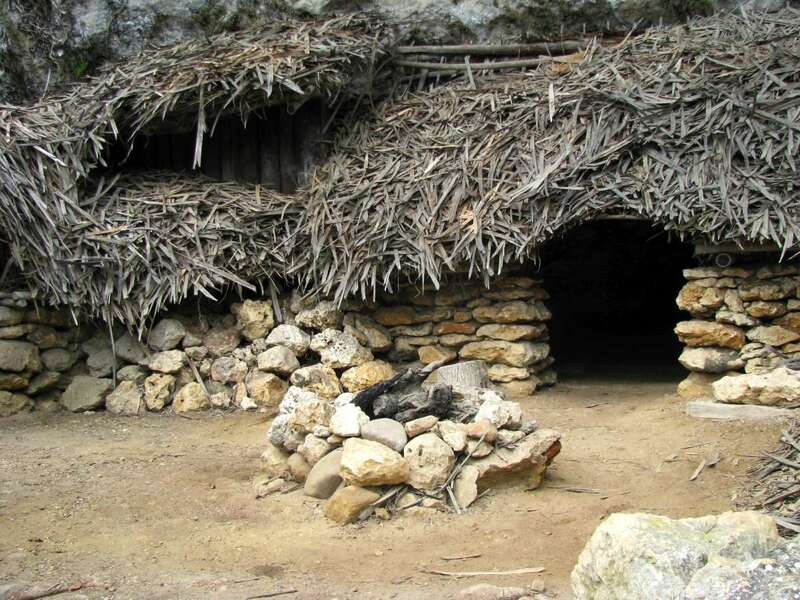 The orientation also is excellent, and if the habitation was ideal for the Magdalenian, we can say that it was also so for their descendants, since many collected artefacts indicate an uninterrrupted occupation up to the present day. The cabin replaced the hut, it gave way to the cottage and the latter to the house. Currently, the house is more comfortable, but it retains its original character, as its roof, or at least part of it, is formed by the rock itself. 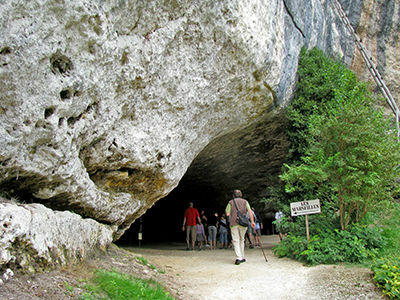 Two large arched cliffs, several hundred metres long, about 20 metres deep and 15 metres in height, form Laugerie Basse. 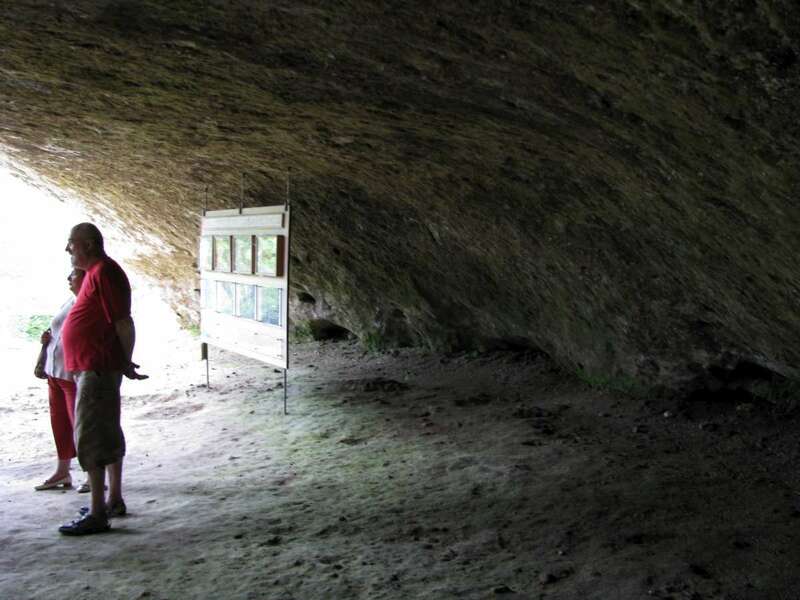 One of these arches, forming a traditional abri or rock shelter, particularly drew the attention of scientists and others who since 1862 have come here to excavate. Messieurs Ed. Lartet and H. Christy, the Marquis de Vibray, L. Landesque, Elie Massenat, L. Delpeyrat, Michel Hardy, Gustave Marty, Emile Riviere and Paul Girod were the main excavators. A quantity of objects of great interest was recovered. 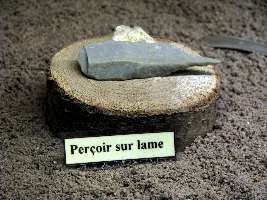 Part of this hoard was disseminated in private collections, and the rest, the more important, is a major attraction in the prehistory section of our Musée d'Archéologie nationale et Domaine national de Saint-Germain-en-Laye. In London, the British Museum also possesses a very important collection. 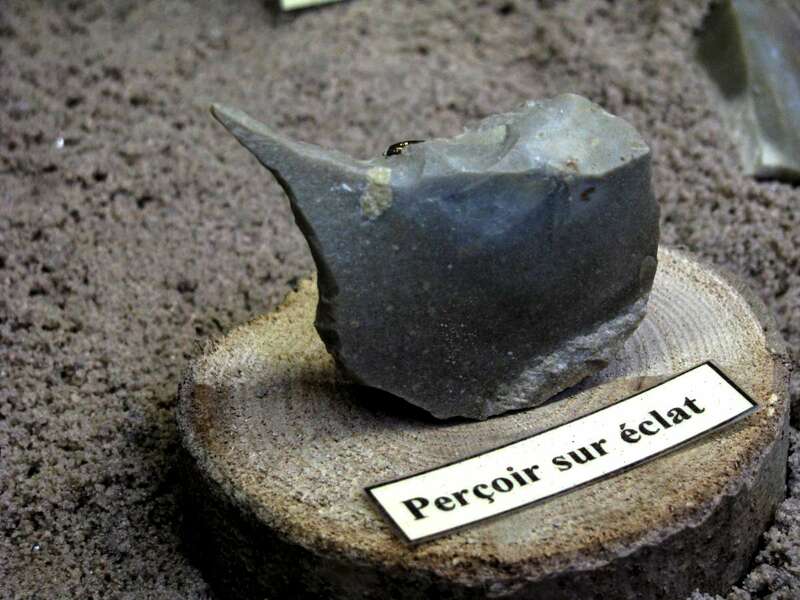 The Museum of our department administrative centre, Périgueux, is distinguished by the fine collections of the excavations of Louis Landesque and Michel Hardy. 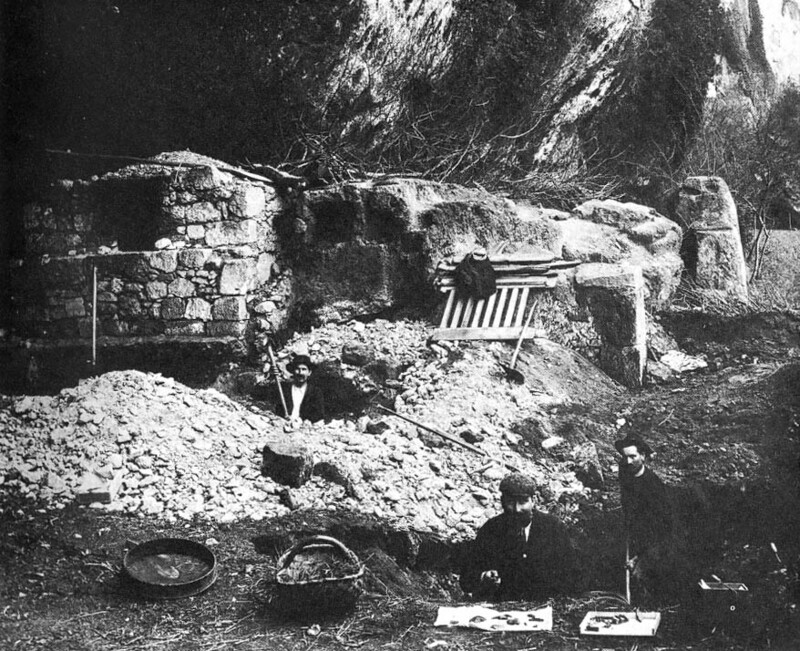 More recently, around 1907, the Swiss commercial archaeologist Otto Hauser (he sold most of what he found - Don ) rented Laugerie Basse for three years. 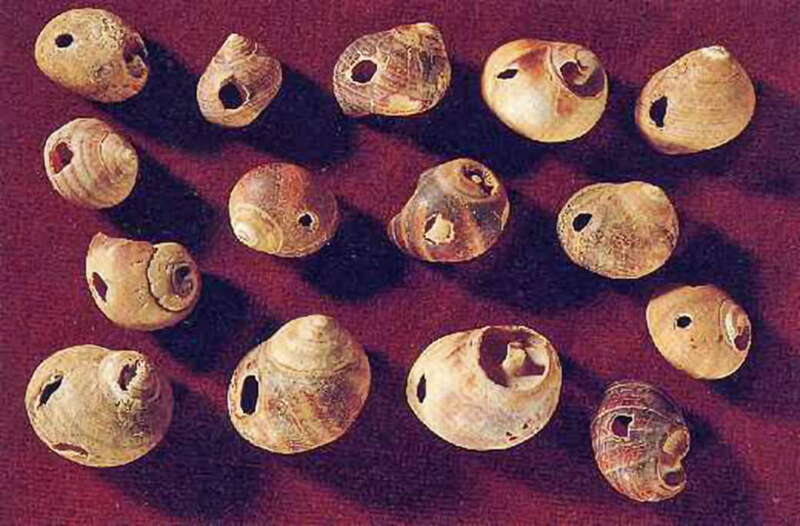 The excavations were very fruitful, and most of it was shipped to Germany to be sold. A native of the area, and returning to live there after a long absence, I learned in 1912 that the Langlade property , including the two large shelters cited above, would be sold or at least re-let to Otto Hauser. I reported the danger of this to my distinguished friend, M. le commandant Cazenave, Member of the Societé Préhistorique Francaise, who in turn reported it to the Society, and especially to MM. Hue and Baldwin, Council members. Quickly, thanks to them, M. Le Bel (Honorary and acting President of the Societé Préhistorique Francaise) was informed and they decided to rent the Langlade property, with promise of sale, with the intention of recommencing excavations. The excavations began in the spring of the year 1912. M. Le Bel was willing to entrust us with its direction. This was facilitated for us in the beginning by M. Peyrony, who helped us with his advice, while lending us some of his staff. We soon saw that the success of a search in the part of the abri under the vault was possible only with the complete demolition of an old barn, a place not excavated by our predecessors. For this, the purchase of the property was required. On the instructions of M. Le Bel, confirming this purchase, the work began. On digging a trench parallel to an old wall, and perpendicular to the base of the shelter, we found that the untouched portions were more important than we at first supposed. 1. A first brown archaeological layer of 10 cm to 25 cm thick. 2. Above that, a sterile layer 20 cm thick. 4. Finally, a third archaeological layer on average 30 cm thick, brown in front, reddish behind. No. 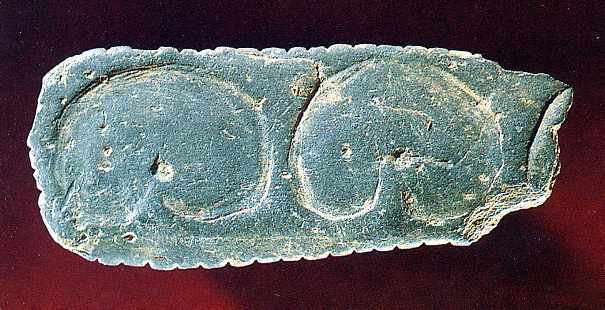 1: Fragment of a semi-cylindrical rod, (baguette demi-ronde), decorated with two stylised engravings of birds and arranged symmetrically. No. 2: Sculpture in the round representing a lizard. This very interesting piece is sculpted in reindeer antler, and it seems not to have been finished, either because the material selected was not sufficient for the complete sculpture, or the artist broke the piece while making it. Its discovery we thought at first extraordinary, and, if it had not been made ​​in our presence, we would have thought it, at first sight, a hoax. 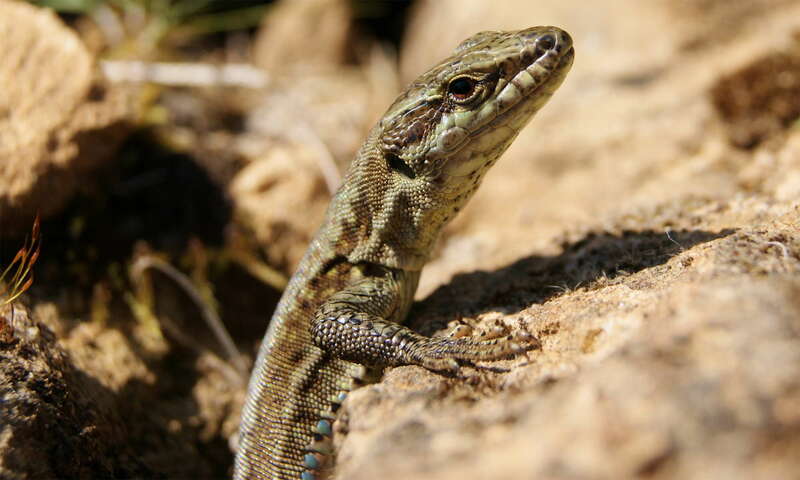 We did not know that in fact, these reptiles can live in a climate as cold as that currently existing in Lapland and that this climate regime applied to this region to the Magdalenian period. Our astonishment was short lived. The 'Larousse pour tous' indicates that the tiny lizard is common in Paris and its range extends even now to Lapland. No 3: Fragment of a spear thrower with hook which together represent the body of a horse. 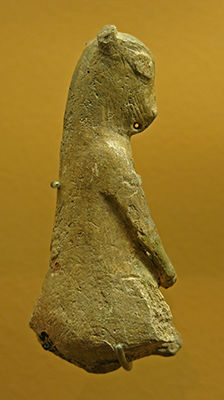 The very well sculpted head is bent down to form a hook, the front legs are elongated along the body, the hair of the flanks is indicated by a series of small zigzag lines. No 4: Engraving of a reindeer on a rib. Lacking the room, the artist could not represent the forelegs. 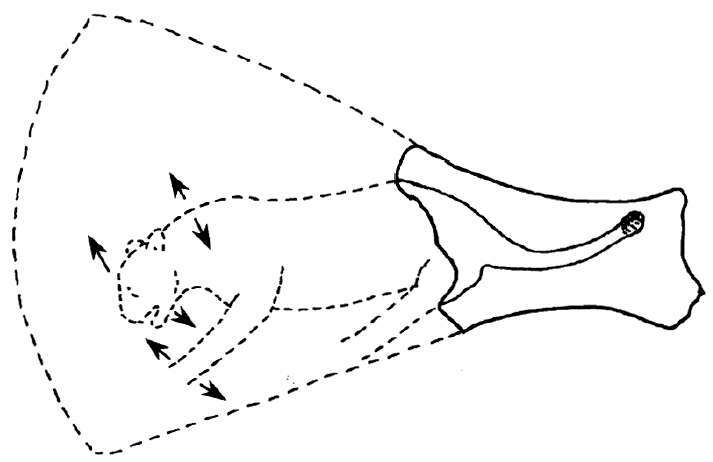 The animal is gallo g, legs outstretched behind, head up, the antlers stretched along the back of the animal. No. 5: Bone pendant, very finely ornamented. No. 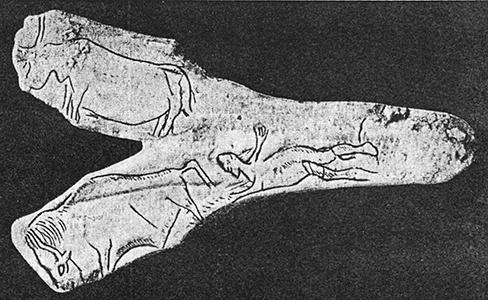 6: Fragment of a baguette with horse heads in bas-relief. All these pieces were collected in the second archeological level, except No. 1 which comes from the upper level, and the No. 5 we found under the site of the old furnace/oven and to which we cannot assign an exact place in the coupe. A lizard on a pile of rocks in the Dordogne, quite possibly the same species as in the carving No 2 above. Boring a tunnel 11 metres long, below the large blocks from the collapse of the front of the shelter, and strengthened by strong concrete pillars, took us to the northern extremity of the excavation, about 4 metres below the upper level. 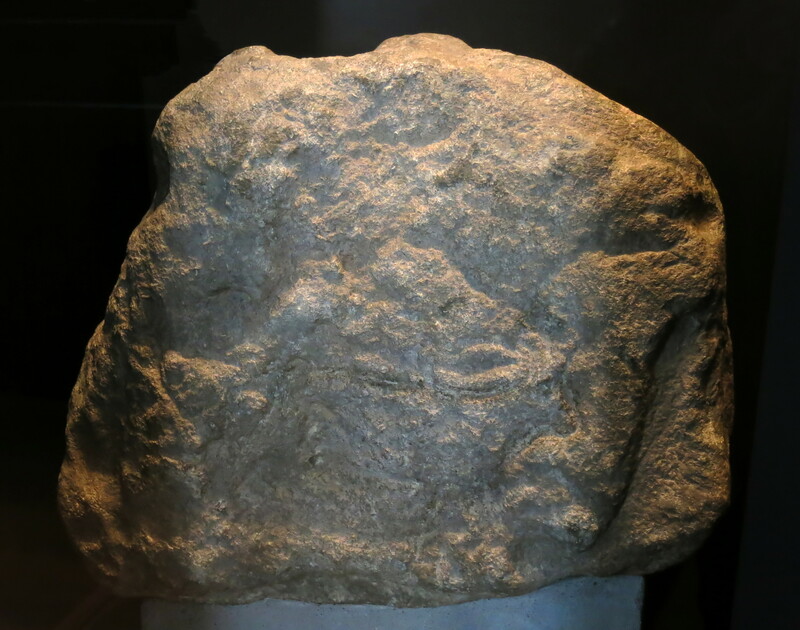 Il y a environ 10 000 ans, sous l'abri des Marseilles, un premier éboulement, sans doute brutal, a fait tomber une partie de la voûte sur le sol d'habitat préhistorique. Un autre éboulement se produisit il y a 4 000 ans à la fin du Néolithique, et d'autres ensuite, peut-être aux époques historiques. Sur la gauche on aperçoit le débouché du tunnel de 11 mètres de long, creusé sous les blocs éboulés, pour atteindre la zone à fouiller sous l'abri. Approximately 10 000 years ago, under the shelter of Marseilles, a first fall of rock crashed down on the area occupied in prehistoric times. Another fall occurred 4 000 years ago at the end of the Neolithic era, and others since, perhaps during historical times. On the left can be seen the entrance of the tunnel which is 11 metres long, dug under the fallen boulders to reach the zone to be excavated under the shelter. The sweet water spring shown further up this page is on the lower level in the background of these photos, a little further along the abri. 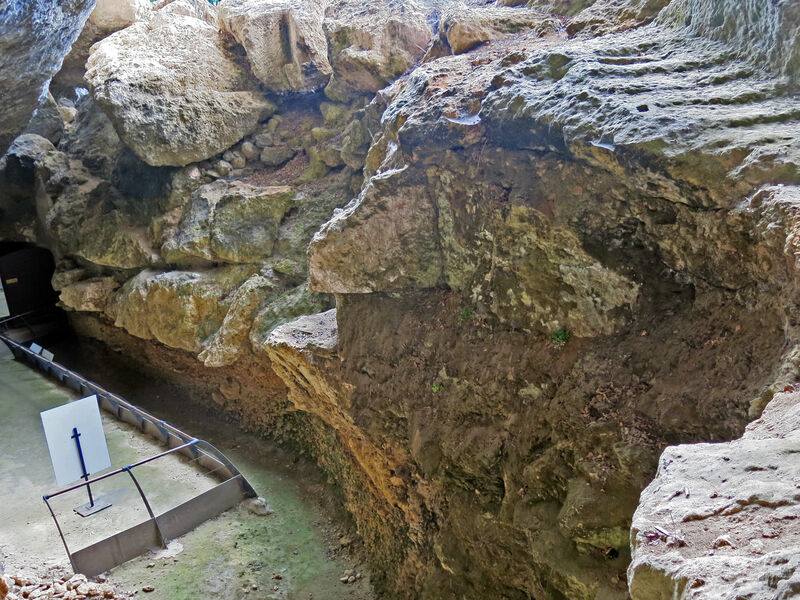 The huge rocks shown here detached from the cliff towards the end of the Magdalenian. If there was anyone here at the time, it must have been a terrifying experience. It may well be that some survived to tell the tale, if they were sufficiently close to the back wall of the abri. Not surprisingly, the Magdalenians abandoned both abris after this event. 1. 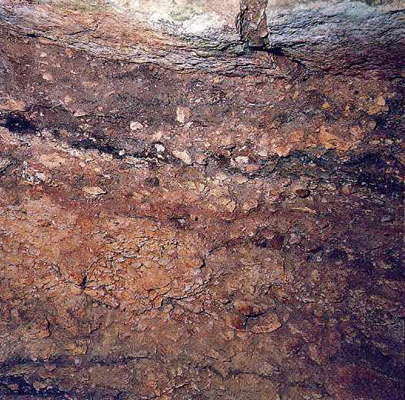 A lower Magdalenian layer of reddish colour with traces of hearths between 30 to 40 cm thick. 2. A sterile layer 60 cm thick, formed by the erosion of the vault. 3. A middle Magdalenian layer, the same reddish colour as No. 1, with a thickness of 30 cm. 4. Some slabs of rock fallen from the roof. 5. 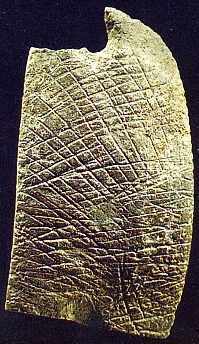 An upper Magdalenian blackish-brown layer, about 30 cm thick. 6. A bench of thick, unbroken limestone slabs detached from the overhang. 7. 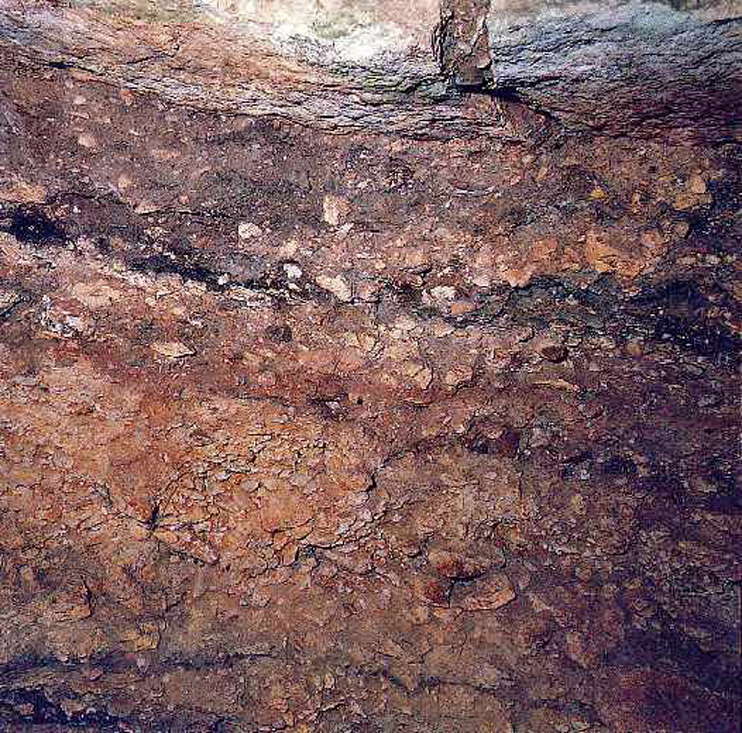 A Layer characterised by a greyish ash in great abundance, representing the Neolithic. 8. Finally, a huge mass of rock detached from the cliff. These rocks have been used in part, during the middle ages or earlier, to serve as very primitive housing. 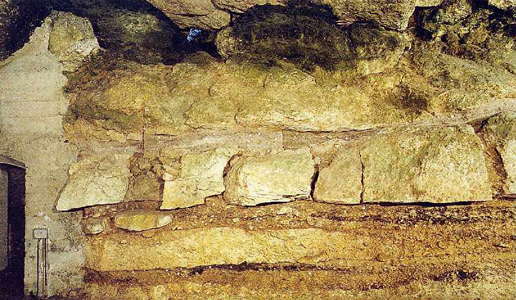 At their base, in a clayey and stony layer, we found the presence of remains dating to the Neolithic and Gallo-Roman. 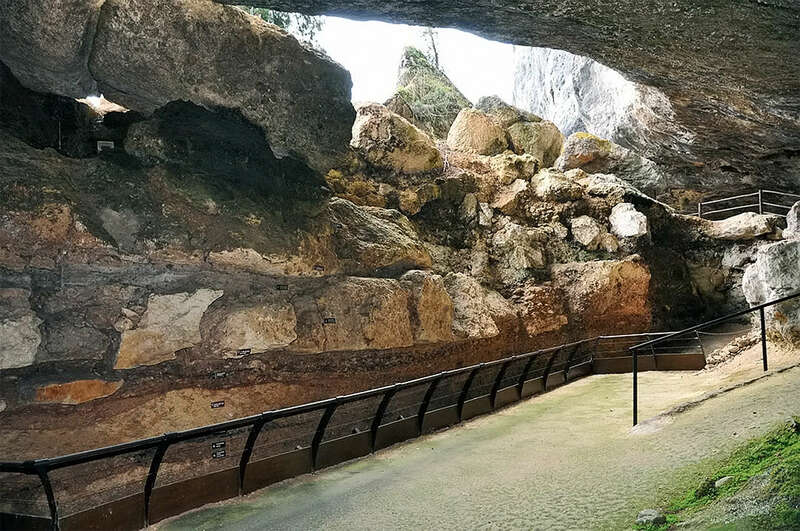 The abri extends over a length of at least 50 metres and its wider portion towards the middle, lies 15 metres below the rock which serves as a ceiling. 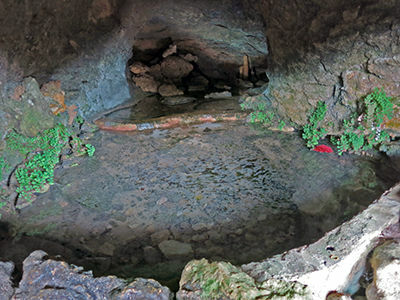 An abundant spring, previously covered by debris was found. 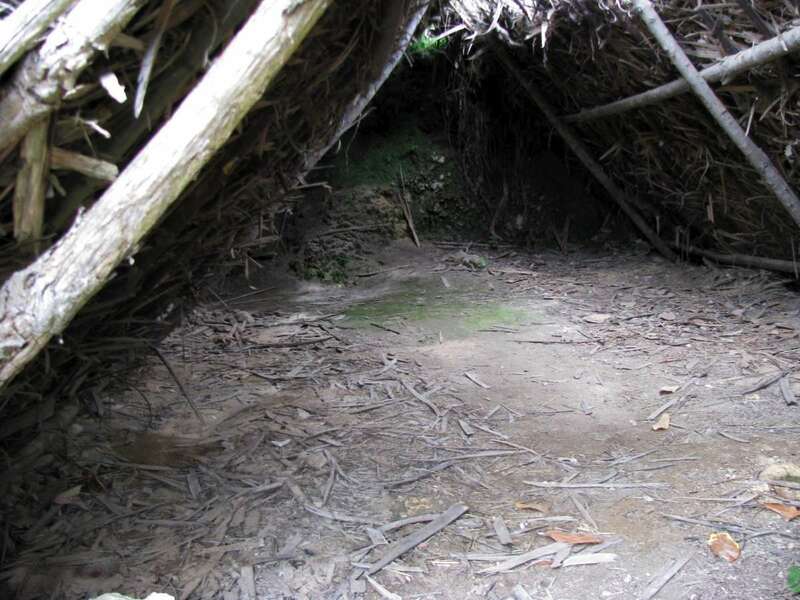 This discovery is all the more interesting, since it proves to us once more, that our ancestors looked for shelters favoured by water, that they were able to find these without difficulty, and that they had choice even in their dwelling places. 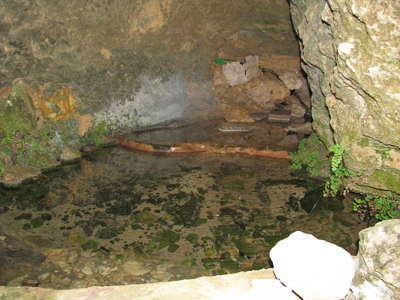 This is the spring in l'abri des Marseilles, which runs year round, and would have been a real bonus for the inhabitants. The water is sweet and good. Springs like this are formed when water percolating down through the porous limestone meets an impermeable layer of clay or marl (limestone mixed with clay). 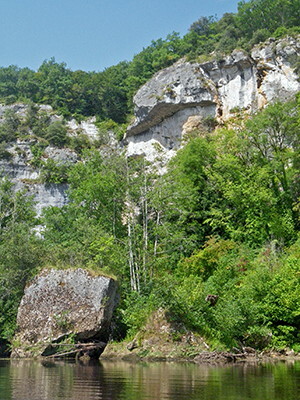 The geology of the whole Vézère area, with horizontal, impermeable clayey (marl) layers below the limestone close to river level, leads to the formation of an abri because of the moisture which aids in the solution of limestone at the base of the cliffs, and promotes frost shattering of the moist limestone surface during cold periods, considerably deepening the abri. 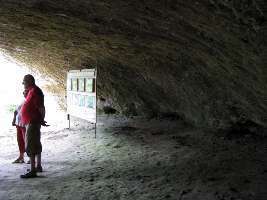 It also provides a living space protected by an overhanging vault which protects from rain and snow but provides light and air, and providentially provides a place for water percolating down from the plateau above to seep out of the cliff in a spring, conveniently just at the base of the abris. 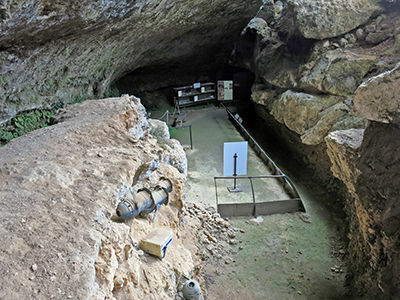 A considerable number of artefacts has been recovered, and various Magdalenian levels were identified, results which were consistent with the findings in the nearby classic shelter. It should be noted that during August and September, we had the pleasure of a visit by M. Adrien de Mortillet, Honorary President of the Societe Préhistorique Française, who came at the invitation of M. Le Bel to make some personal searches. This visit allowed M. Mortillet to recognise the importance of this new site. 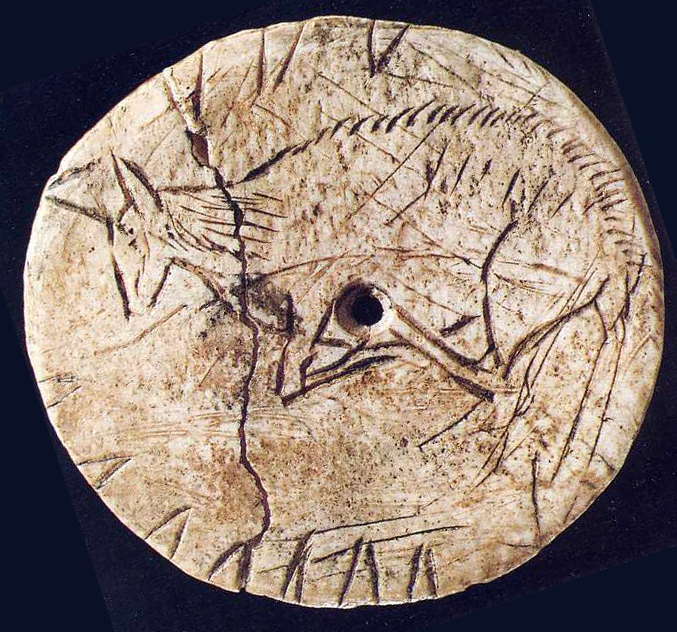 In his meticulous excavations, he had the good fortune to collect a very interesting piece (a wood carving of a reindeer in the round representing a reindeer head) of surprising reality and executed by an artist of real talent. This piece, of which we have a cast, comes from the Magdalenian, although at the time of the visit of our illustrious colleague we had not yet ascertained this fact. It should also be noted that we found an iron hook in the deposits, and M. Mortillet identified it as having been dropped by M. Delpeyrat, who died in 1896, in a previous excavation here. Hook dropped by M. Léonard Delpeyrat at Laugerie Basse. (The background here is that in 1863 Edouard Lartet, an eminent palaeontologist, arrived in Les Eyzies with his English friend and patron Henry Christie. They had come to visit the so-called 'Richard cave' in Les Eyzies but were taken to other sites of the Vézère valley. Laugerie Basse and its prehistoric remains came up to their expectations. M. Léonard Delpeyrat was an eccentric troglodyte, yet a patient and insightful excavator, and was well known in the region. 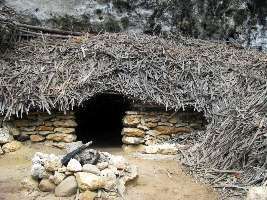 Living in a hovel pressed against the rocks of Laugerie Basse, he engaged eagerly in search of antiquities, and we saw his little head with his elongated weasel face, his intelligent eyes , wearing a cotton nightcap, a lamp in hand, crawling through tunnels he dug under his house or nearby. He seemed to us to possess the striking appearance of a prehistoric man, returned after many thousands of years, scraping the ancestral hearths for booty. 1. Bone baguette with beautiful ornamental design very clear and finely engraved. 2. 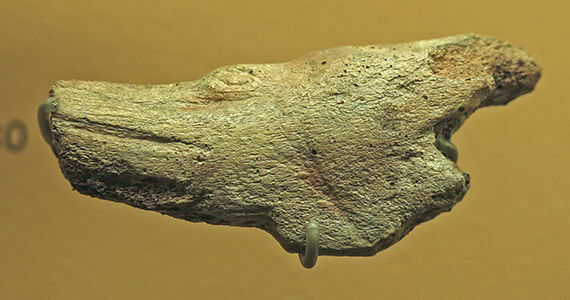 Smoother or polisher in bone, perfectly preserved, with ornamental design at the top, and in the middle an engraved horse head, whose muzzle is curiously adorned with a tuft of hairs. 3. the opposite face of the same smoother showing engraved ornamentation. 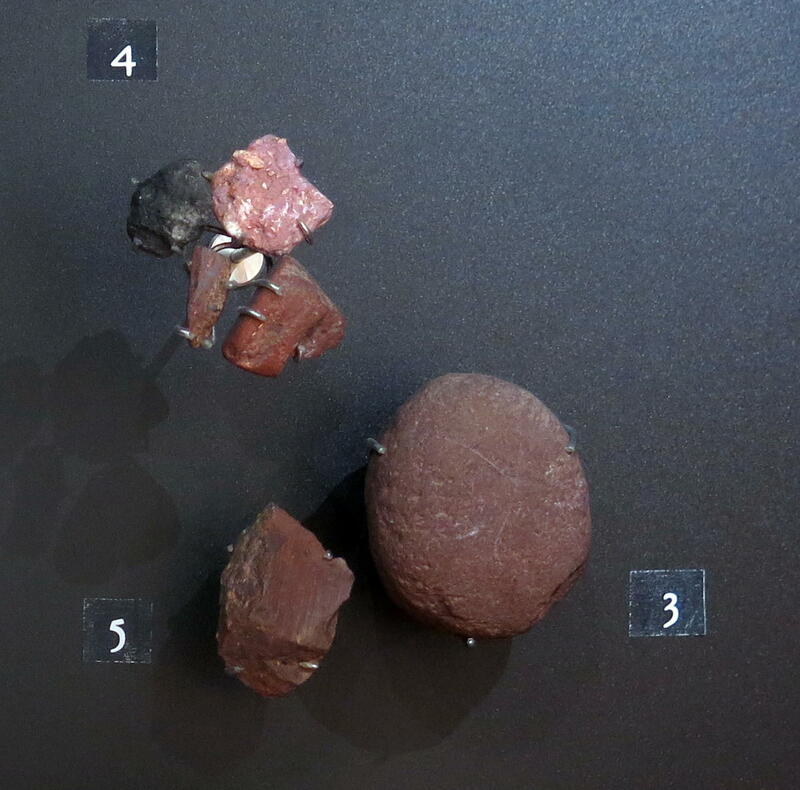 These two pieces come from the excavation of l'abri des Marseilles and from the second Magdalenian level. 4. Horse head carved in reindeer antler. The artist has cleverly taken advantage of the shape of the antler and brought all his attention to carving the nose. This piece was found in the remains of a layer near the old oven, a layer which had been preserved to this day by a large block of stone that we blew up. 5. 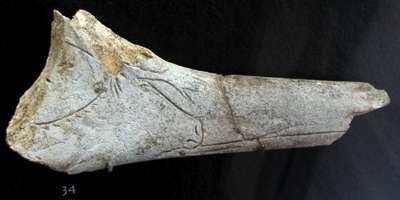 Engraving on bones from the second Magdalenian level of the abri des Marseilles excavations and representing a bird of the order of waders. 6. 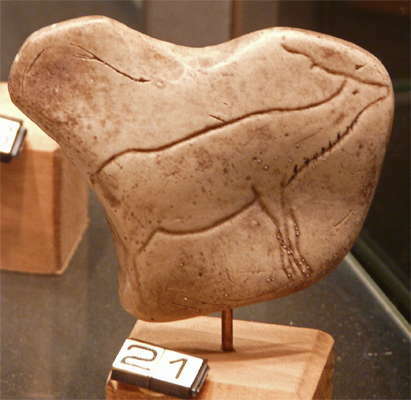 Engraving of a reindeer on a flat limestone pebble from the middle Magdalenian from the excavations called 'de la Grange'. This engraving, with a perfect purity of line, is one of the finest known specimens. 1. 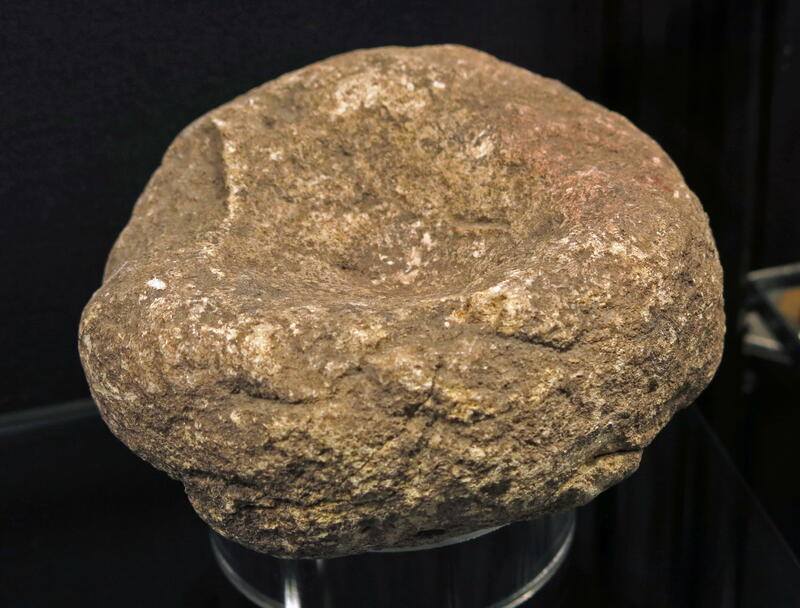 Needle polisher in granite, with traces of use in forming bone needles on three sides. 2. 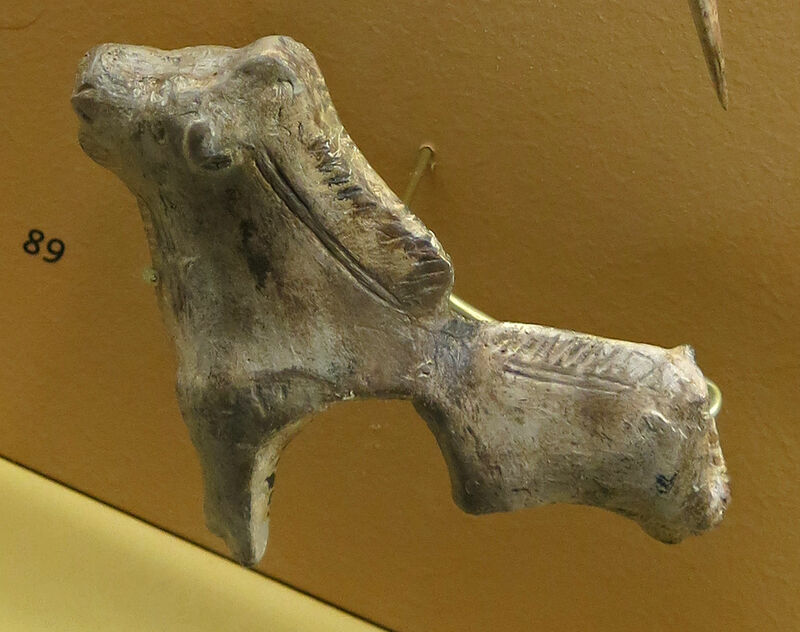 Carving in bone representing a horse and a reindeer arranged back to back. The poor condition and age of the material was the cause of the disappearance of the heads of the animals. We must remark, however, on the clean lines of the engraving and the masterfully executed hindquarters of the horse. 3 and 4. 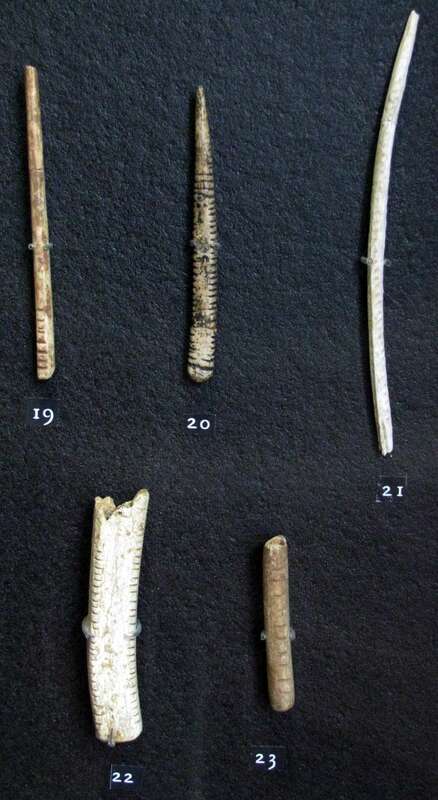 Specimens of bird bones with many nicks cut in them, probably used for making jewellery: necklaces, bracelets, etc. 5. Fragment of a baguette with engraving forming ornamentation, whose work is very fine and neat. 6. Engraving on a piece of rib showing a hand holding a trident. 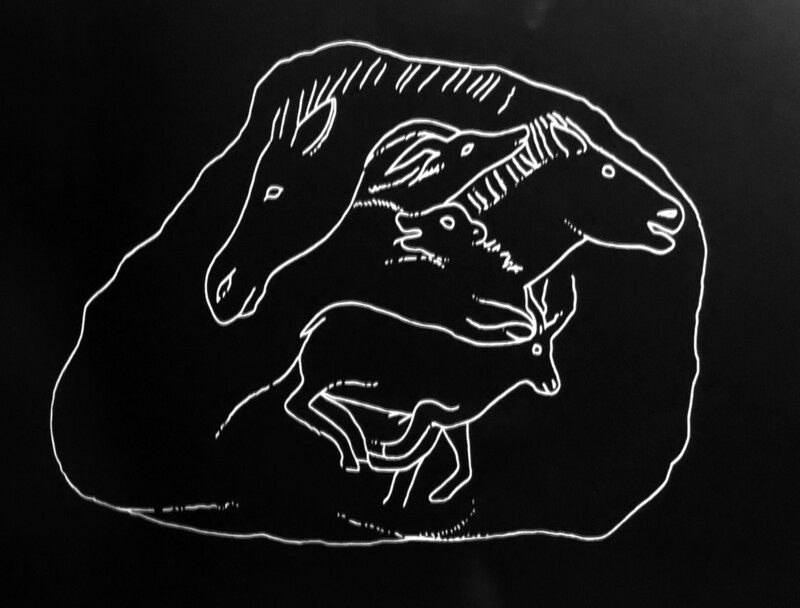 It would be foolhardy to give a precise explanation of this engraving, but the opposite side represents a pattern of ornamentation of nine wavy lines, similar to designs on the walls of the caves of Altamira, Hornos de Pena and Gargas, as reported by MM. Cartailhac, Breuil and F. Regnault. 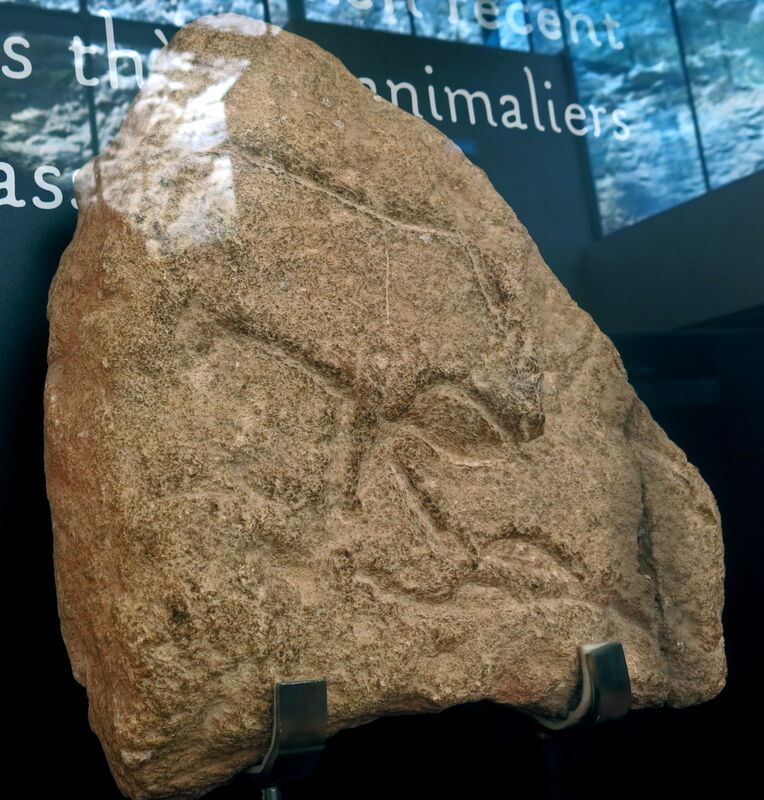 We believe this piece could have had a mysterious and magical meaning for our ancestors. 7 and 8. Gray flint blades, the edge has been retouched in a sawtooth. 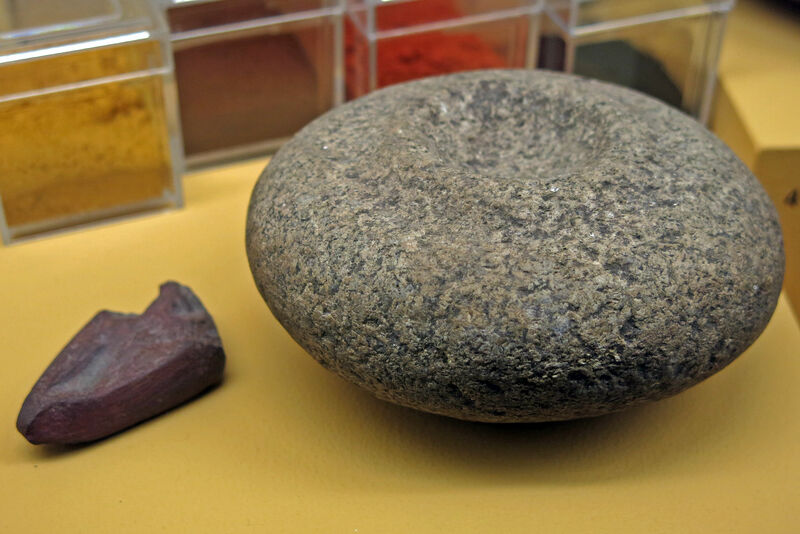 These are the only two examples encountered in a considerable amount of flint. 9. A beautiful bone poinçon or punch, decorated with four rows of notches, including two of parallel lines and two other rows forming many V shapes. Piece No. 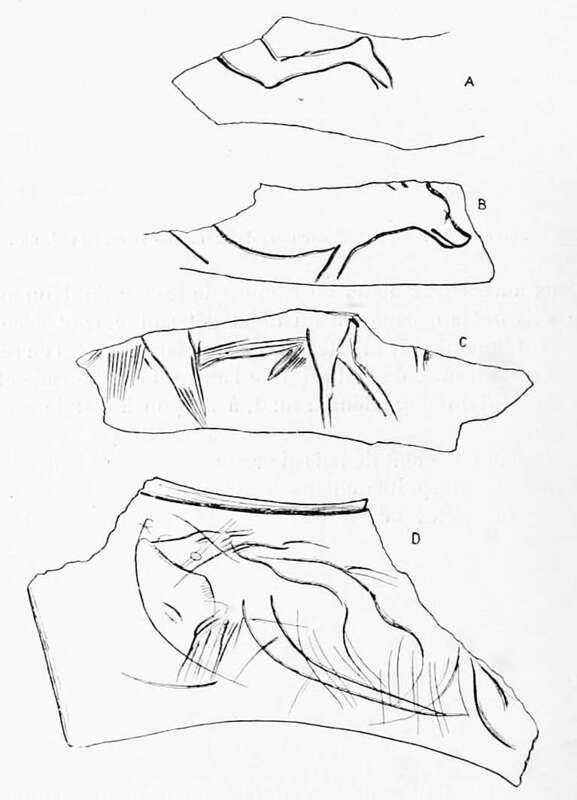 1 of this plate was found in the upper Magdalenian layer of l'abri des Marseilles; pieces 2, 5, 7 and 8 from the middle Magdalenian, and piece No. 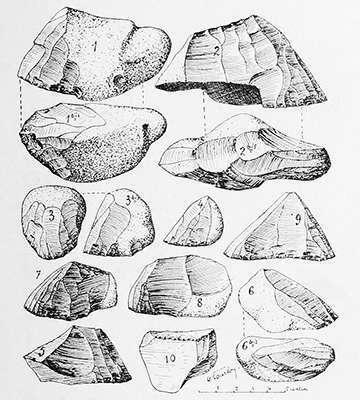 9 from the lower Magdalenian. Finally pieces 3, 4 and 6 were found in the Magdalenian level known as 'the old oven'. Formation of abris. Laugerie Haute and Laugerie Basse were formed with method 1, frost action. There is a marly, clayey, impermeable to water limestone layer near the river level at these abris, which stops the percolation of water. When this water seeps out of the porous limestone and freezes on the surface, frost action breaks off small grains or even large slabs of limestone, and the abri deepens over time. Many of the following photos and associated text come from Roussot (2000). My thanks to Anya for this resource. 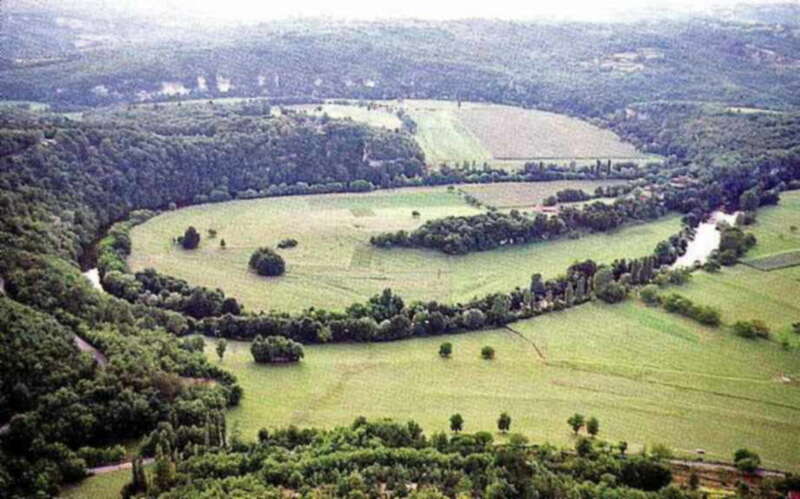 Vue aérienne de la vallée de la Vézère, de l'amont vers l'aval. Les falaises de Laugerie-Haute et Laugerie-Basse sont tout au fond de la vallée. Au premier plan, le cingle de Marsac décrit une boucle ou méandre de deux kilomètres de développement. Aerial view of the valley of the Vézère, from upstream towards downstream. The cliffs of Laugerie-Haute and Laugerie-Basse, with L'abri des Marseilles between the two, are all at the bottom of the valley, and may be seen in the background. In the foreground, le cingle de Marsac describes a loop or meander of two kilometres in size. 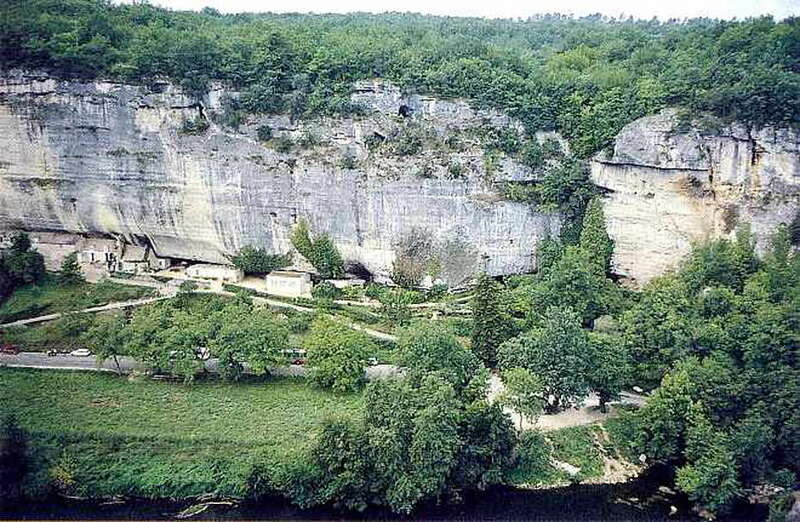 Vue aérienne de la falaise du Grand Roc et de Laugerie Basse, sur la rive droite de la Vézère, visible en bas de la photographie. L'abri des Marseilles est en contrebas de la fracture de la falaise, sur la droite. 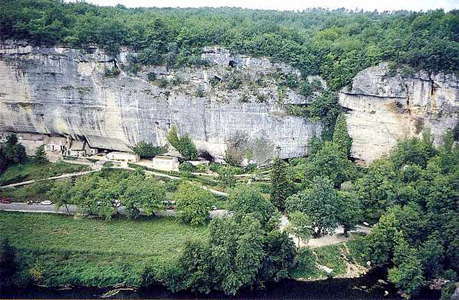 Aerial view of the cliff of the Grand Roc and Laugerie Basse, on the right bank of the Vézère, visible at the bottom of the photograph. The shelter of Marseilles is below the break in the cliff, on the right. Falaise de Laugerie-Basse entre l'abri classique, au fond, et l'abri des Marseilles, en arrière de la vue. 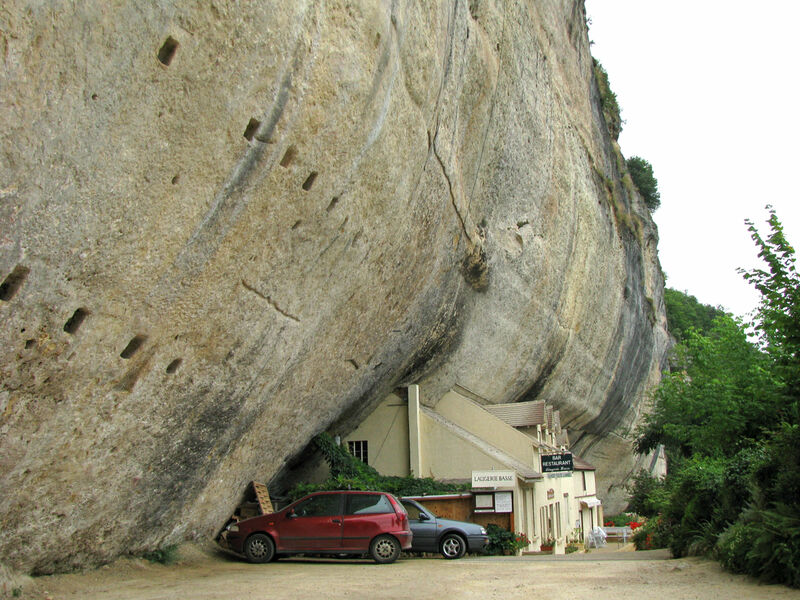 Les rainures horizontales, taillées de main d'homme sur la paroi rocheuse, correspondent à des "larmiers" destinés à empêcher les ruissellements d'eau dans les maisons autrefois adossées à la falaise. Cliff of Laugerie-Basse between the shelter of Marseilles and the classic abri or shelter of Laugerie-Basse. 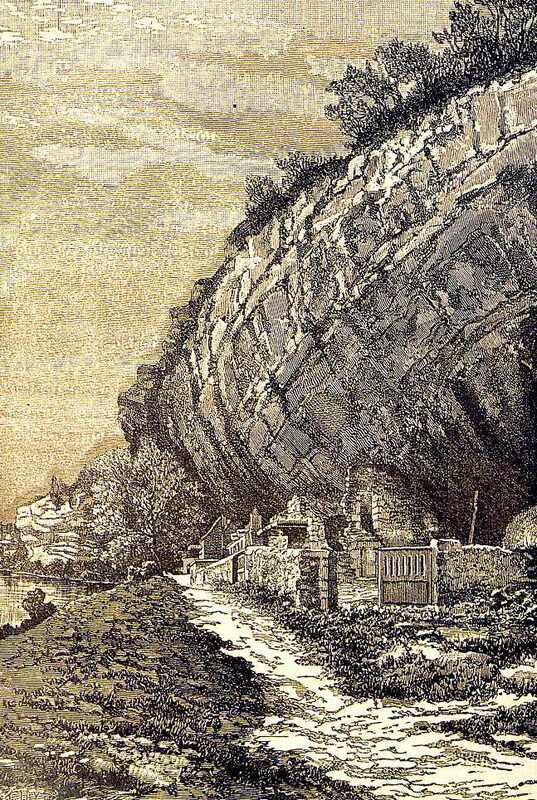 The horizontal grooves, cut by hand on the rock face, are in the position of former 'drips' and are intended to prevent rainwater trickling down the cliff streaming into the backs of houses formerly leaned against the stone shelter. Presumably lead sheet or something similar was pushed into the grooves, lapping over the roofs of the houses, forming what is called 'flashing'. La falaise au niveau de l'abri des Marseilles dont le creux est partiellement masqué par un chaos d'énormes blocs éboulés. Ici, la falaise calcaire est fragilisée par des fissures (diaclases). Au sommet, on remarque une visière rocheuse qui s'éboulera un jour à son tour. 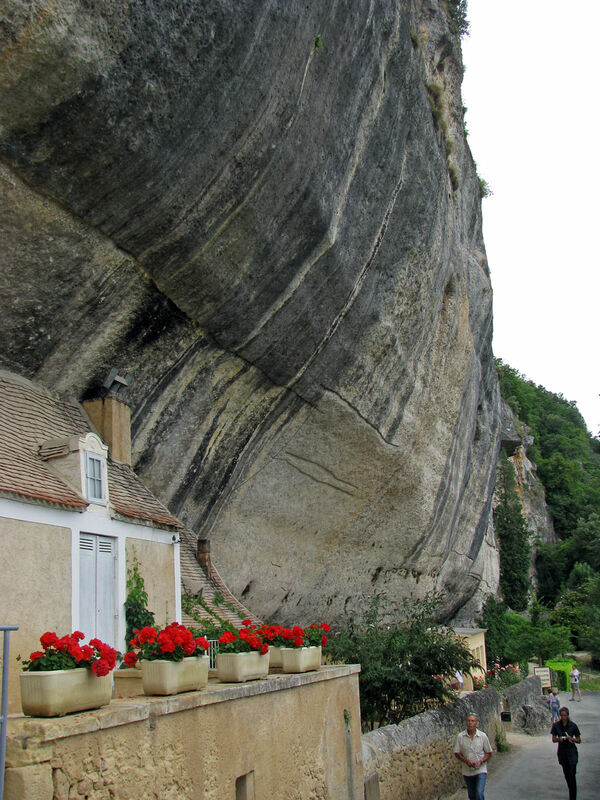 The cliff on the level of the shelter of Marseilles of which the hollow is partially masked by a chaos of enormous tumbled down blocks. Here, the calcareous cliff is weakened by cracks. At the top is a rock overhang which will one day also fall down. Abri des Marseilles à Laugerie-Basse. 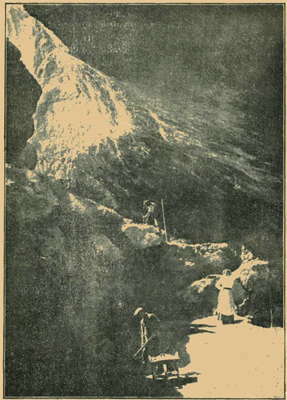 Coupe perpendiculaire à l'abri, publiée en 1914 par A. de Mortillet. brownish layer with magdalenian artefacts. 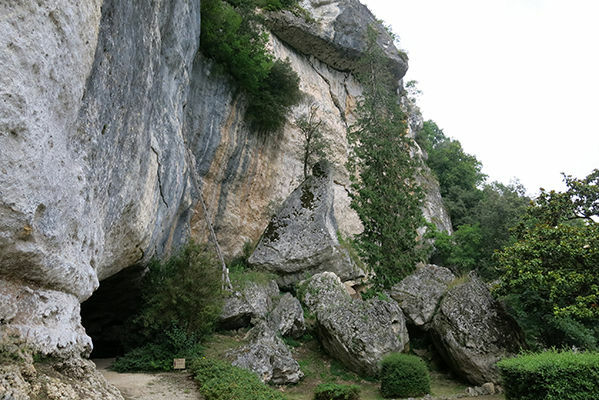 Les rochers détachés de la falaise au niveau de l'abri des Marseilles ont déboulé jusque dans la Vézère. 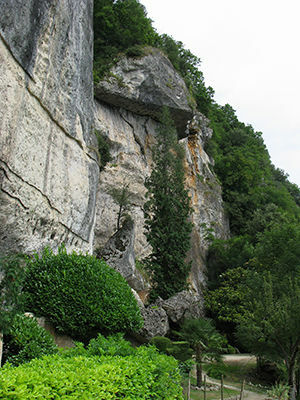 Some of the rocks which have dropped from the cliff above the shelter of Marseilles have crashed to the ground and then rolled as far as the Vézère river itself, as can be seen in this photograph. Photographie datant probablement de la fin du siècle dernier, prise entre l'abri classique et l'abri des Marseilles, près d'un ancien four. On y voit de quelle manière anarchique travaillaient les fouilleurs, creusant des trous et des galeries à la recherche des objets. 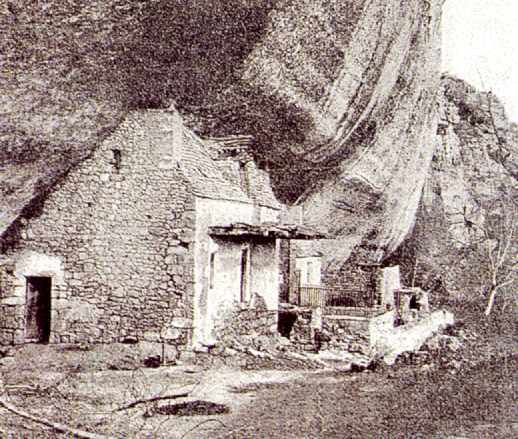 A photograph probably dating from the end of the 19th century, taken between Laugerie Basse and the shelter of Marseilles, close to an old furnace. This photo shows how anarchistically the diggers worked, digging holes and galleries to find out about the area, without modern disciplines for such research. 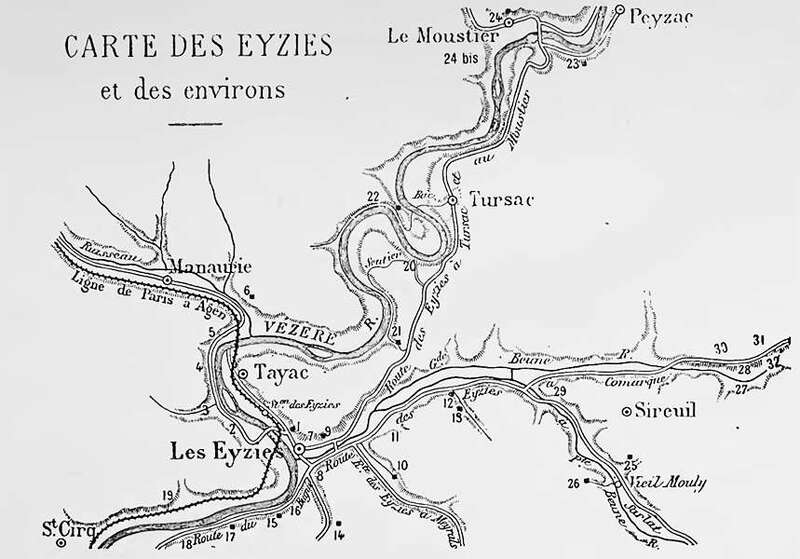 La coupe stratigraphique sous l'abri des Marseilles. 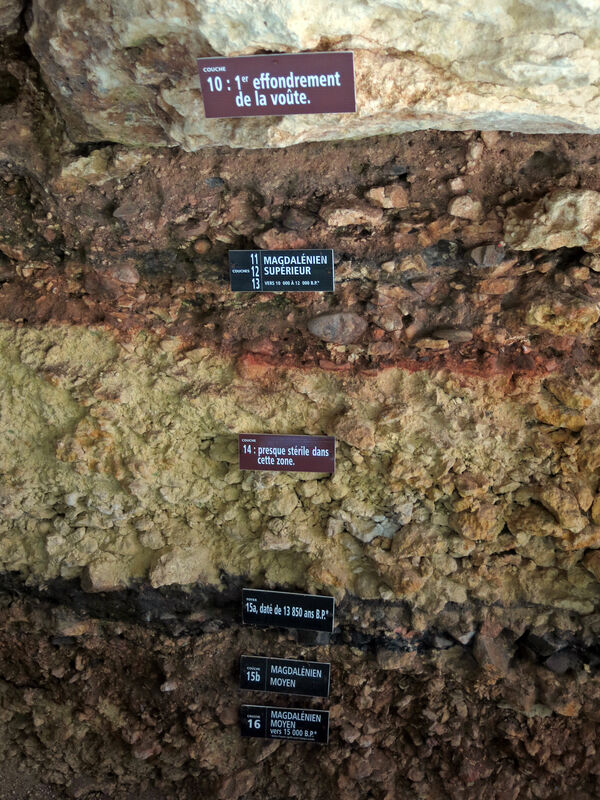 This excellent photograph and text details the ages of the various layers in the stratigraphic cut under l'abri des Marseilles. 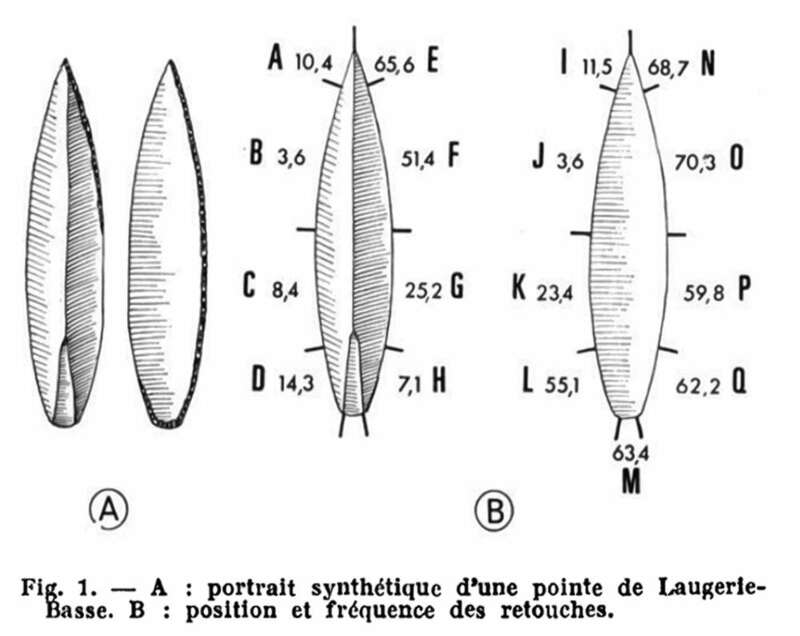 Schematic coupe of the gisement under the abri des Marseilles at Laugerie-Basse, by S. Blanc, using data provided by J. Maury. Détail de la coupe stratigraphique sous l'abri des Marseilles. On note la présence de galets de rivière rapportés sous l'abri. De minces niveaux noirs correspondent à des foyers. 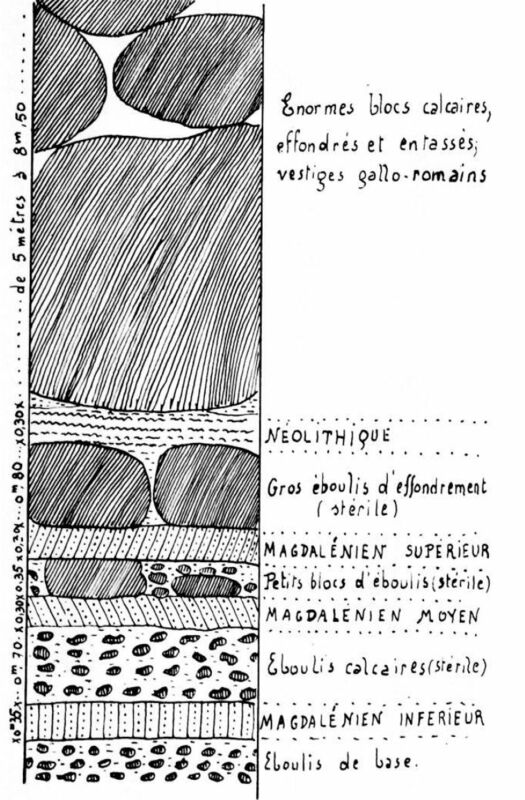 Detail of the stratigraphic cut under the shelter of Marseilles. Notable is the presence of river stones under the shelter. Several black layers or lenses seen here correspond to hearths. Coquillages perforés, probables éléments de parure. Le premier en haut à gauche est une Purpura lapillus (pourpre petite pierre), les autres sont des Littorina littorea (littorines ou bigorneaux). Ces deux espèces sont d'époque quaternaire et proviennent du littoral atlantique. Musée d'Aquitaine. Perforated shells, probably used as ornament. 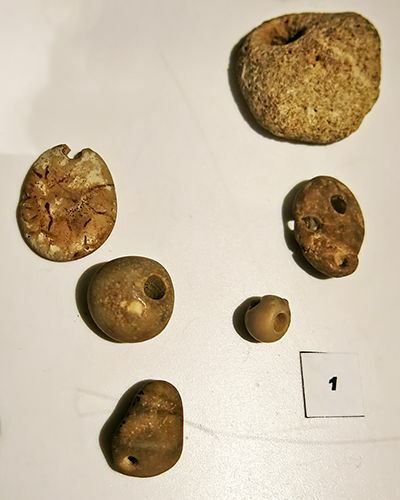 The first at top left is a Purpura lapillus, the others are Littorina littorea (winkles). These two species are from the Quaternary and come from the Atlantic littoral, that is, the edge of the sea. Musée d'Aquitaine. Poinçons en os et silex taillés du Néolithique final. La pointe foliacée, en bas, provient de la couche cendreuse (couche 7) de l'abri des Marseilles - Dessins de J. Roussot-Larroque). 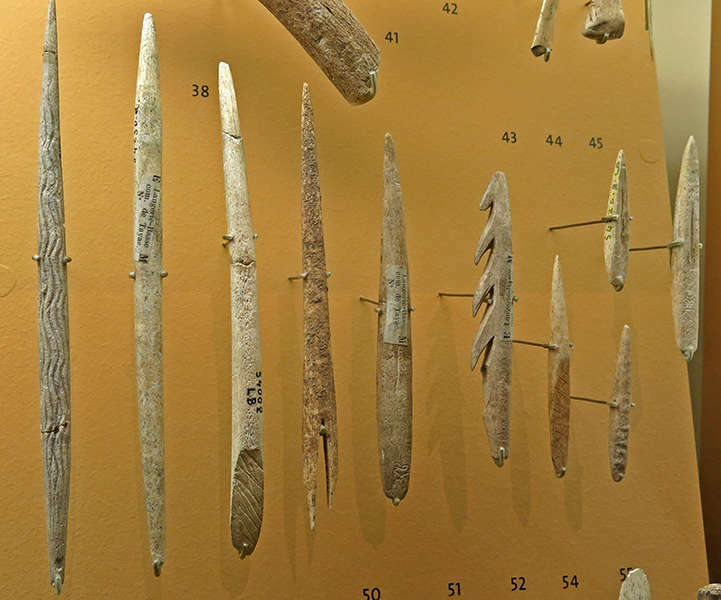 Bone awl and flints of the final Neolithic era. The foliaceous point, below, comes from the ashy layer (layer 7) of l'abri des Marseilles - Dessins de J. Roussot-Larroque). Poignard en silex trouvé sur la terrasse de l'abri classique. Ce type de poignard est caractéristique de la culture néolithique d'Artenac (vers 3.000 ans avant notre ère). Longueur 119 mm. Coll. G. Lagorce. Flint dagger found on the terrace of the traditional shelter. 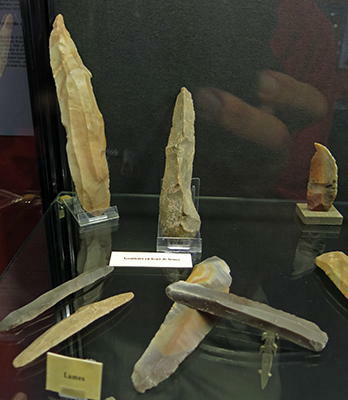 This type of dagger is characteristic of the Neolithic culture of Artenac (around 3 000 years BP). Length 119 mm. Longue côte animale décorée d'une vigoureuse gravure de bison dont la tête barbue est d'un style saisissant et dont la ligne dorsale, peu réaliste, ondule le long de l'os. Une autre tête de bison, sans barbe, est gravée sur l'autre face. Il peut s'agir d'un mâle et d'une femelle. Longueur 250 mm. Coll. P. de Vibraye. musée de l'homme. 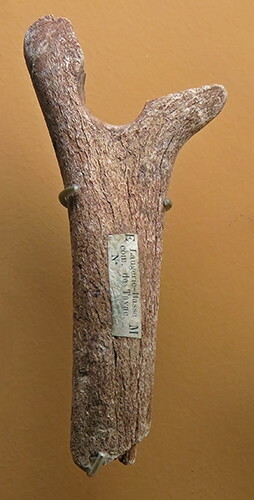 Long animal bone decorated with a vigorous engraving of a bison whose bearded head is of a gripping style and whose not very realistic dorsal line undulates along the bone. Another bison head, without a beard, is engraved on the other face. 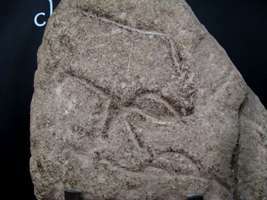 The engravings may be of a male and a female. Length 250 mm. Coll. P. de Vibraye. Musée de l'homme. Bordes F., Deffarges, R., de Sonneville-Bordes D., 1973: Les pointes de Laugerie-Basse dans le gisement du Morin. Essai de définition.Bulletin de la Société préhistorique française, Comptes rendus des séances mensuelles. 1973, tome 70, N. 5. pp. 145-151. Breuil, H., 1949, Beyond the Bounds of History, London, P. R. Gawthorn, Ltd. 100 pp. Crémades, M., Laville H., 1995, Le félin gravé de Laugerie-Basse: à propos du mouvement dans l'art paléolithique. PaléoNo. 7, 1995. pp. 259-265. 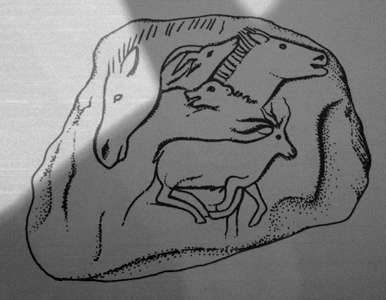 Graziosi, P., 1960, Palaeolithic Art, London, Faber. 306 pp. 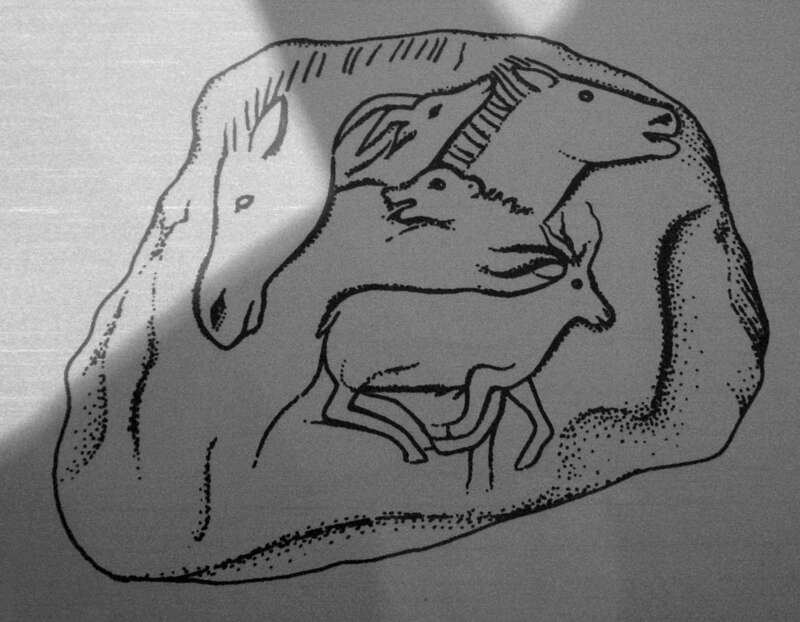 Guthrie, R., 2005, The Nature of Palaeolithic Art, University of Chicago Press, 2005 - Nature - 507 pp. 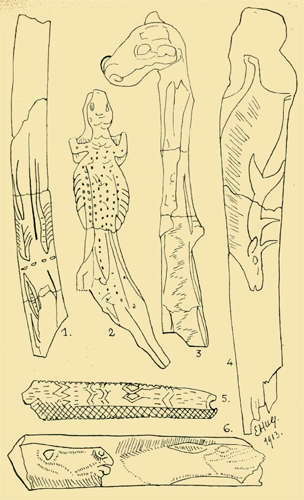 Leroi-Gourhan, A., 1968, The art of prehistoric man in western Europe, London, Thames and Hudson. 543 pp. Maury J., 1914a: Fouilles à Laugerie-Basse Bulletin de la Société préhistorique de France, 1914, tome 11, N. 1. pp. 50-56. Maury J., 1914b: Fouilles de M. A. Le Bel, à Laugerie-Basse Bulletin de la Société préhistorique de France, 1914, tome 11, N. 5. pp. 291-297.
de Mortillet A., 1913: Fouilles de Laugerie-Basse (Dordogne) Bulletin de la Société préhistorique de France, 1913, tome 10, N. 10. pp. 571-574. Raoul D., 1972: Note sur l'outillage lithique magdalénien du grand abri des Marseilles, à Laugerie-Basse, Les Eyzies (Dordogne) [Fouilles A. de Mortillet, 1913], Bulletin de la Société préhistorique française, Comptes rendus des séances mensuelles. 1972, tome 69, N. 3. pp. 73-79. Roussot A., 2000: Visiter les Abris de Laugerie-Basse, Editions Sud-Ouest..